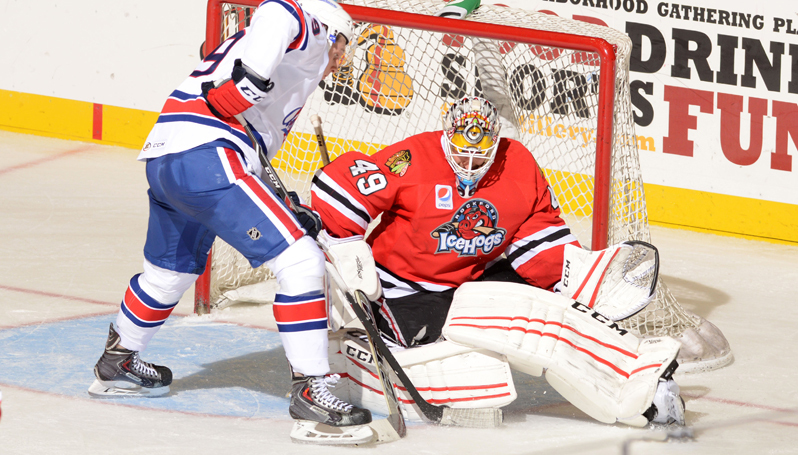 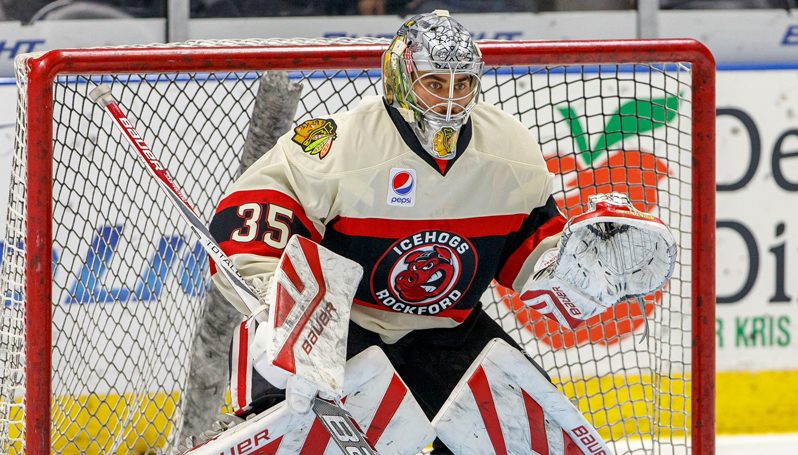 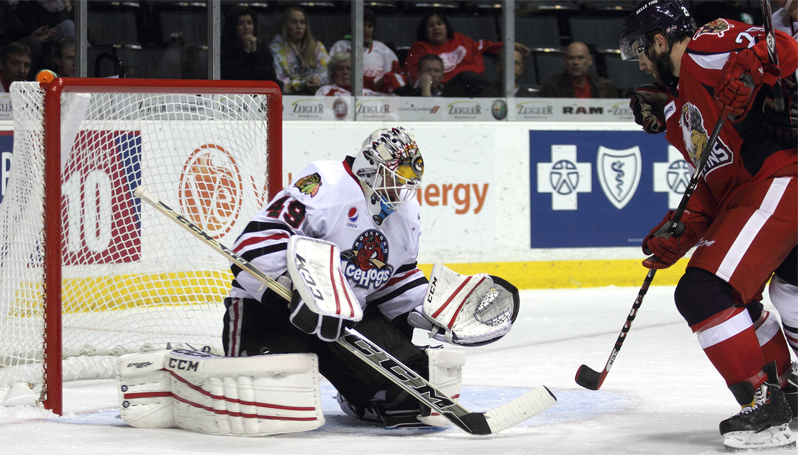 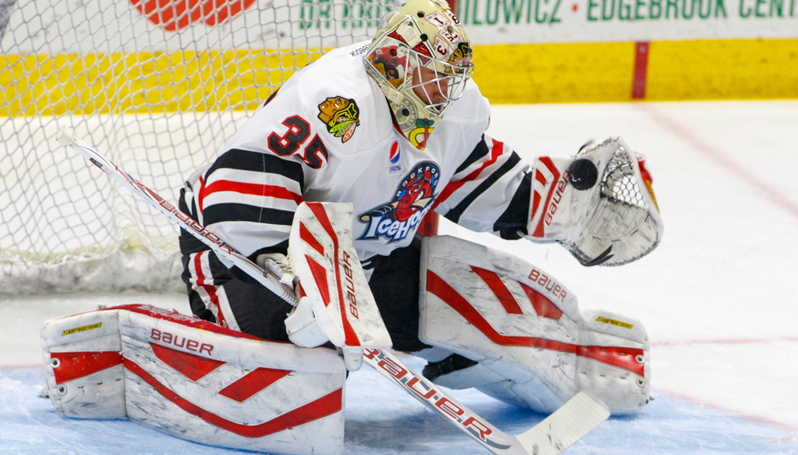 Goalie rejoins Rockford after starting three straight games in Chicago. 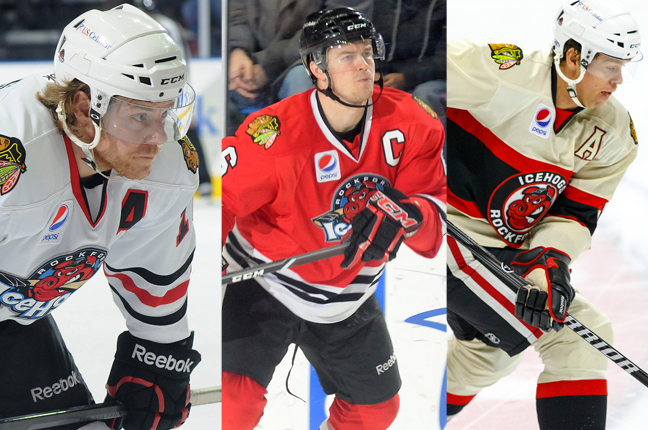 Team announces captain and four alternates. 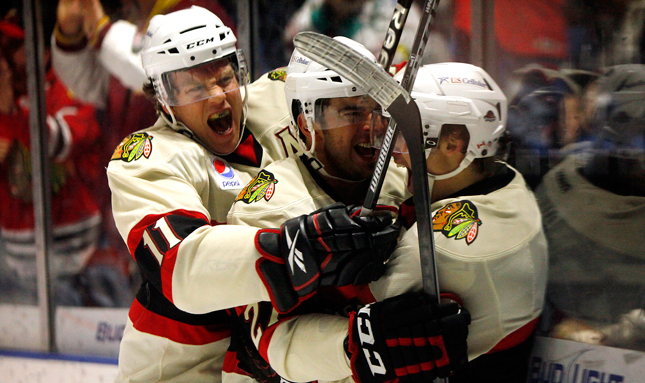 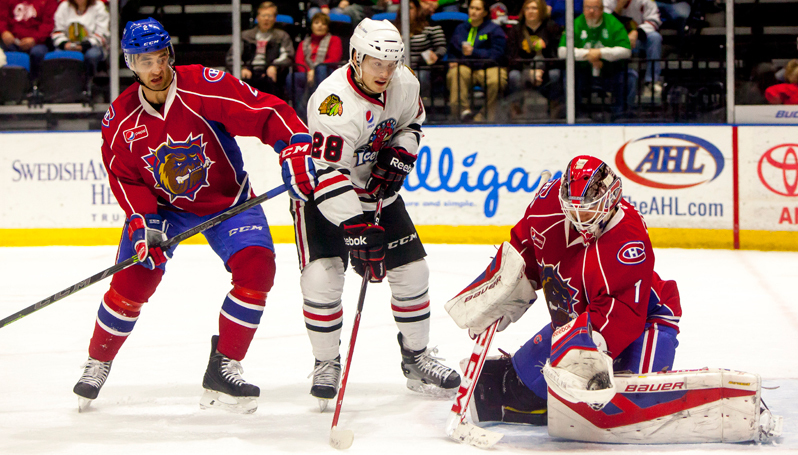 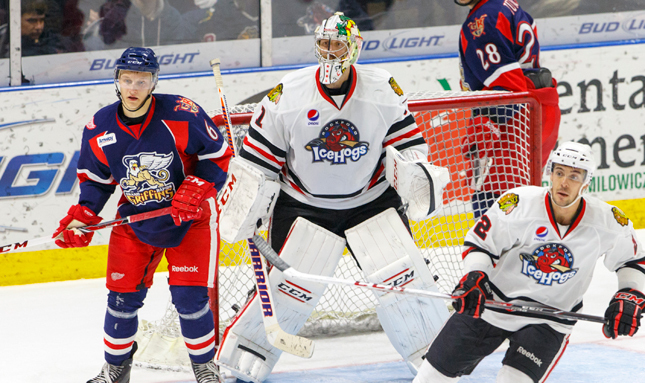 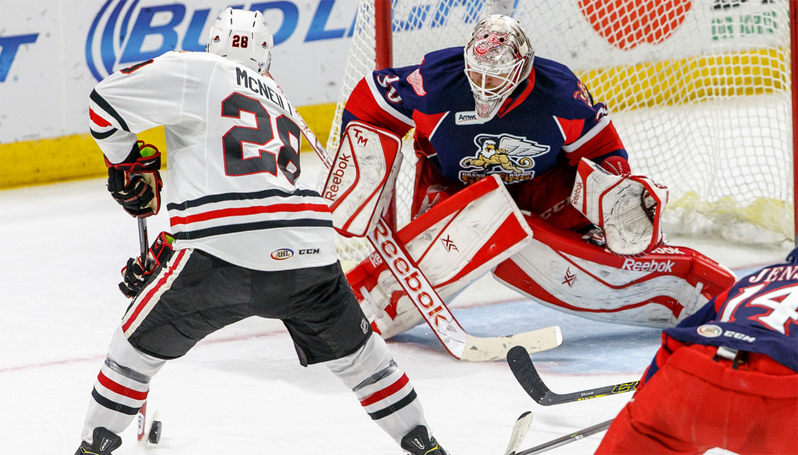 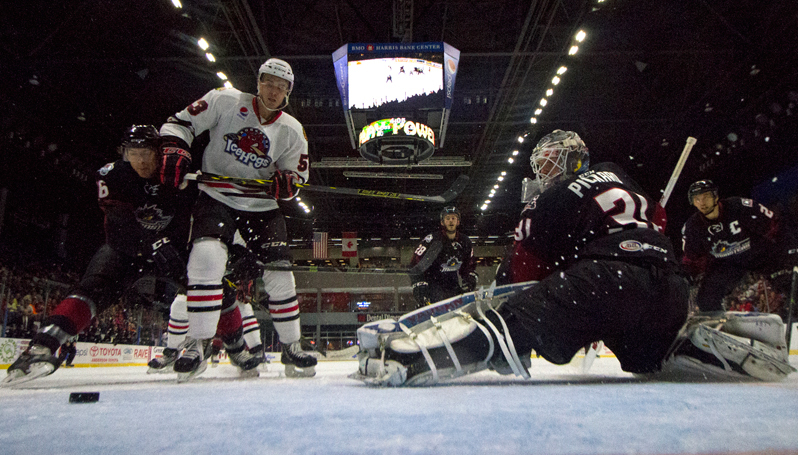 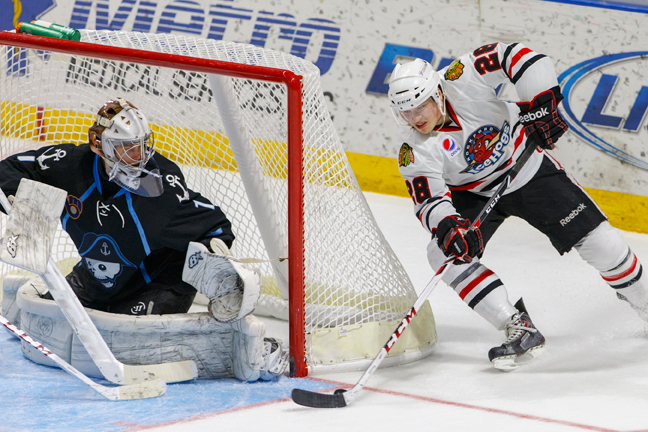 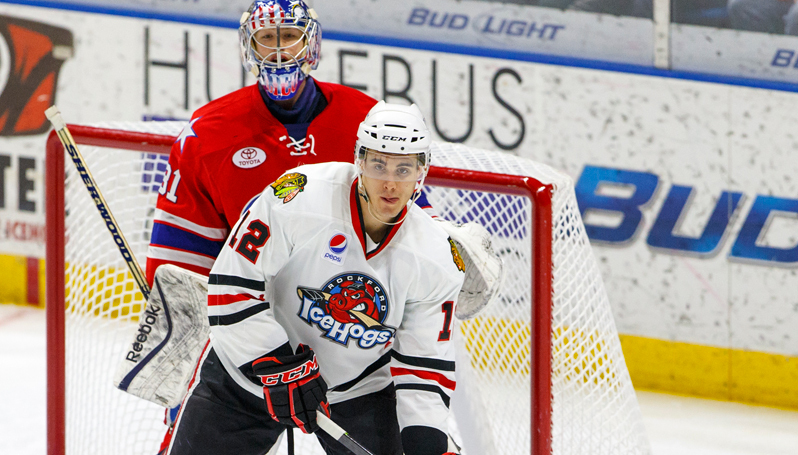 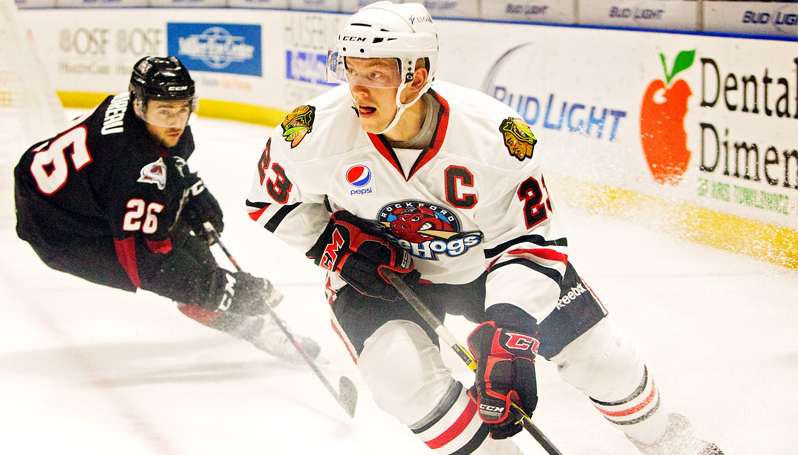 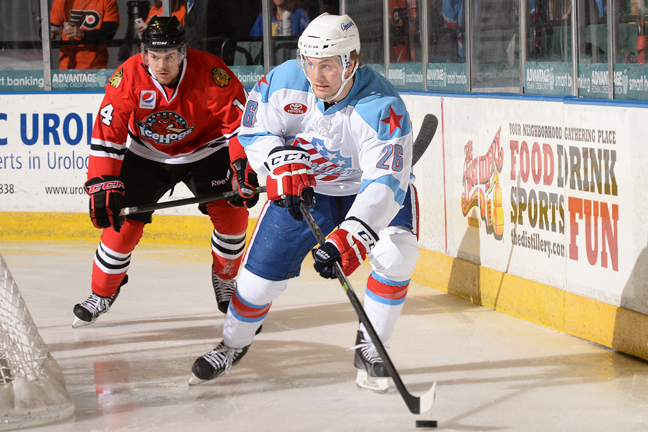 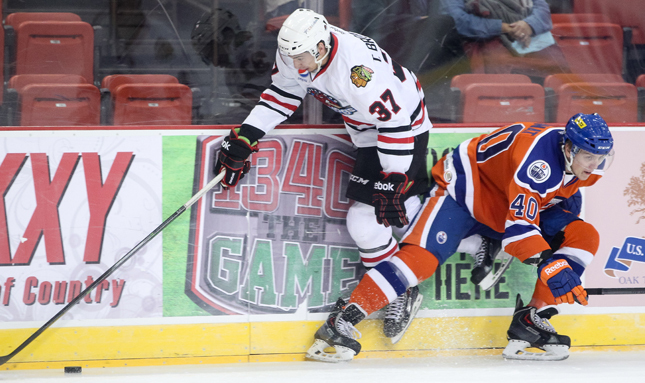 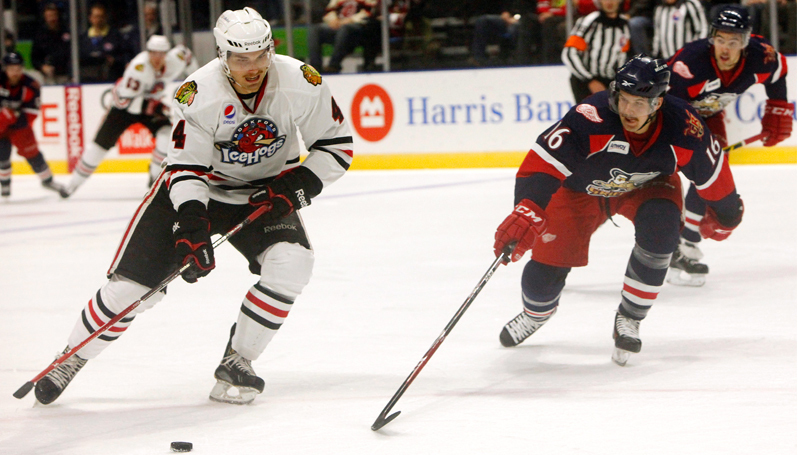 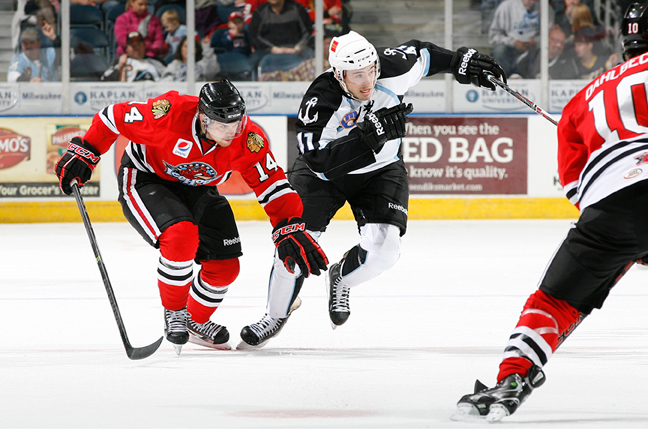 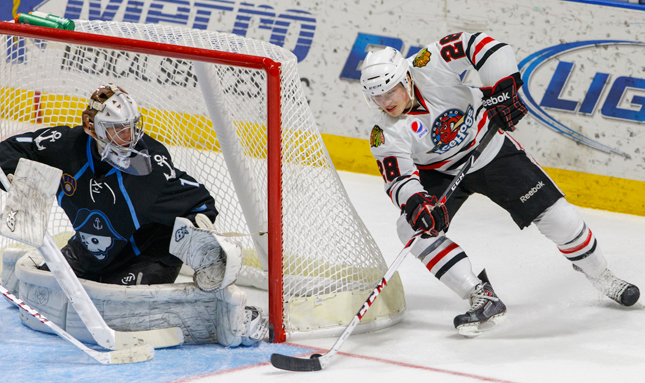 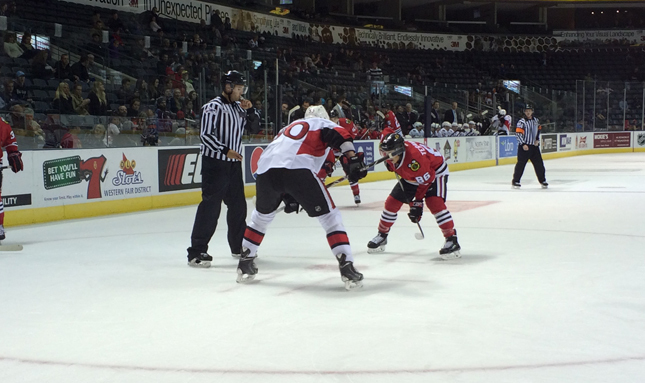 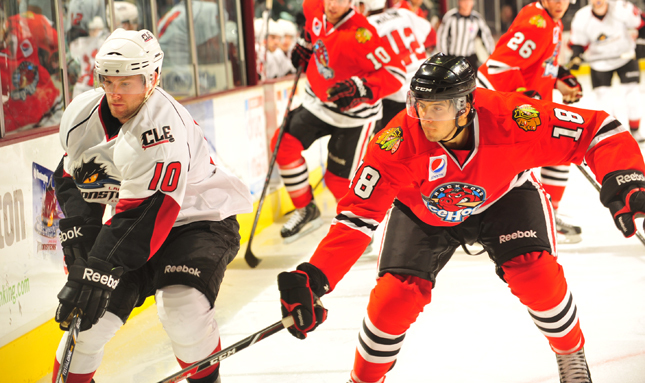 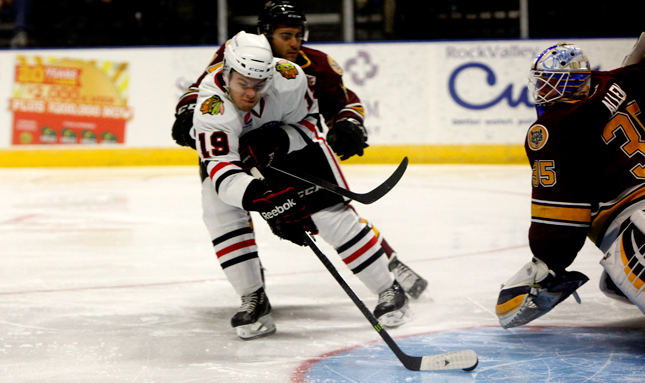 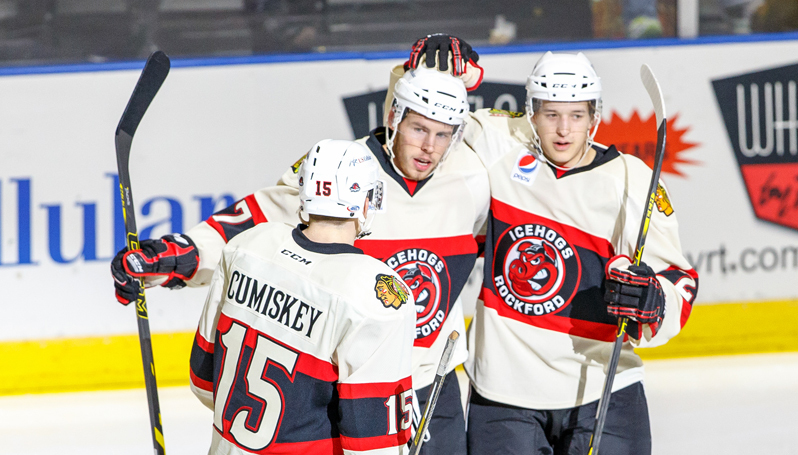 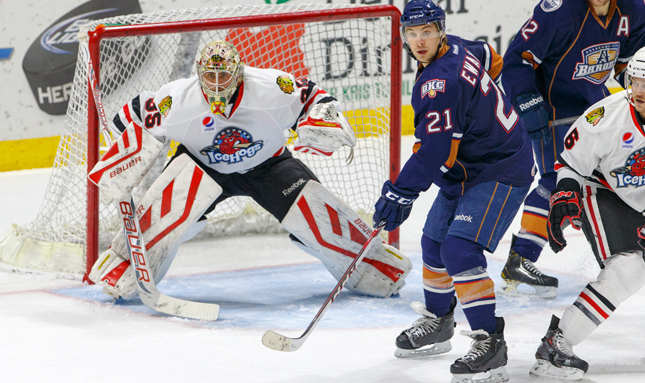 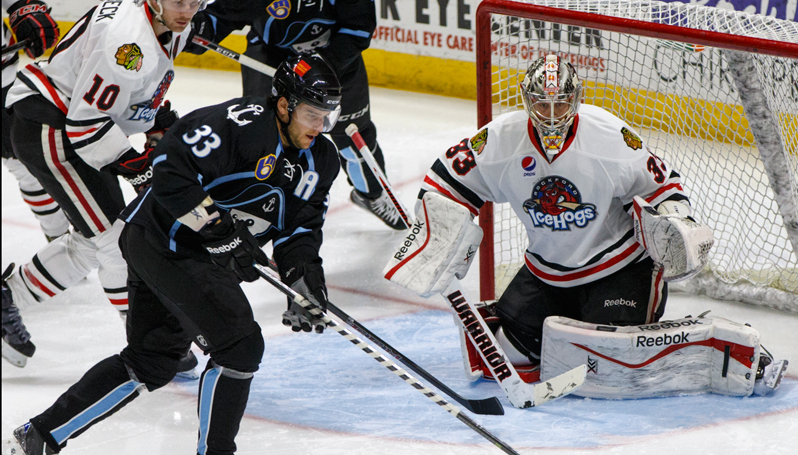 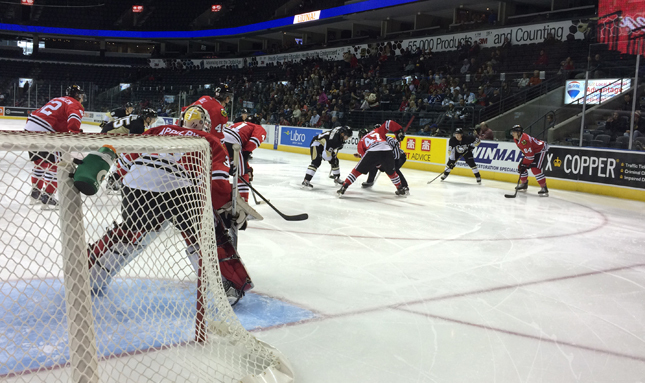 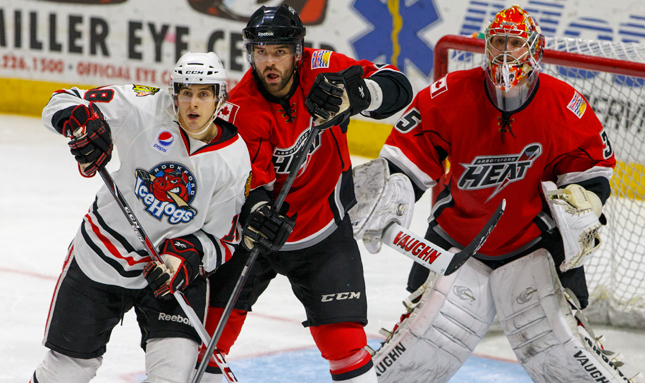 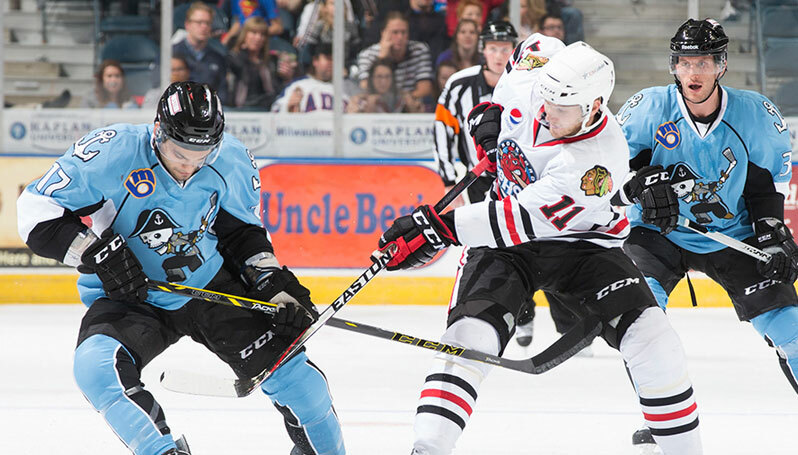 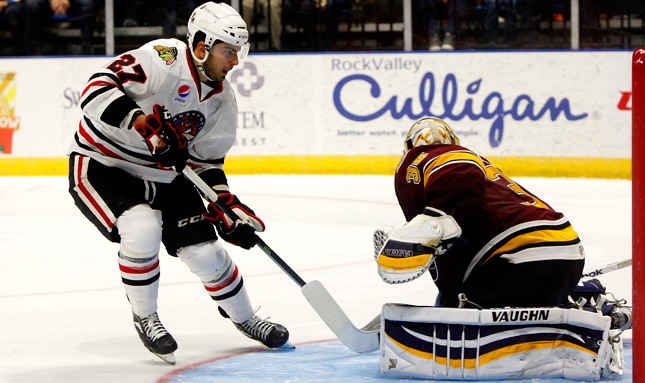 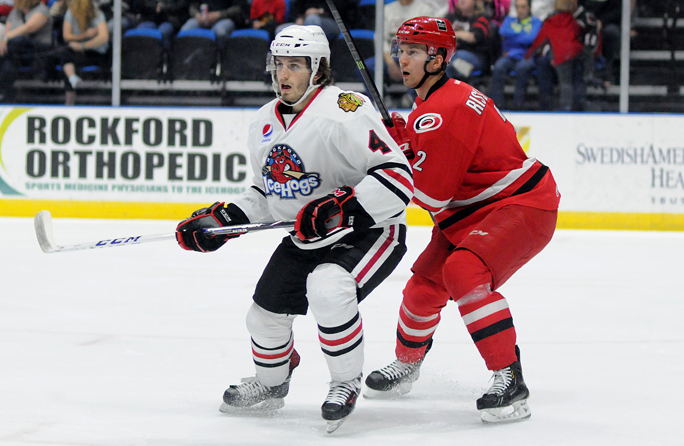 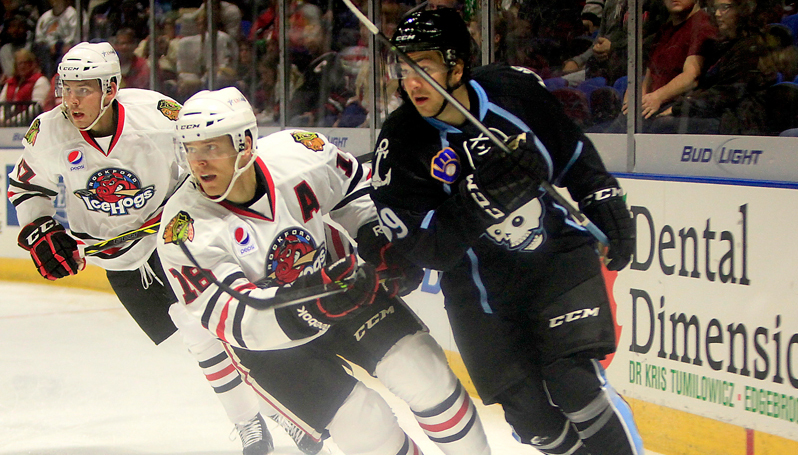 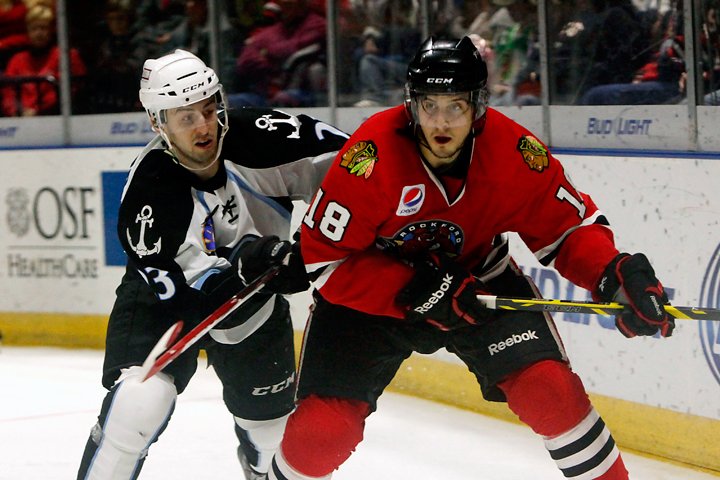 IceHogs tally three goals in final period to earn win. 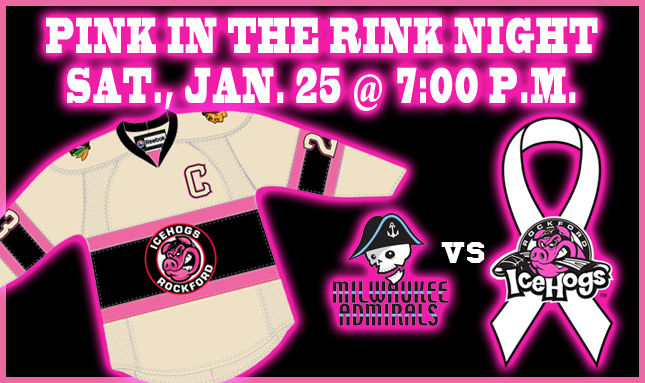 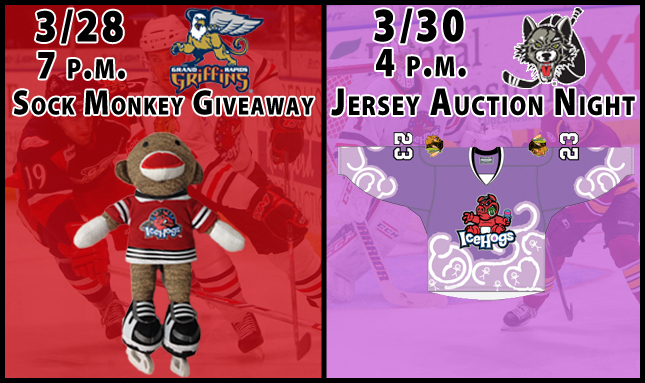 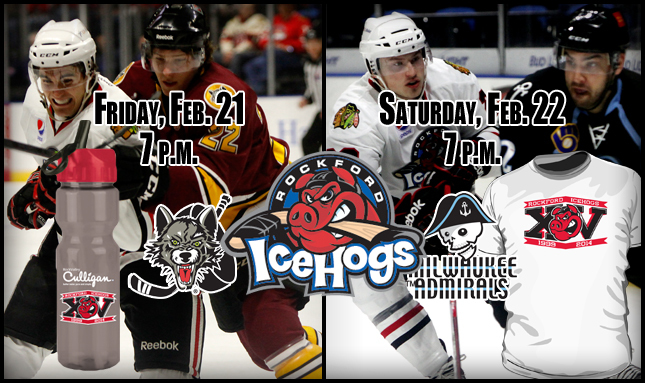 The IceHogs are back at the BMO for a pair of games this weekend. 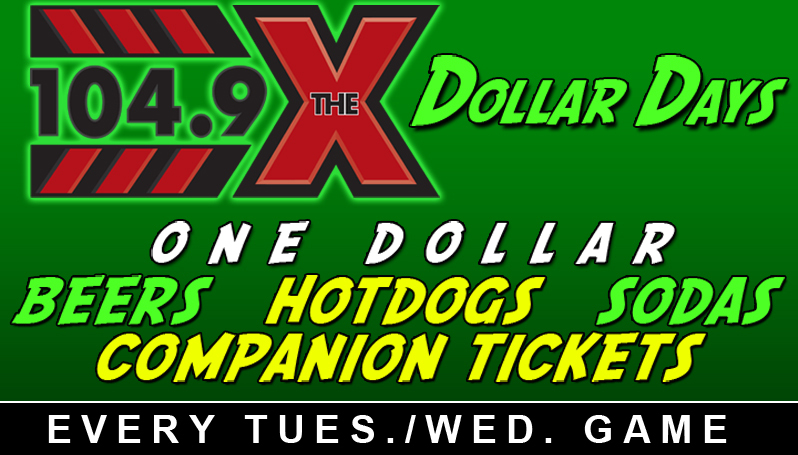 Fans can enjoy dollar day seven times throughout the season. 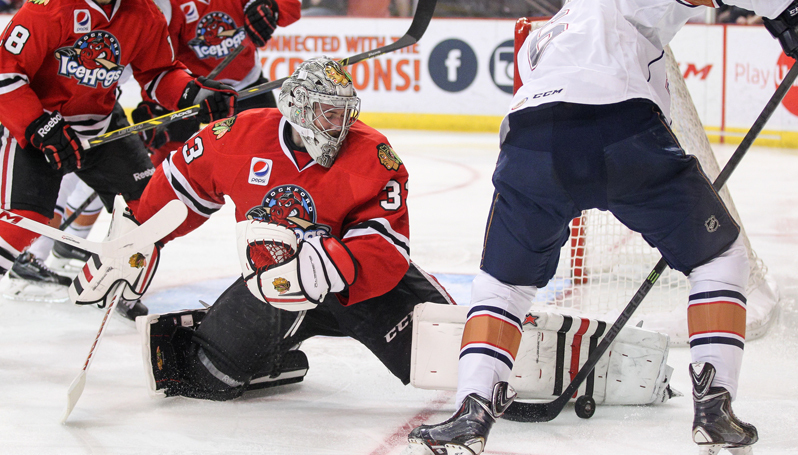 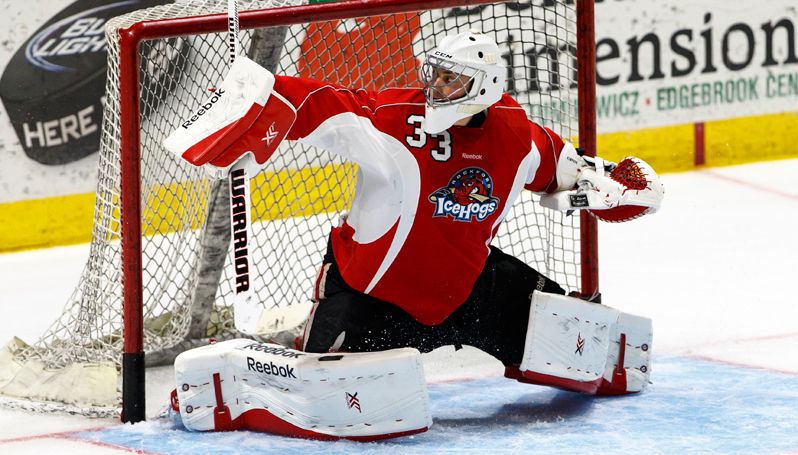 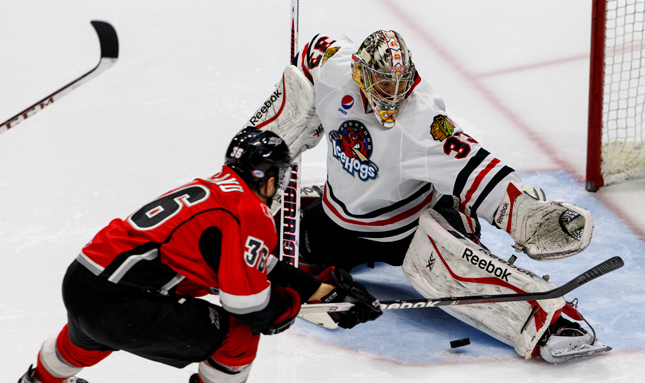 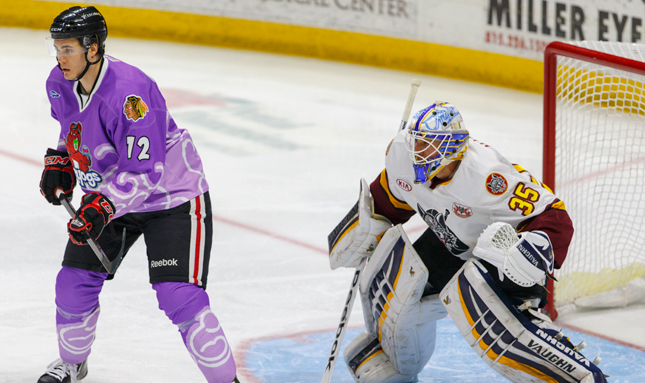 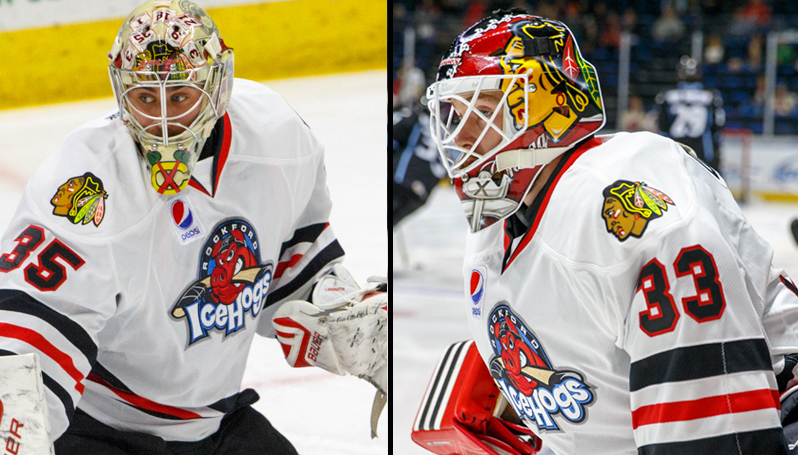 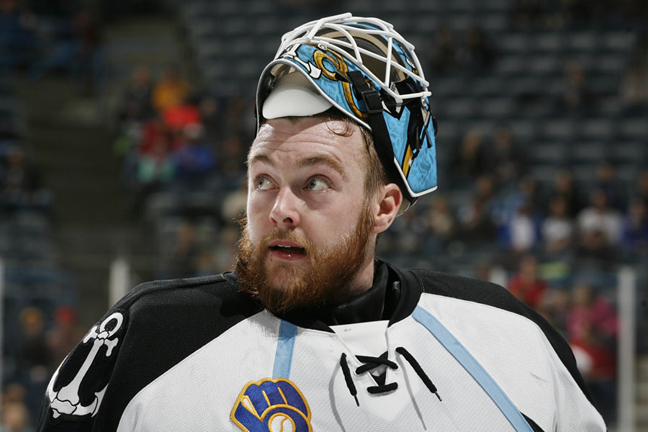 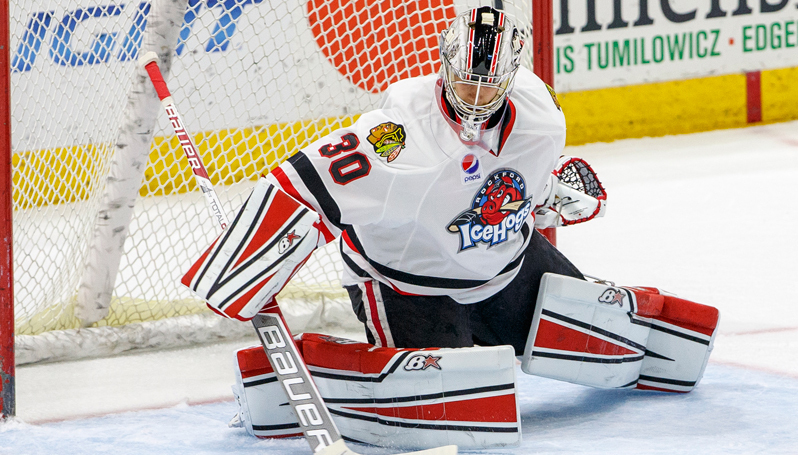 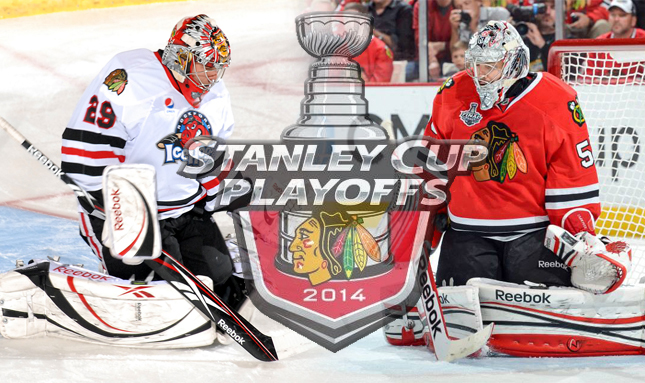 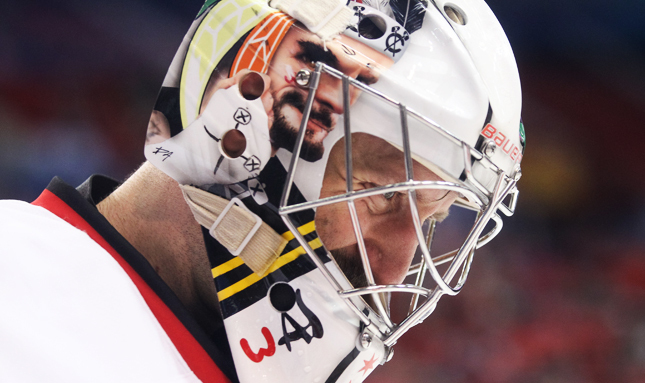 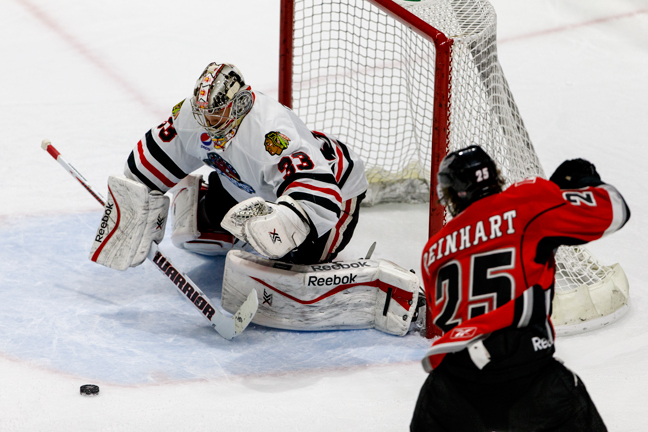 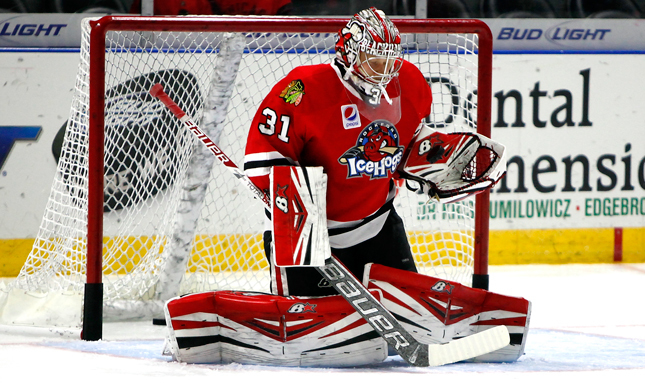 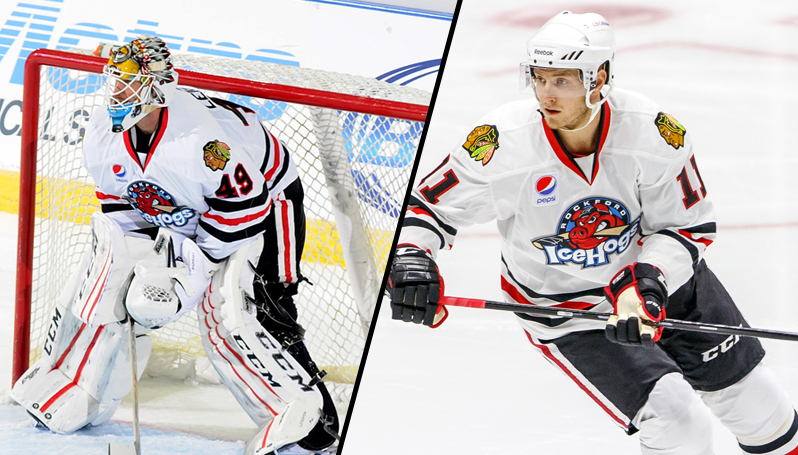 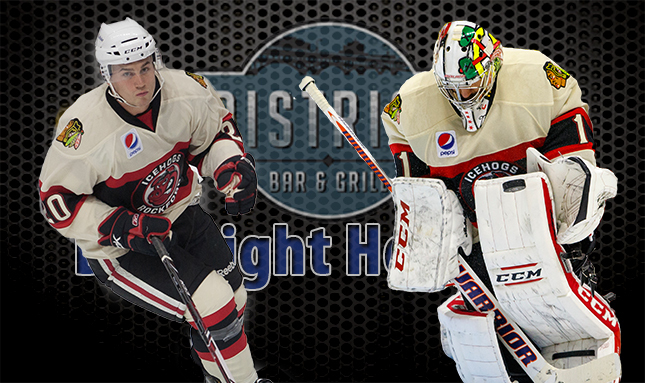 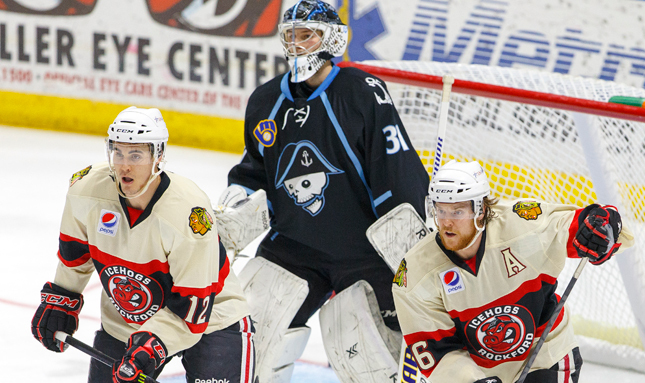 Goaltender Scott Darling heads to Chicago while Mac Carruth joins IceHogs in Rochester. 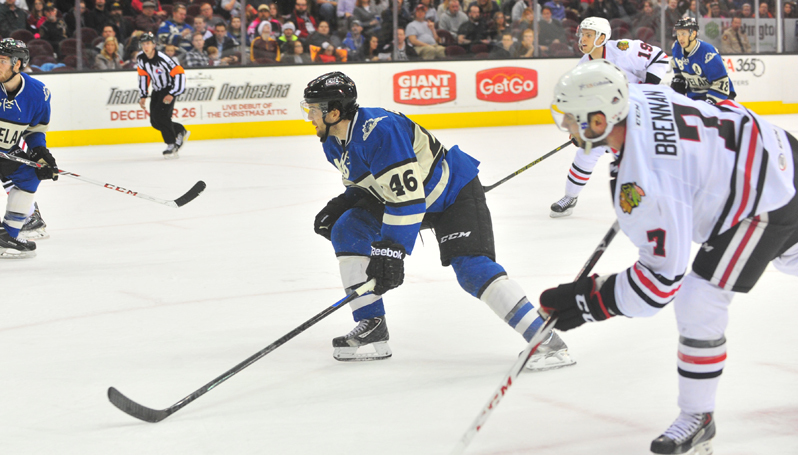 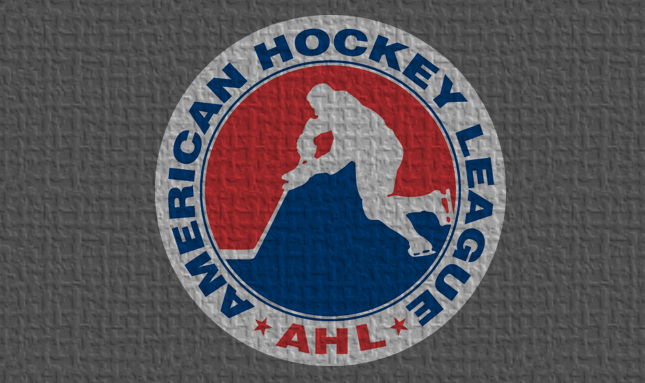 AHL puts the thrill back into overtime with new rules. 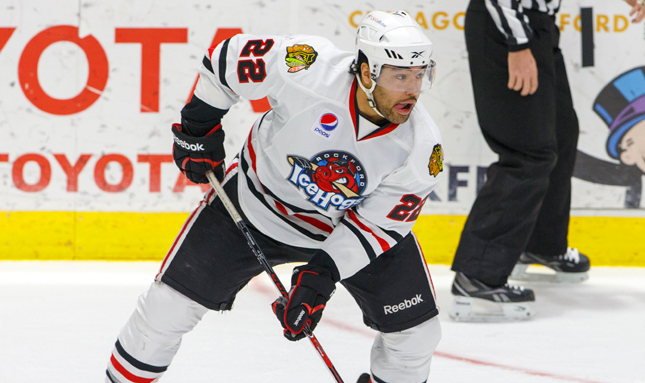 Veteran defender joins deep Rockford blue line. 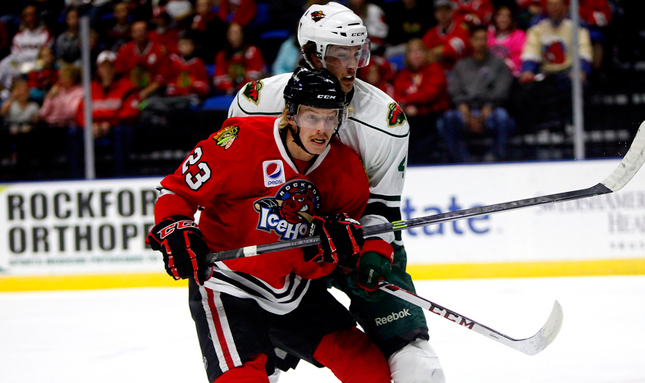 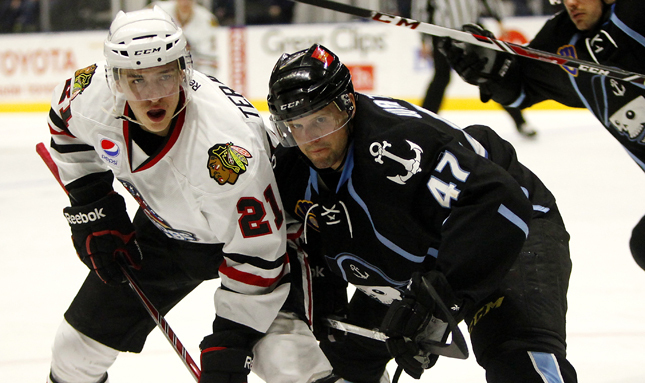 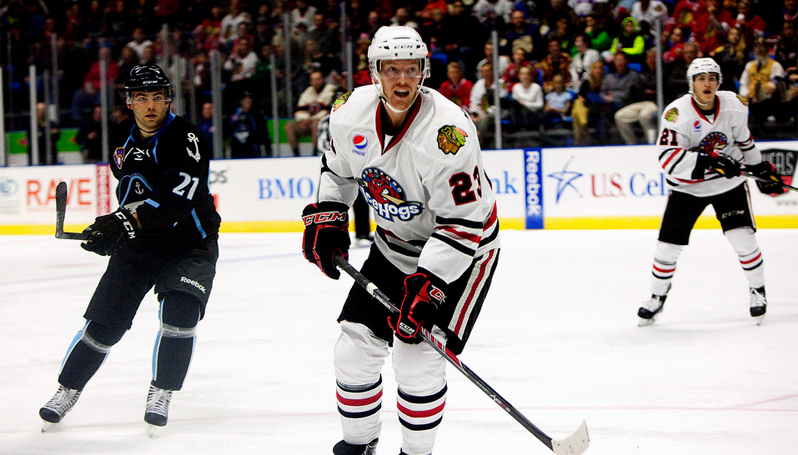 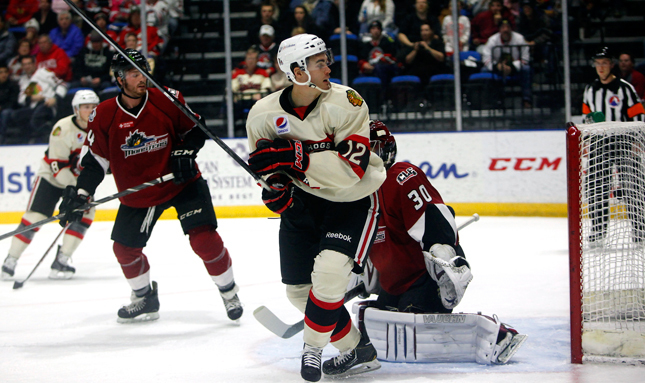 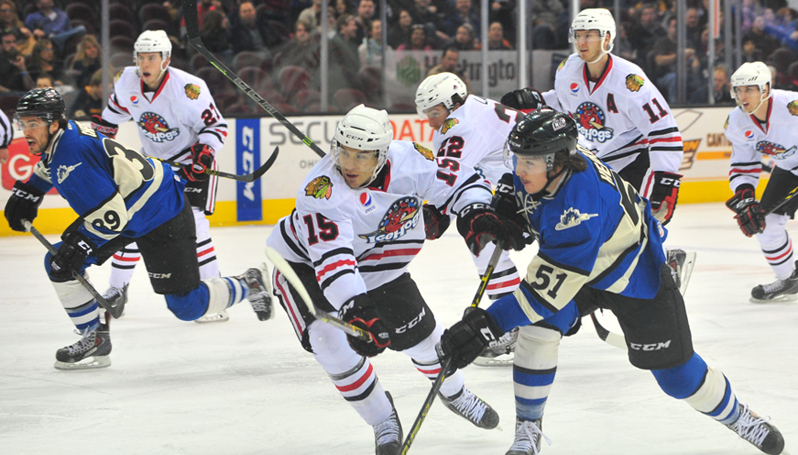 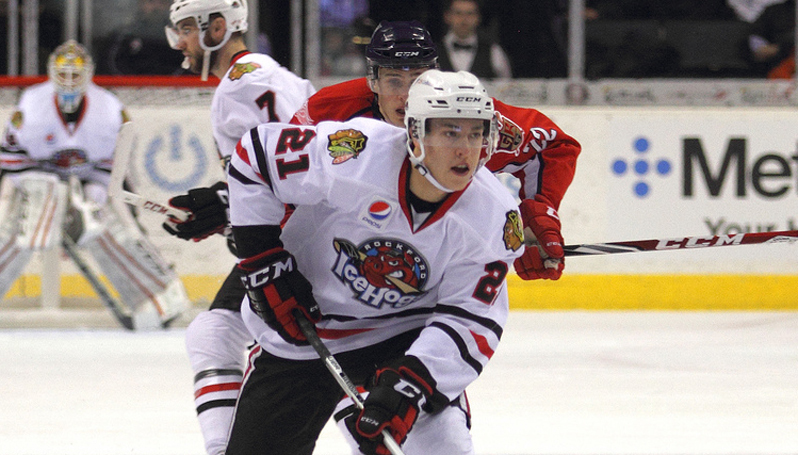 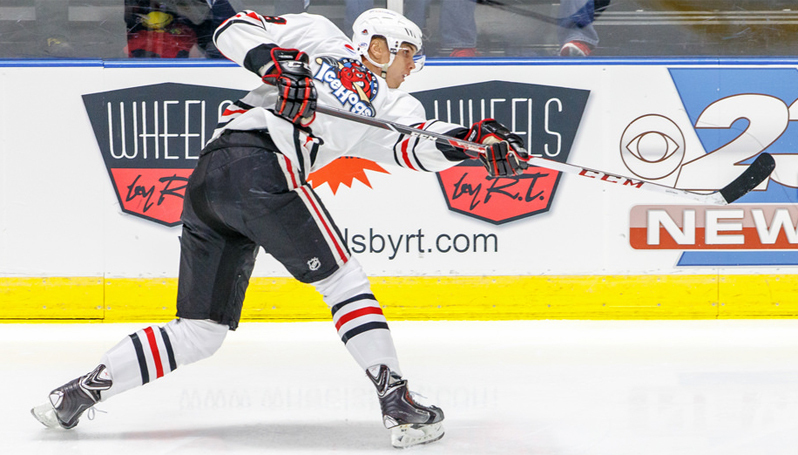 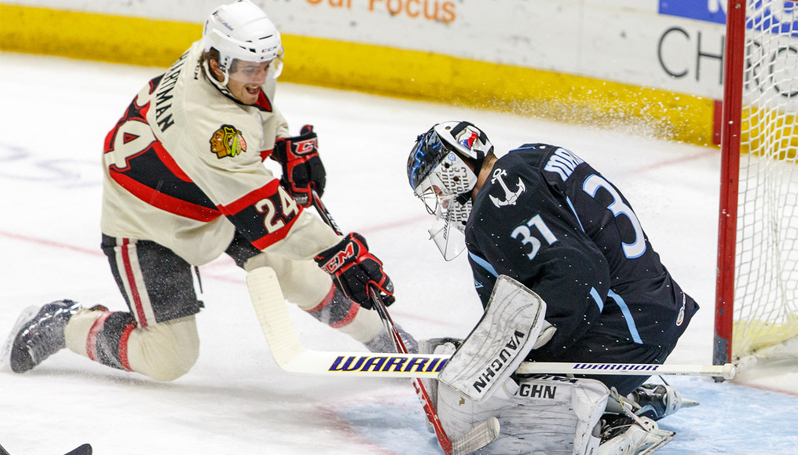 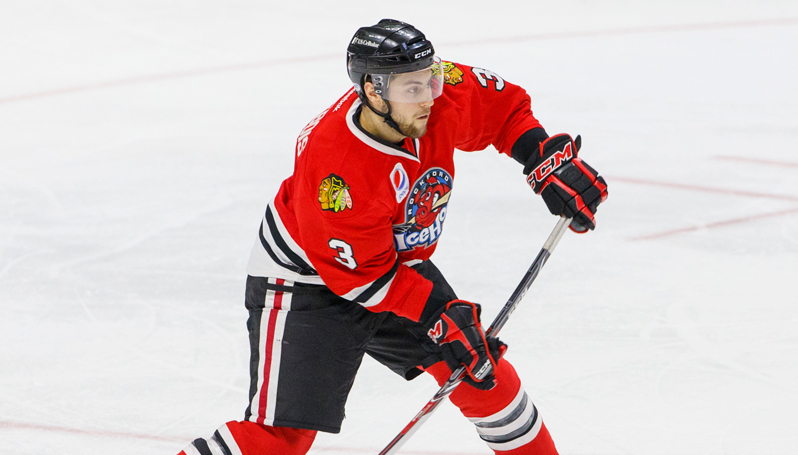 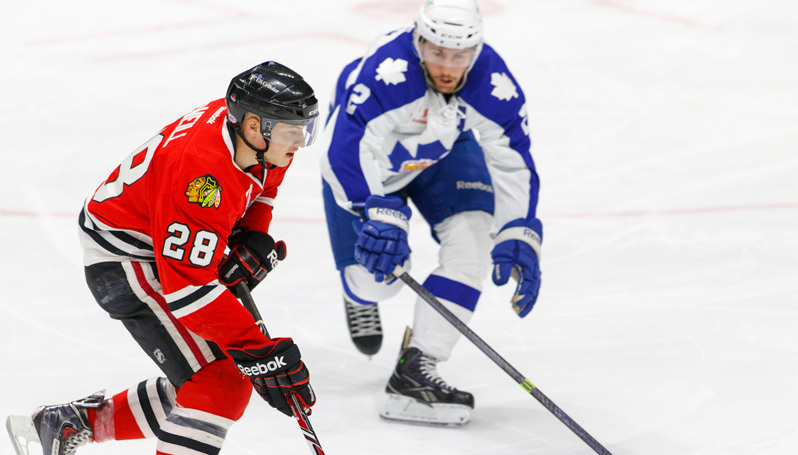 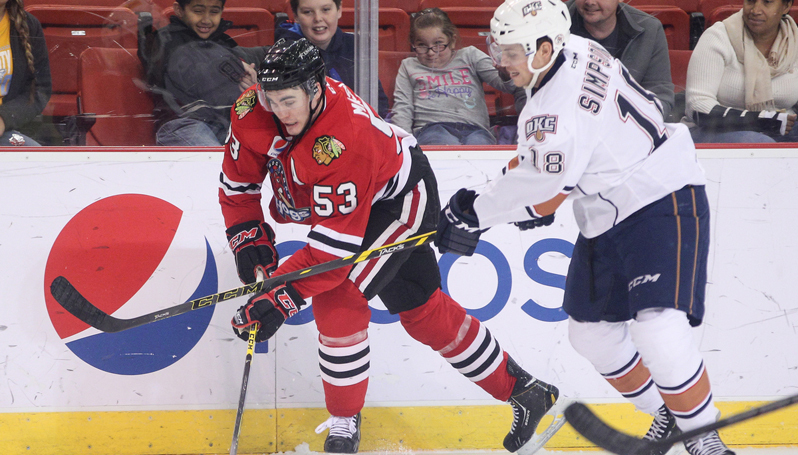 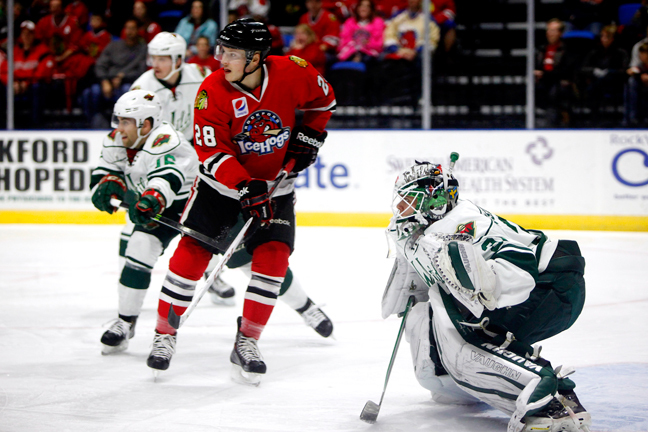 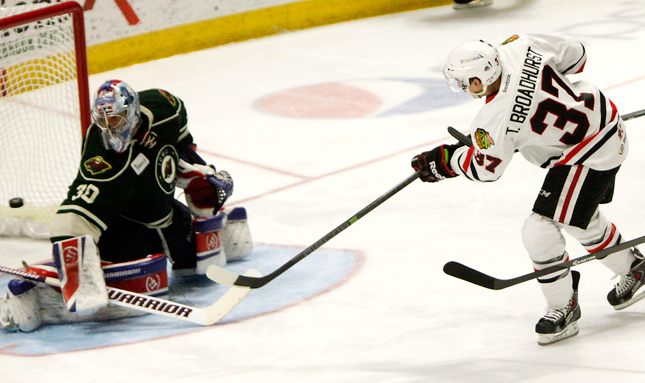 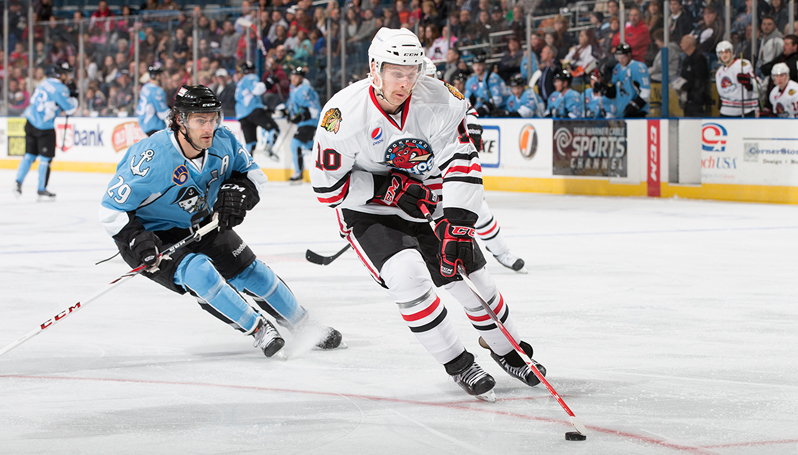 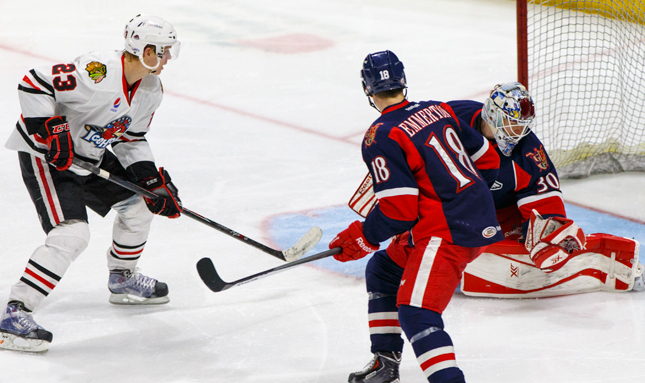 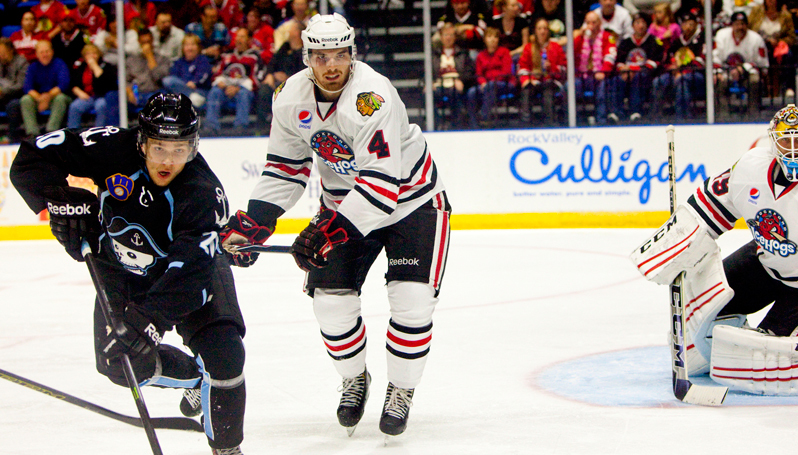 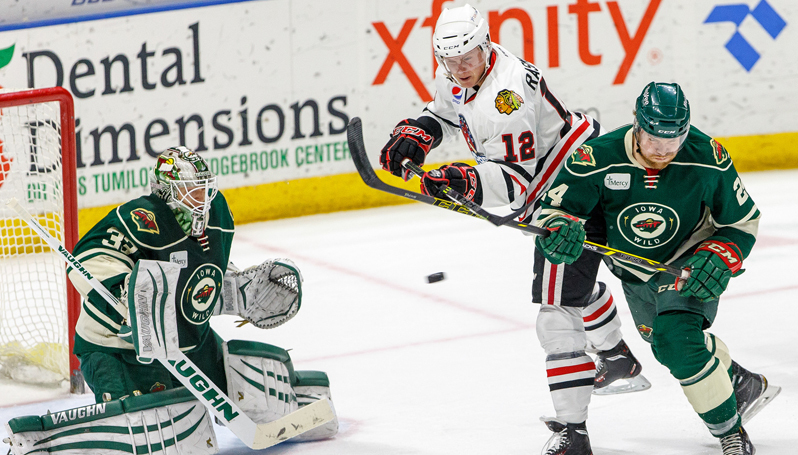 Third period tally lifts Milwaukee over IceHogs in season opener. 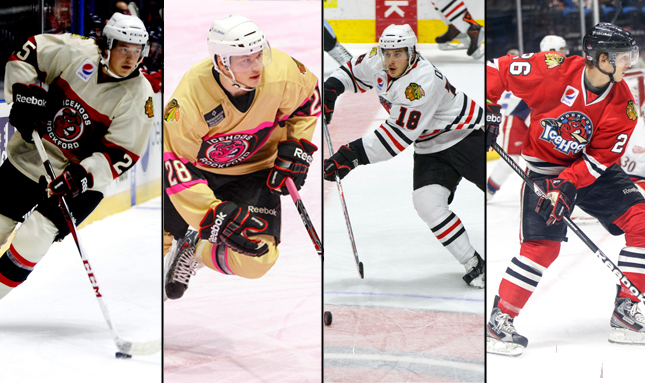 13 skaters return to the IceHogs lineup from a season ago. 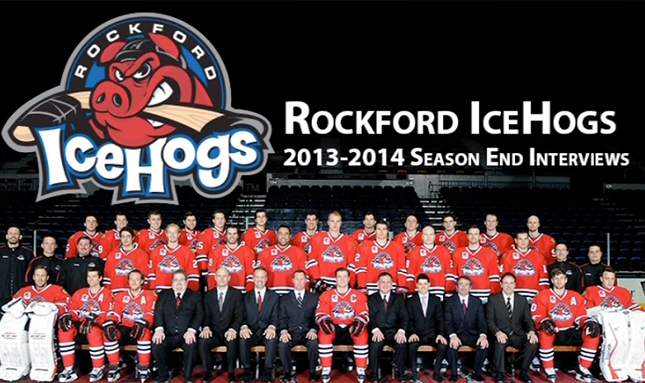 Rockford’s roster cut to 24 players. 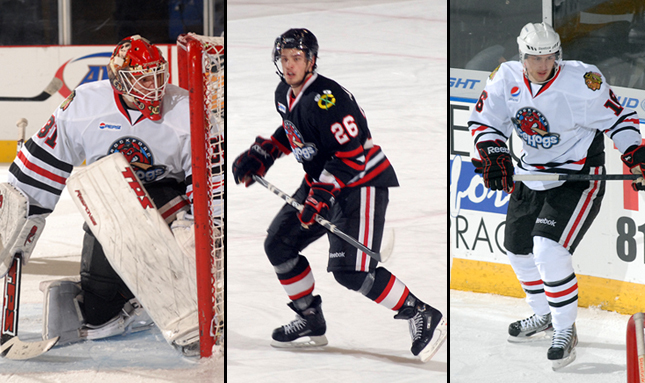 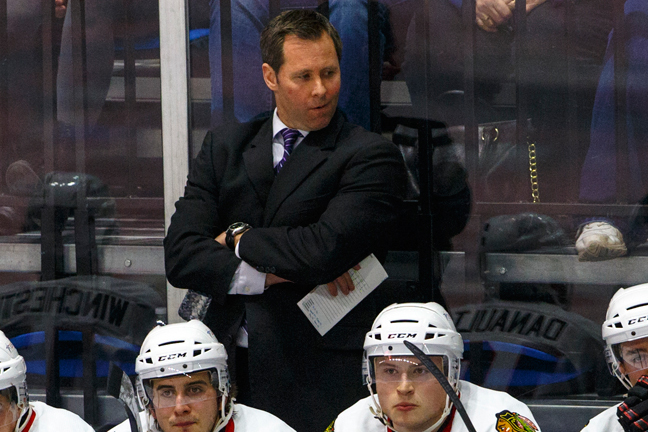 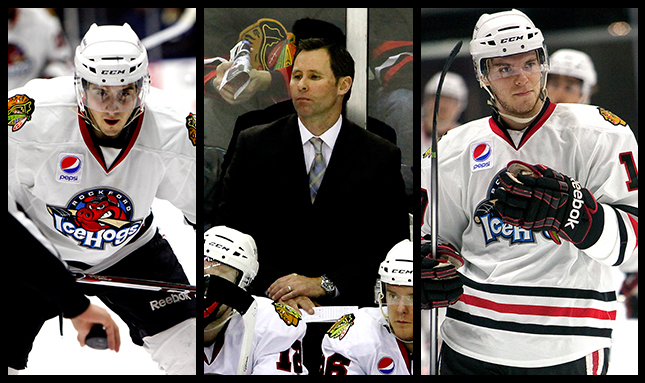 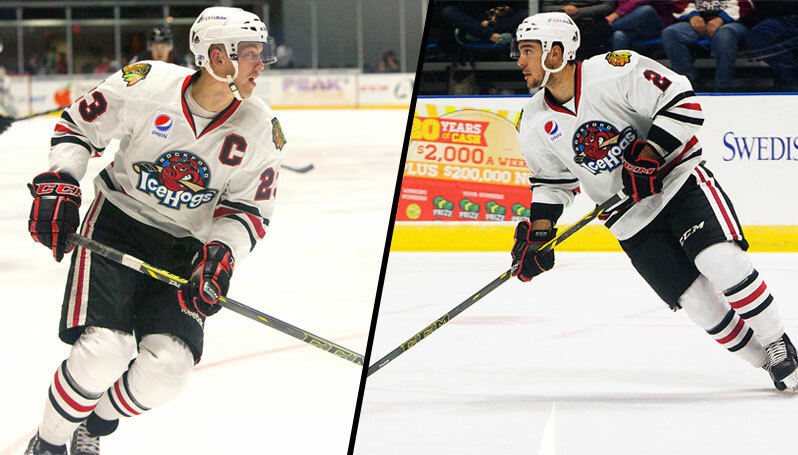 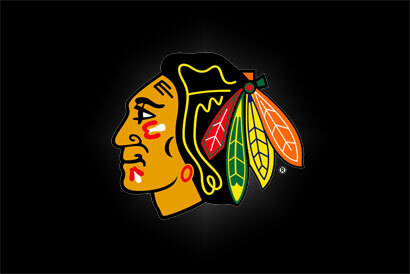 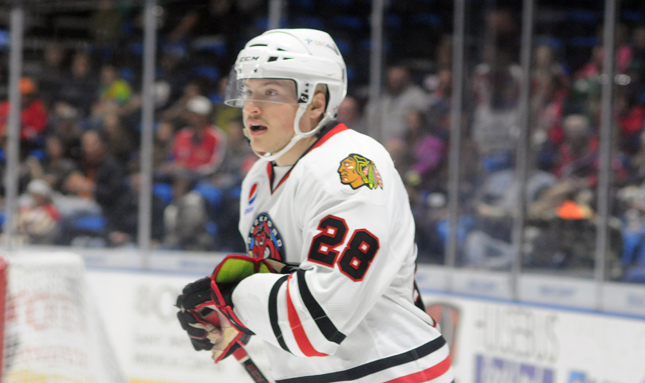 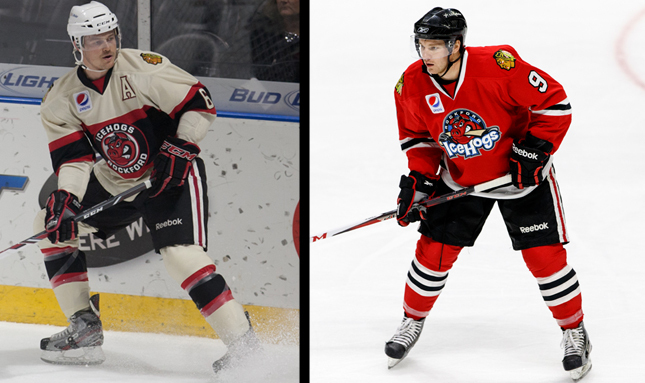 Blackhawks assign two more to Rockford. 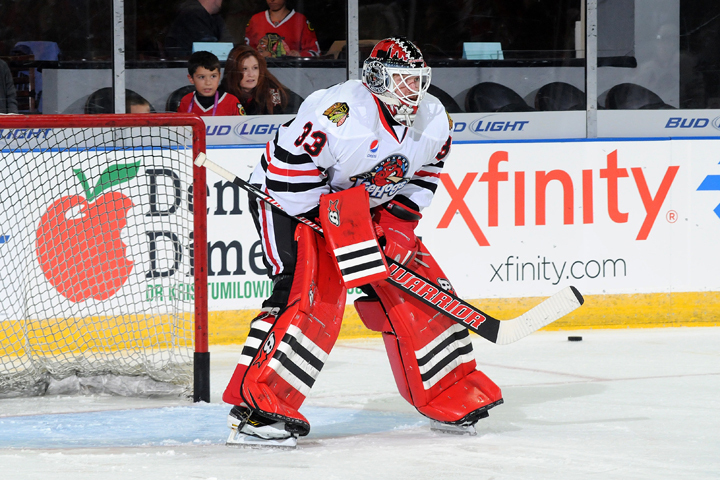 Blackhawks complete trade with Islanders, including goaltender Kent Simpson. 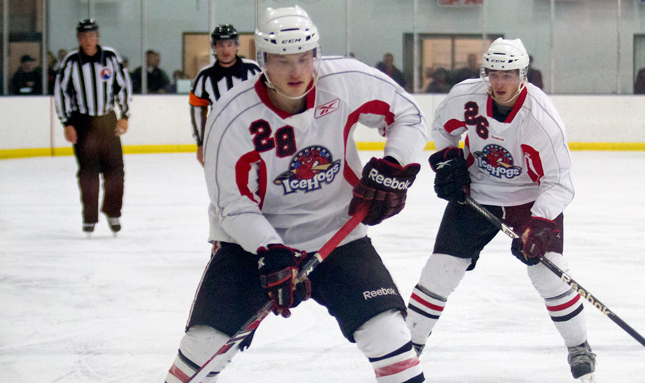 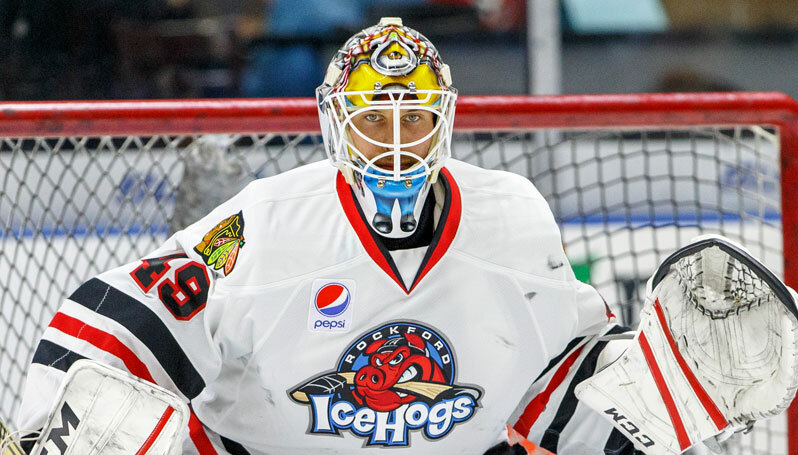 Pair joins IceHogs training camp from Chicago. 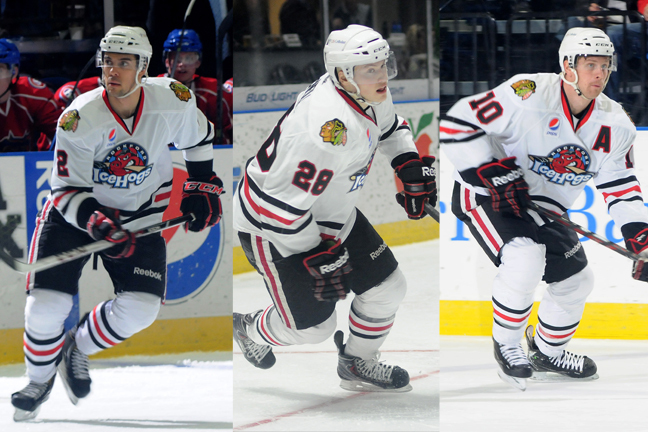 14 skaters released from IceHogs camp. 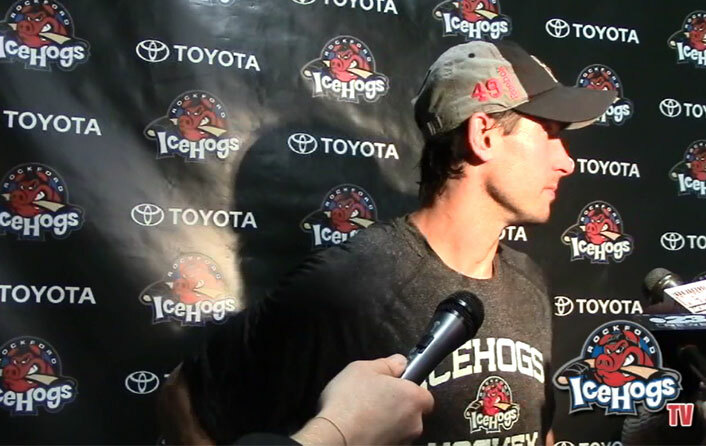 Hogs conclude exhibition slate with a 3-1 loss. 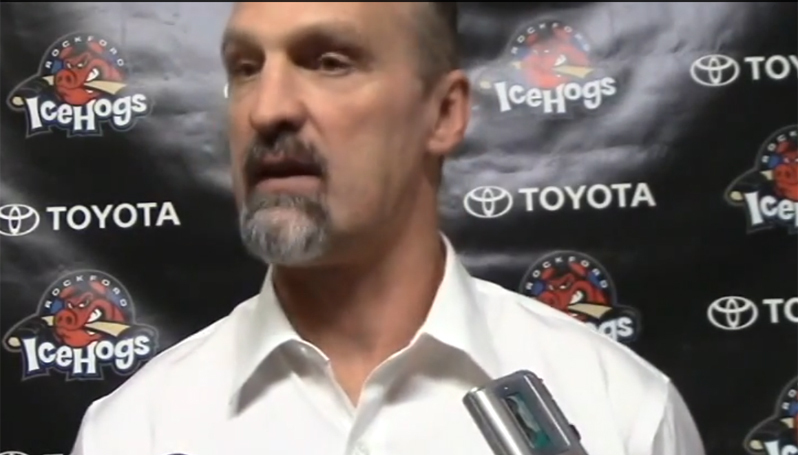 Hogs training camp roster stands at 34 players. 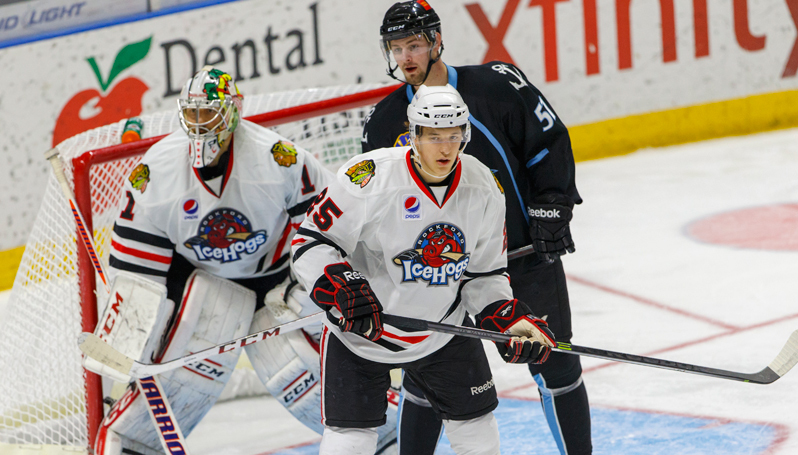 IceHogs training camp roster now stands at 35 players. 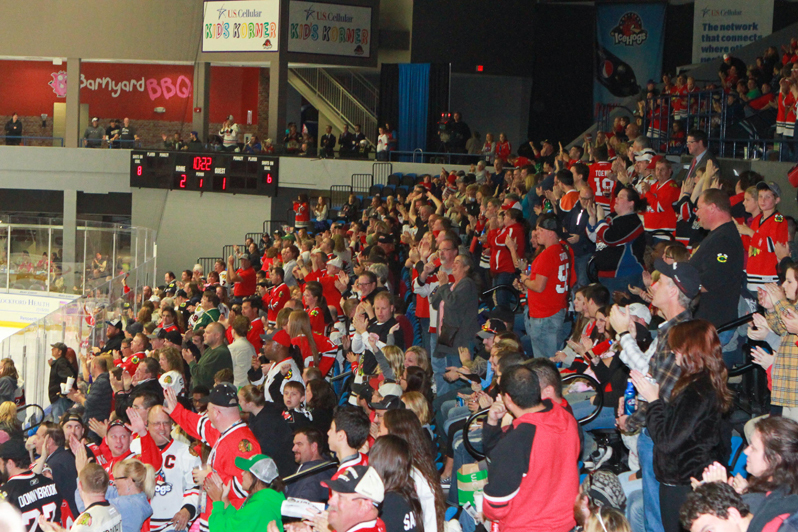 Admission to Thursday's game is free for all fans. 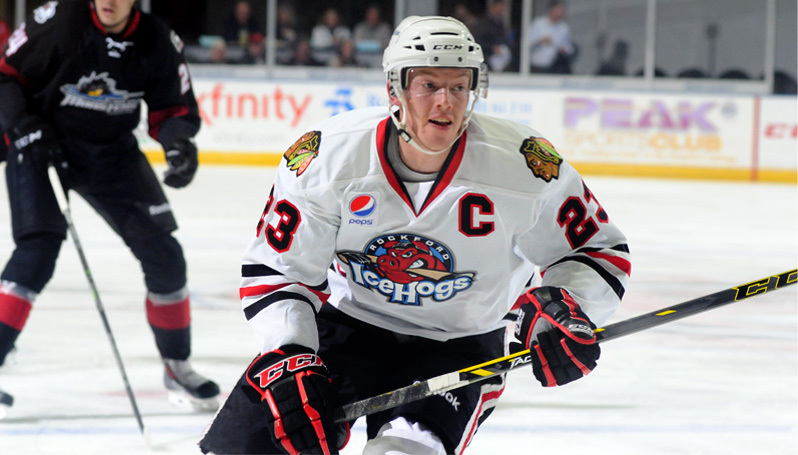 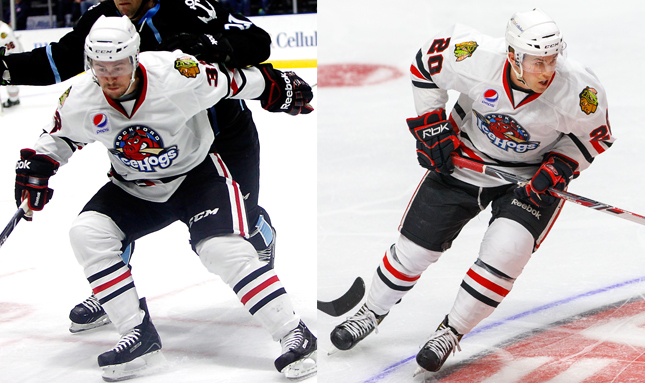 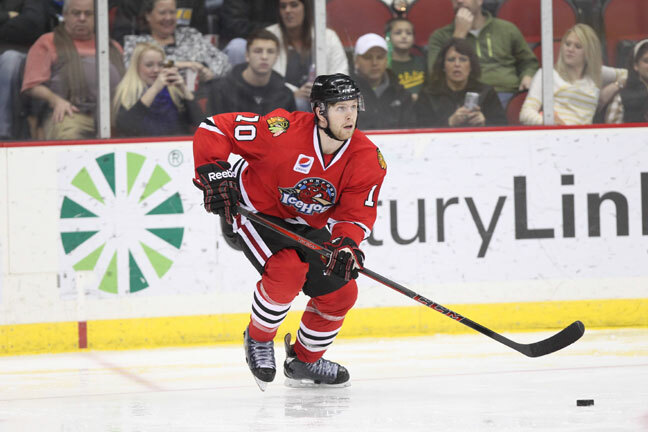 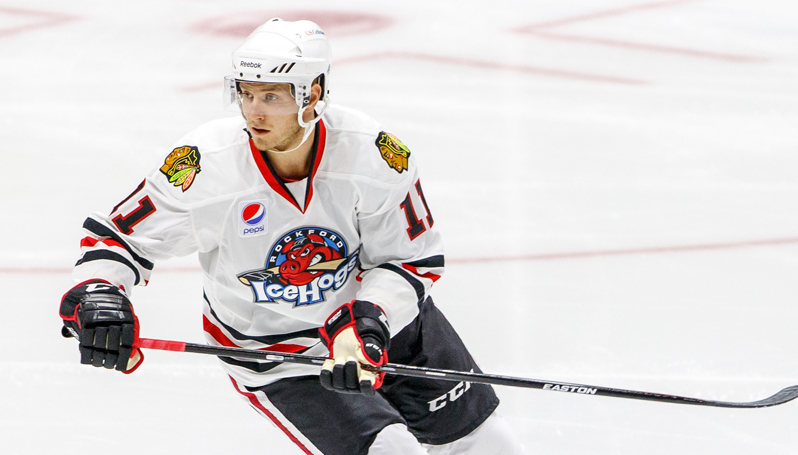 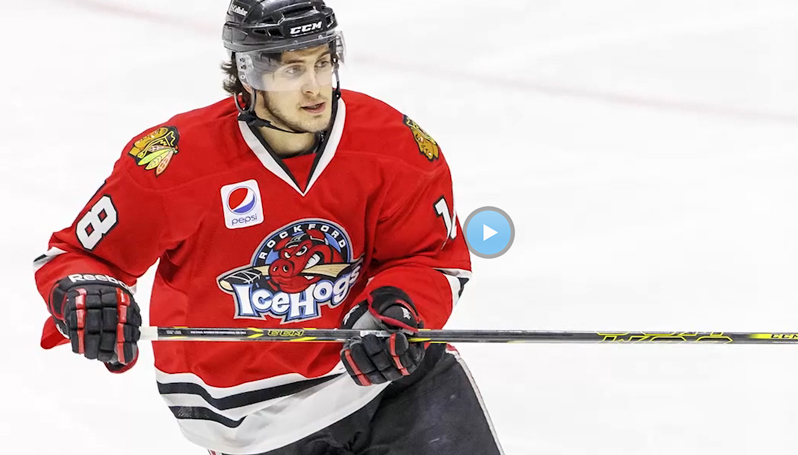 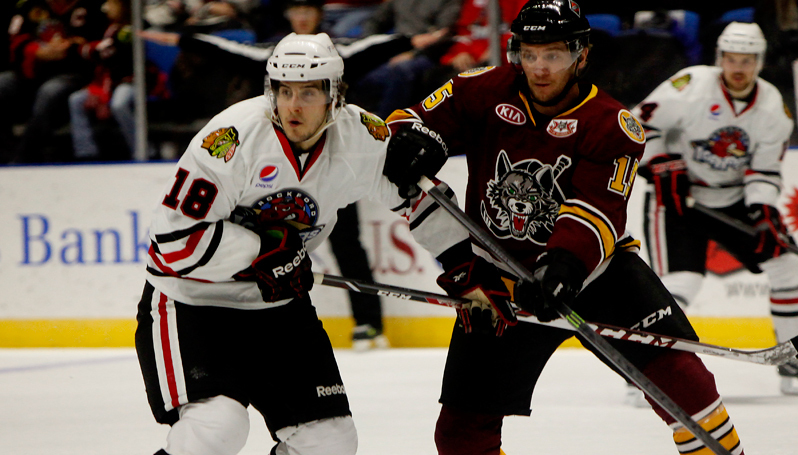 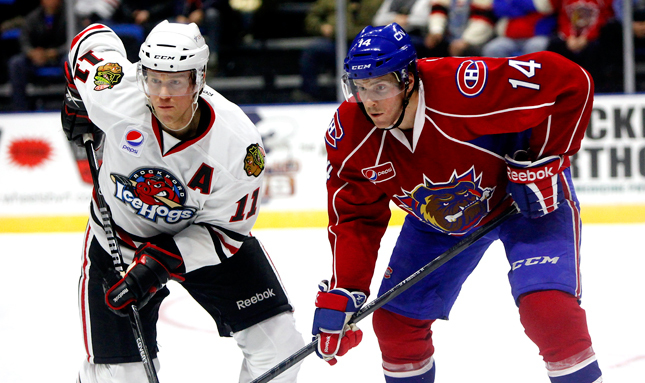 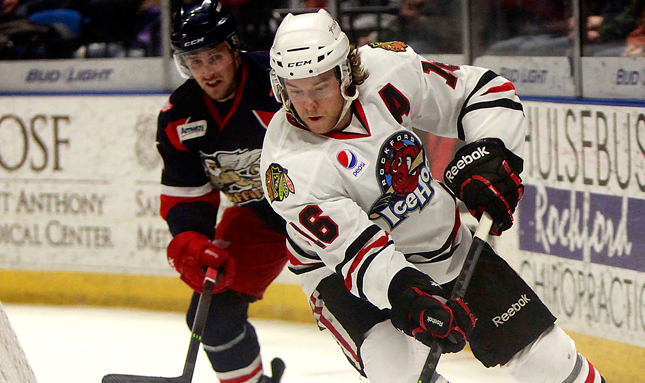 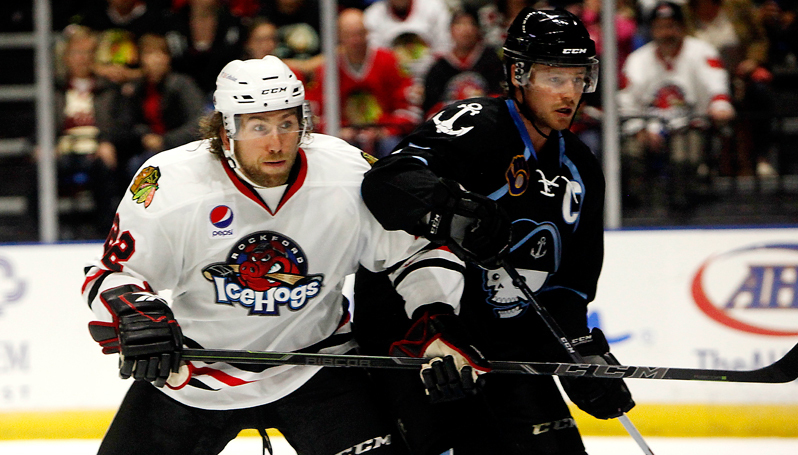 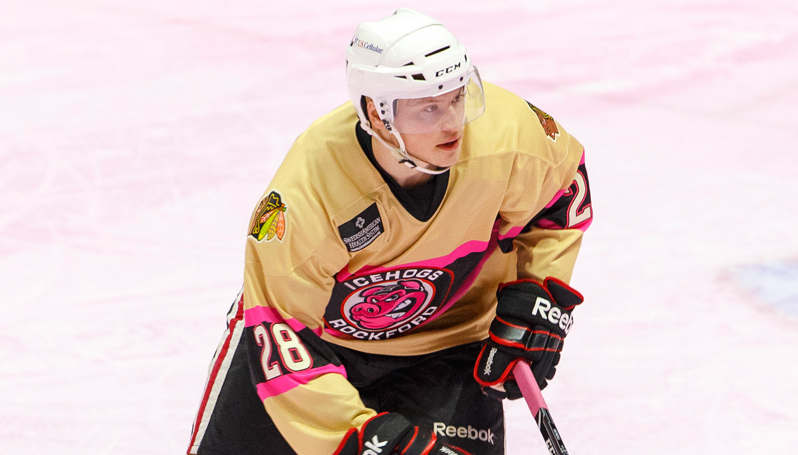 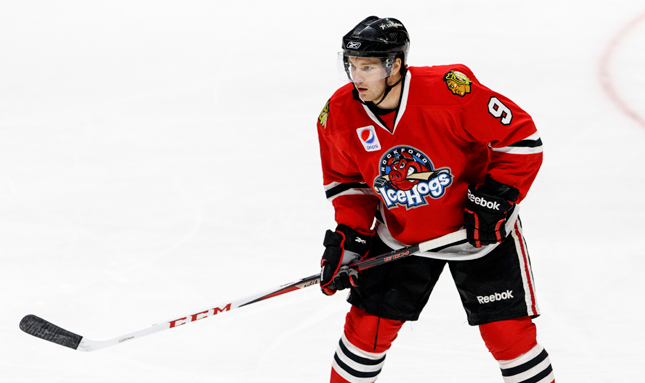 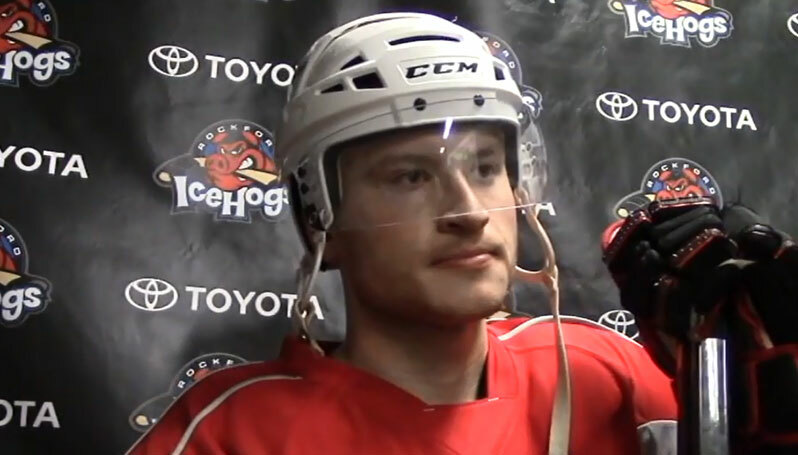 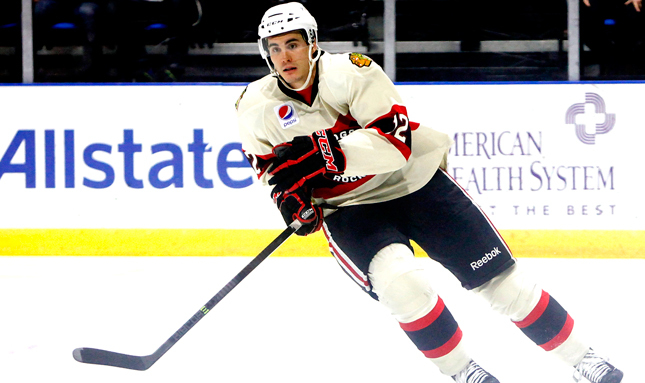 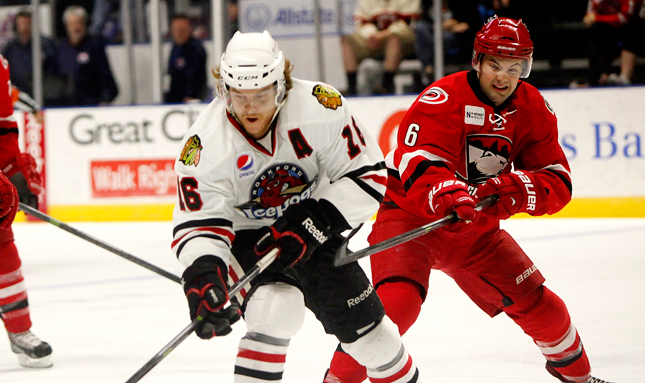 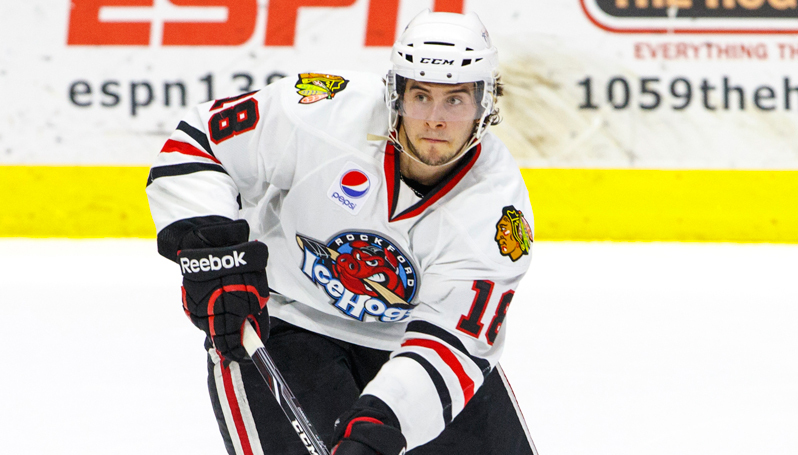 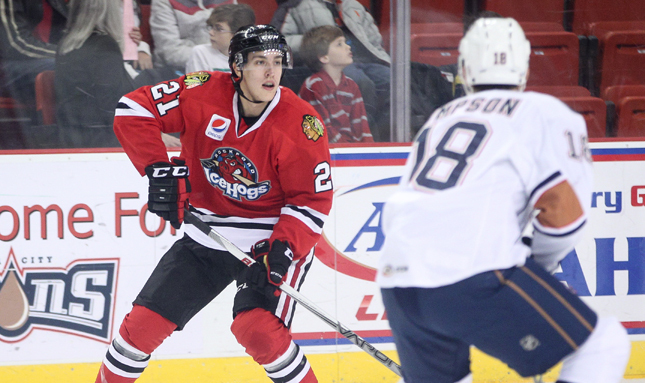 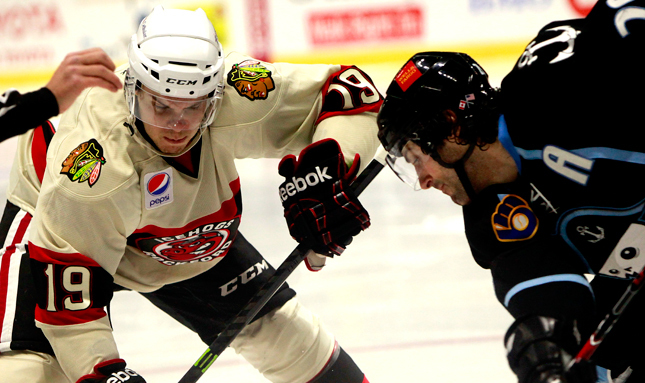 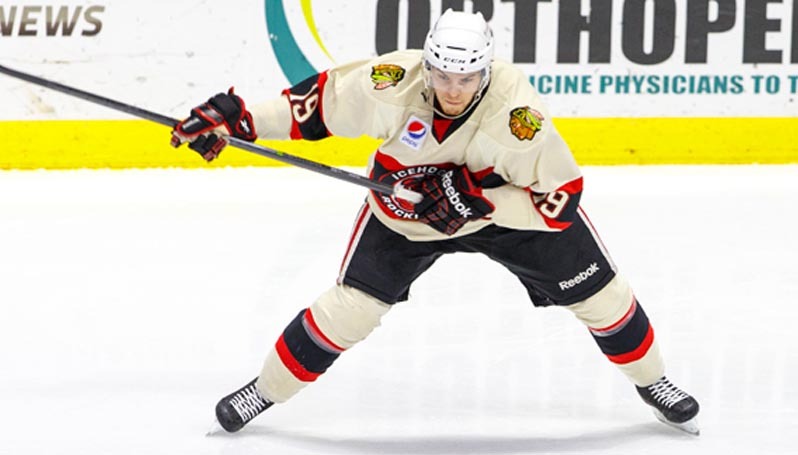 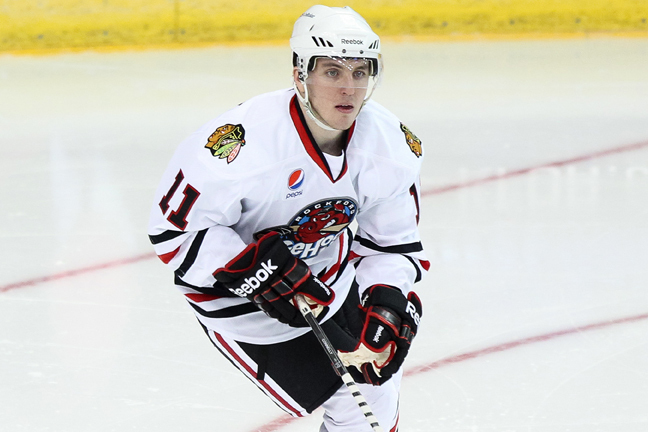 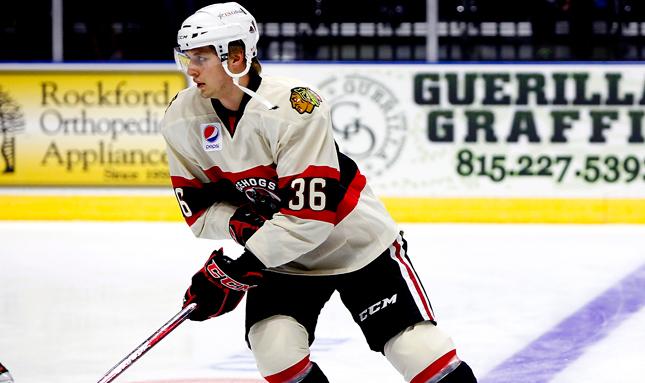 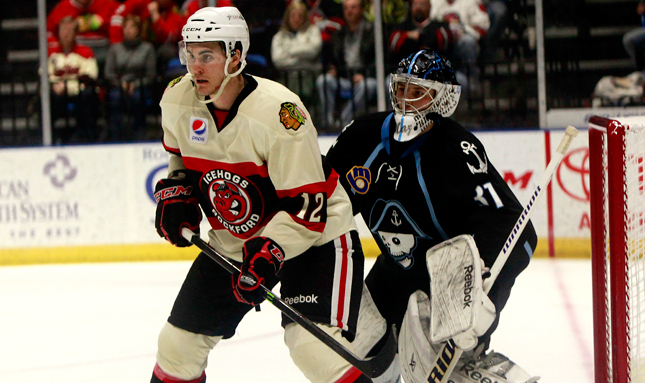 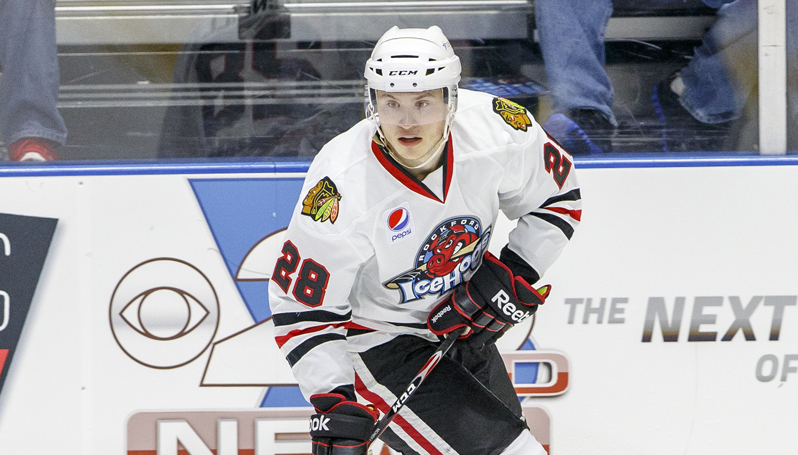 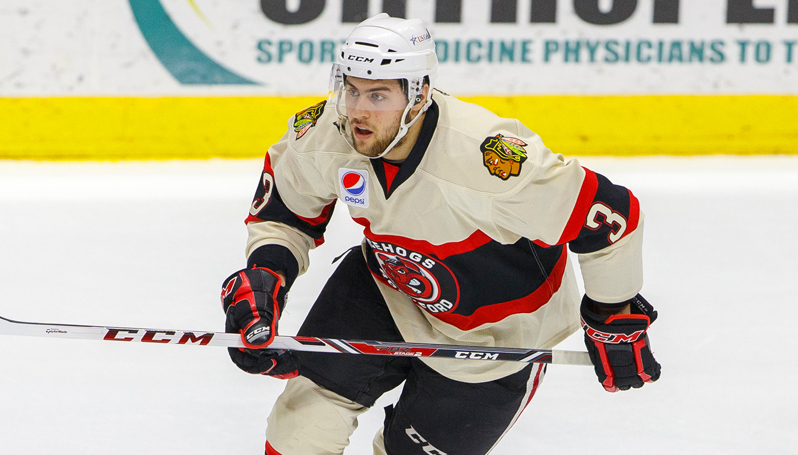 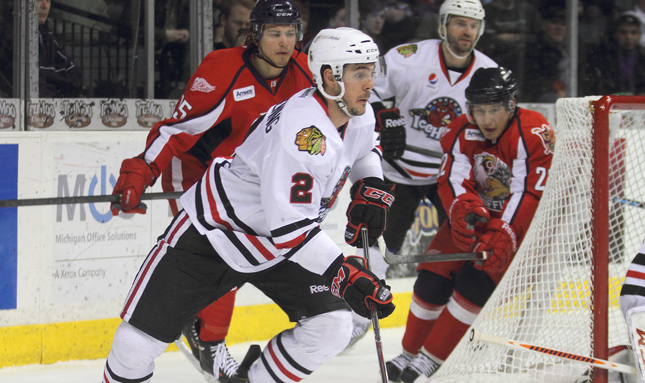 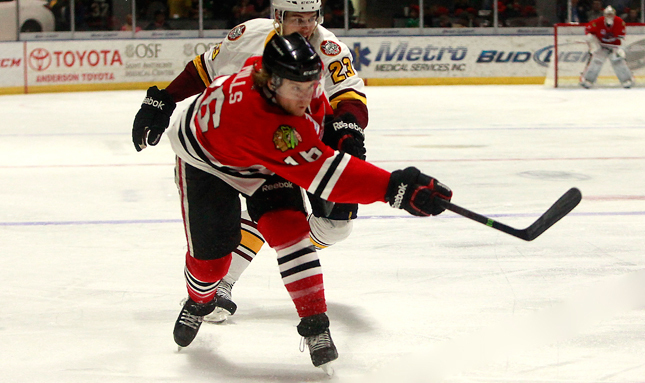 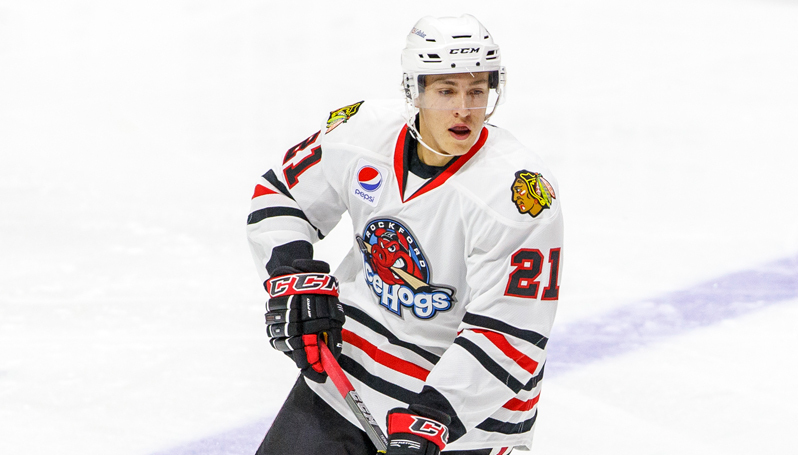 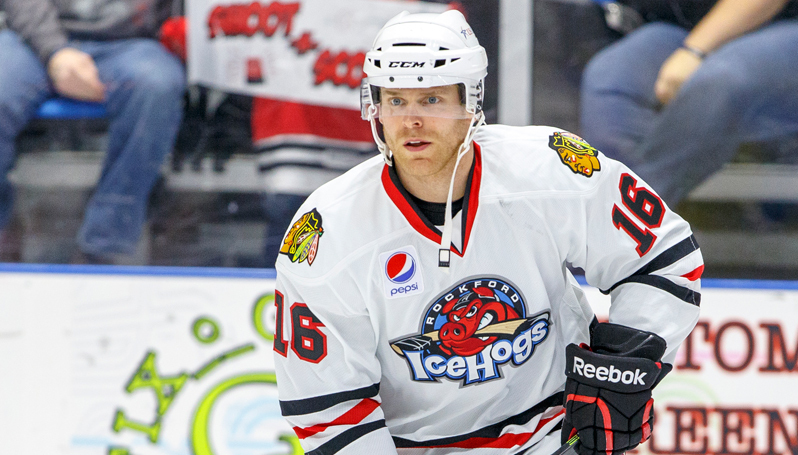 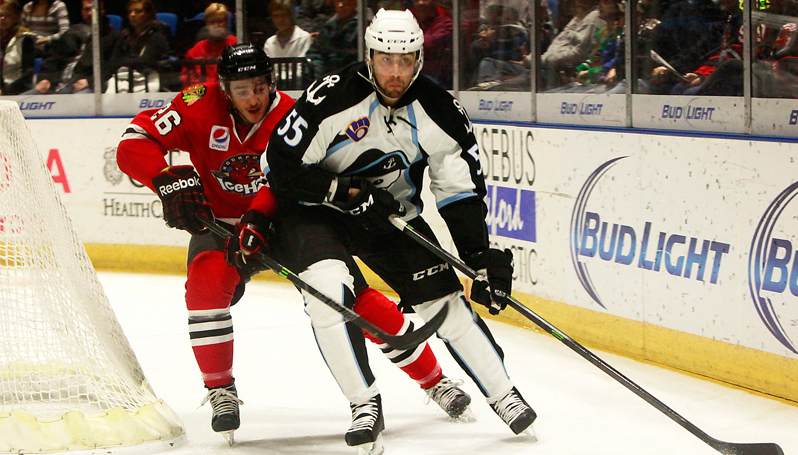 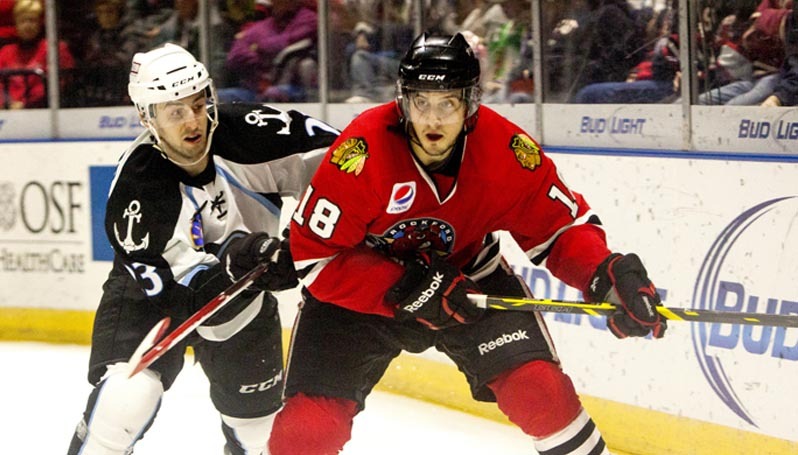 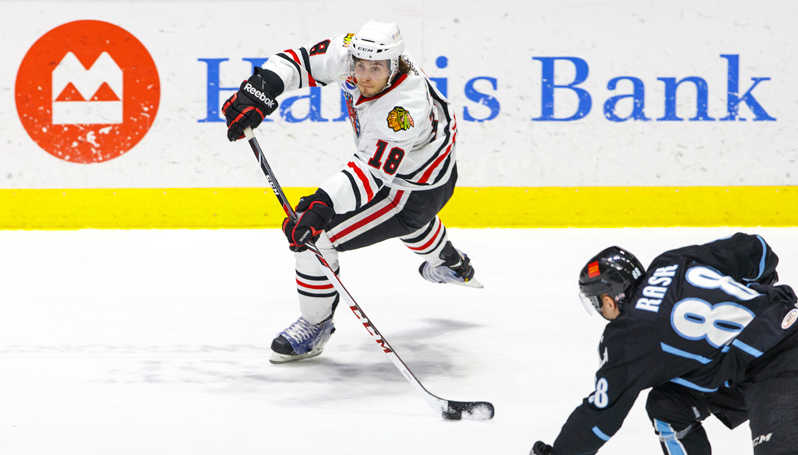 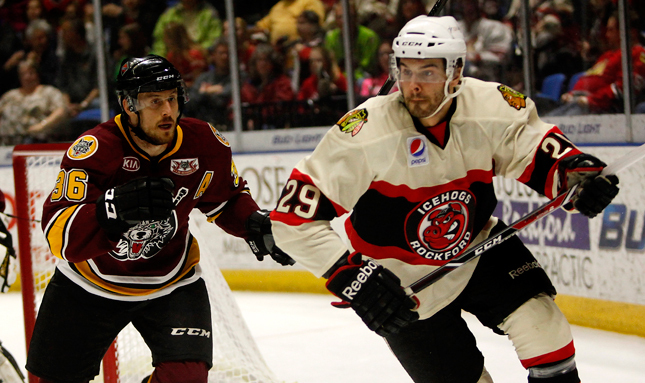 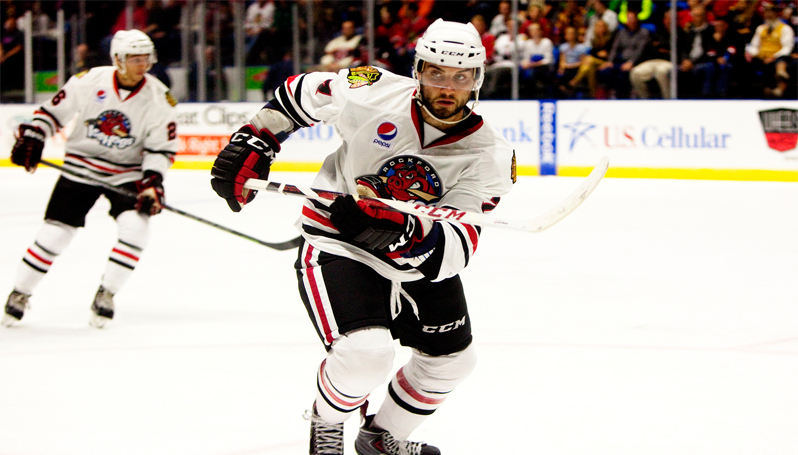 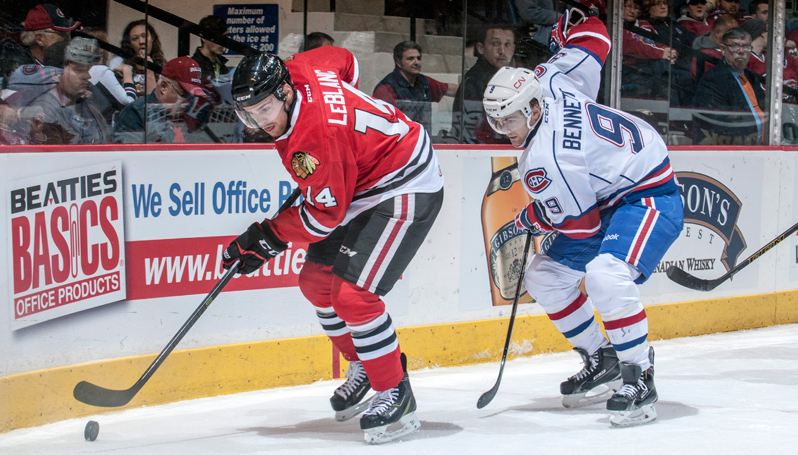 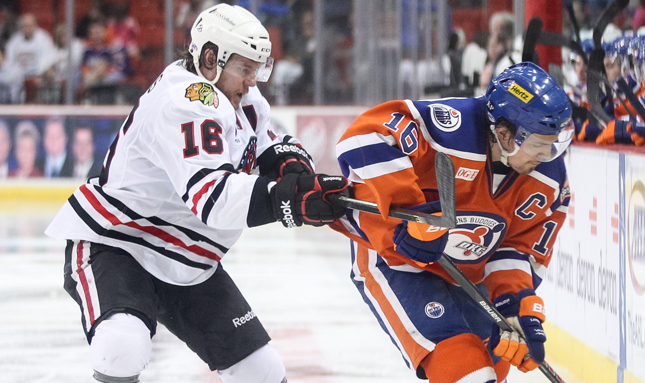 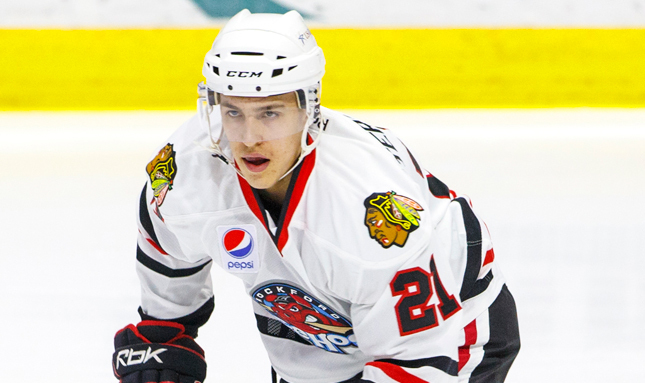 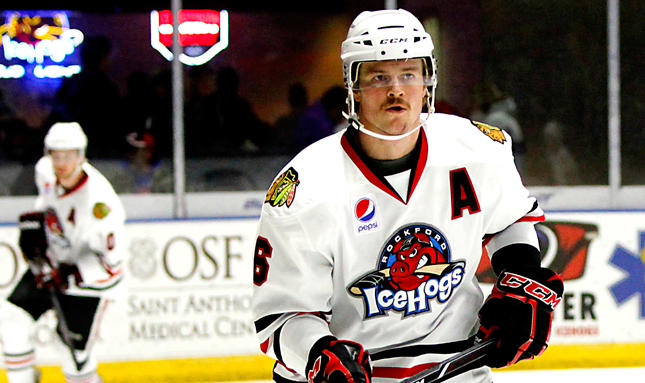 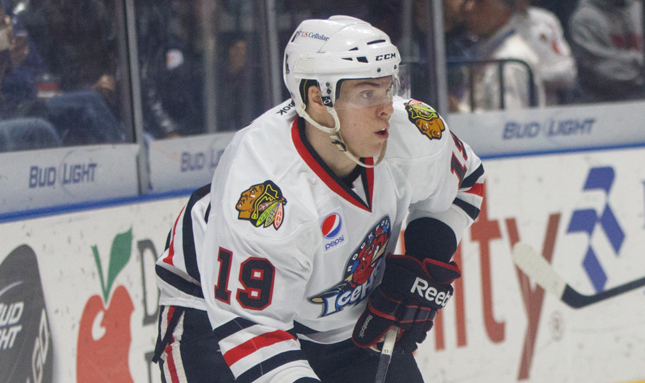 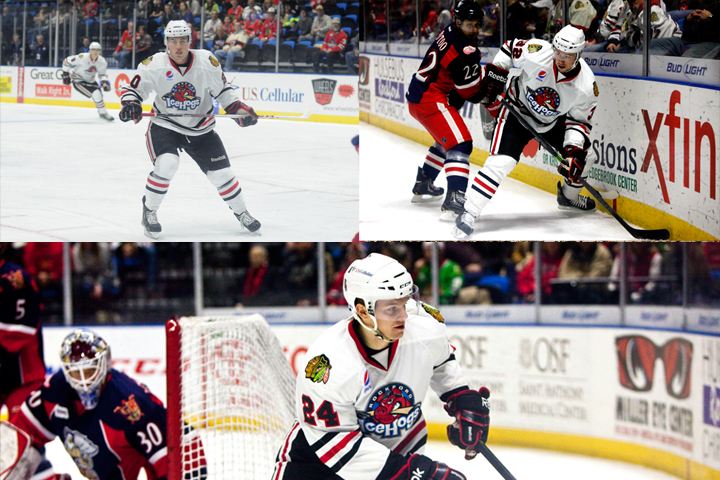 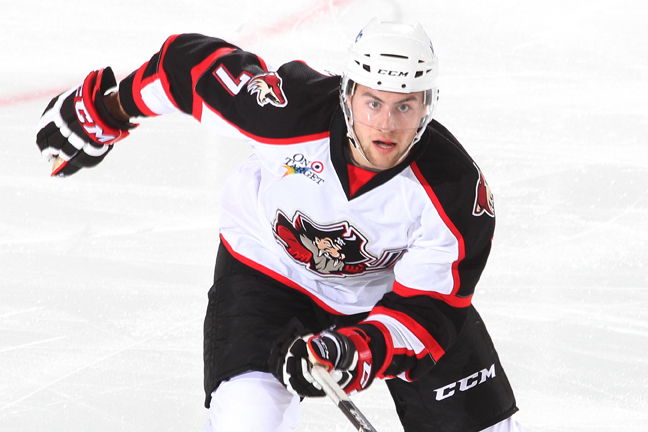 Forwards Cody Bass and Pierre-Cedric Labrie join IceHogs. 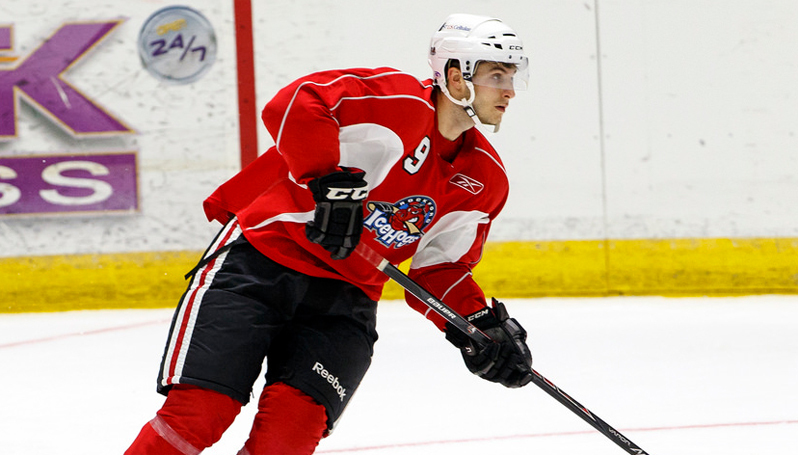 IceHogs training camp roster now stands at 31 skaters. 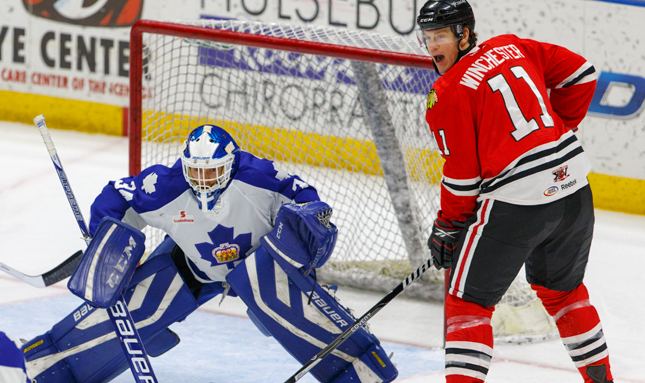 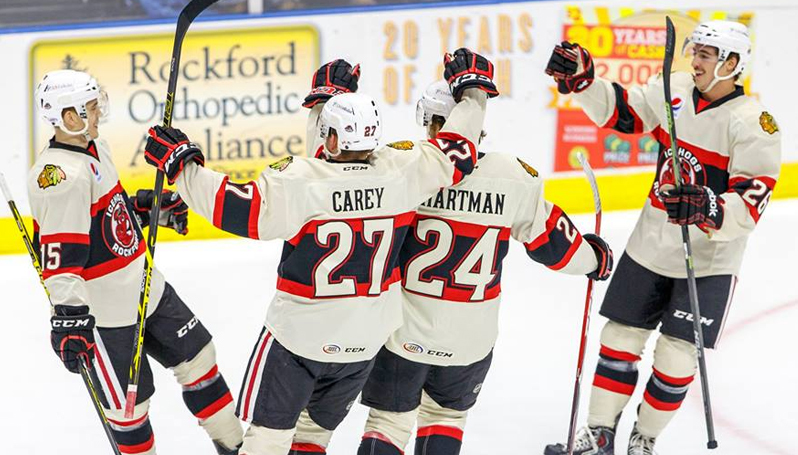 Blackhawks send three more to Rockford following third preseason tilt. 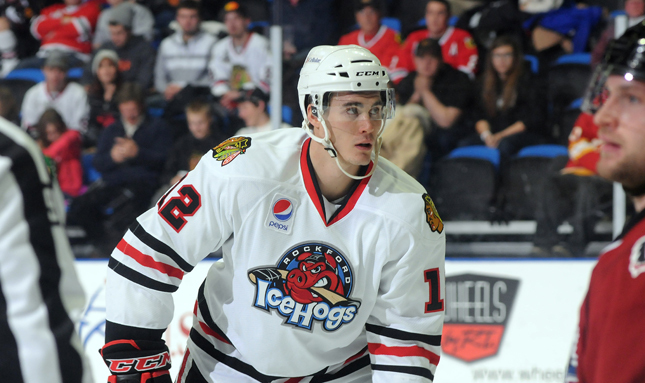 The IceHogs training camp roster stands at 22 players. 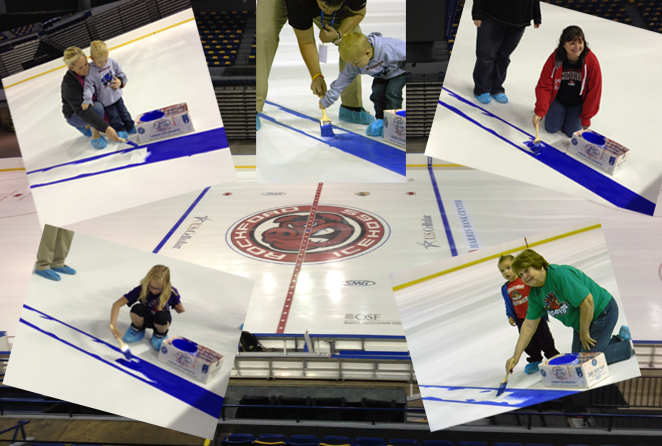 Season ticket holder were invited to the BMO to help paint the ice. 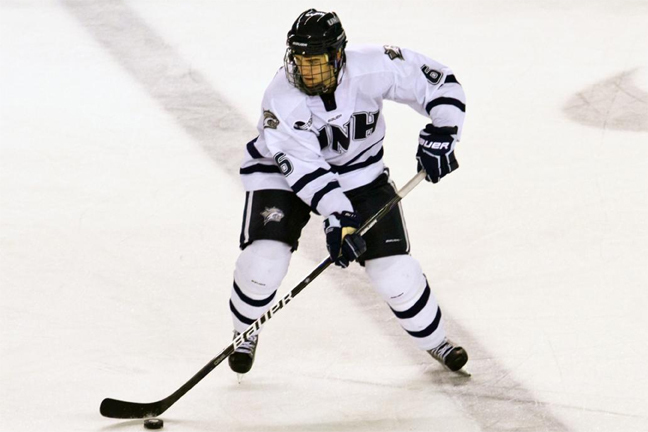 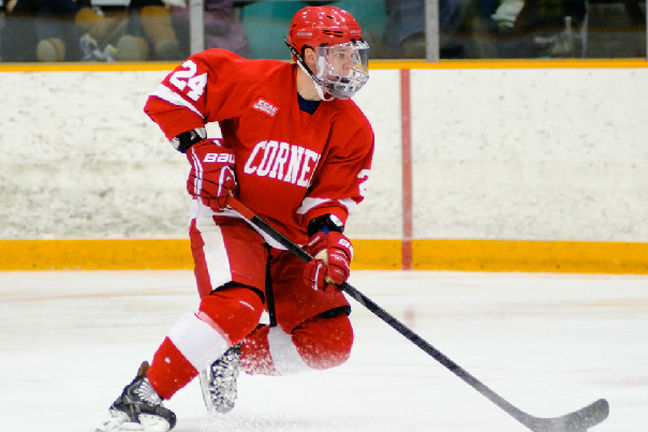 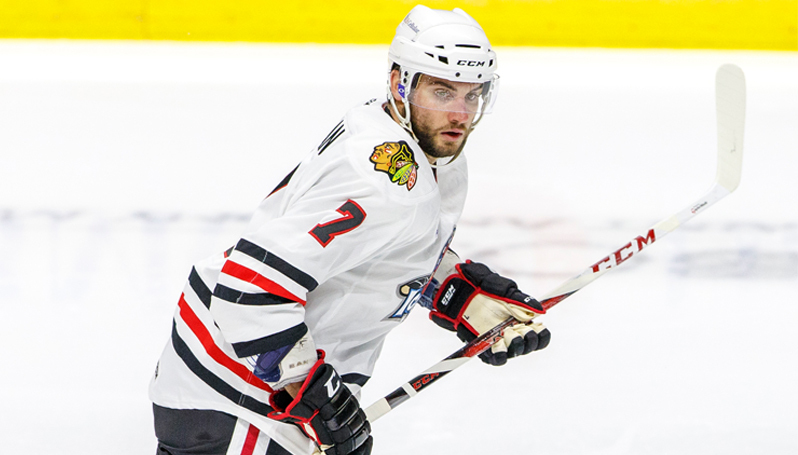 Winger participated in recent rookie tournament with Chicago. 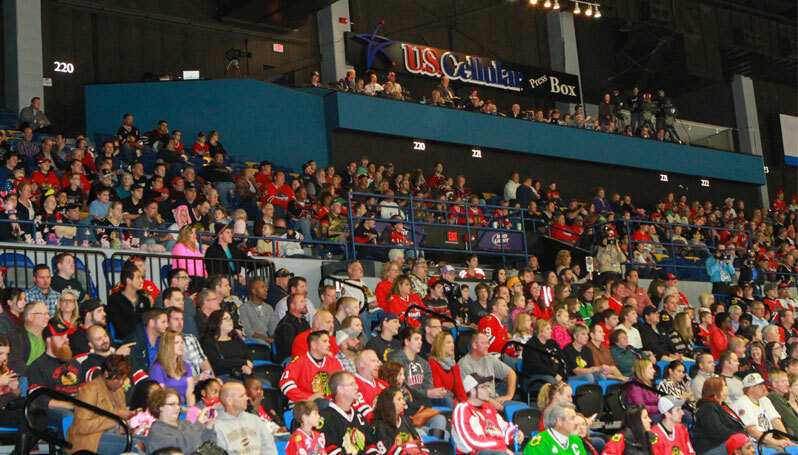 The Blackhawks will open their 2014 training camp at the University of Notre Dame’s Compton Family Ice Arena on Friday, Sept. 19. 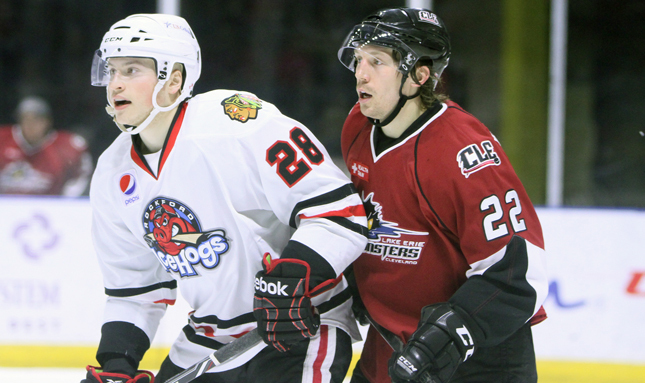 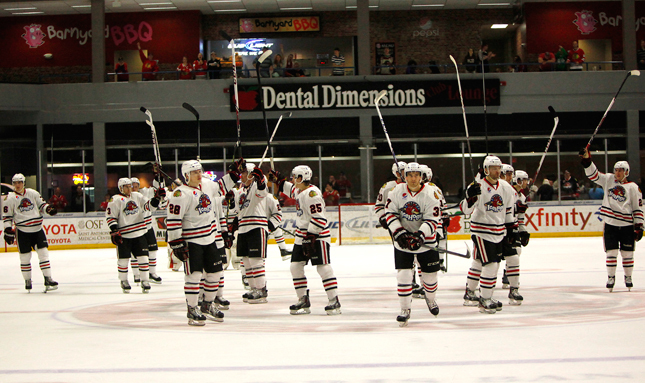 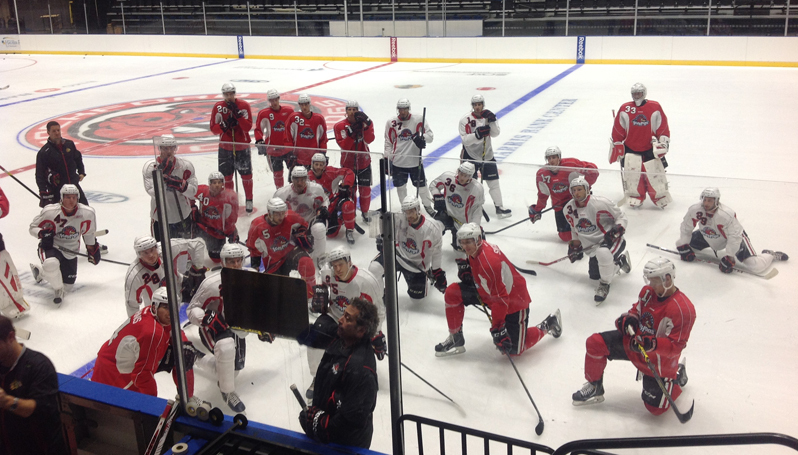 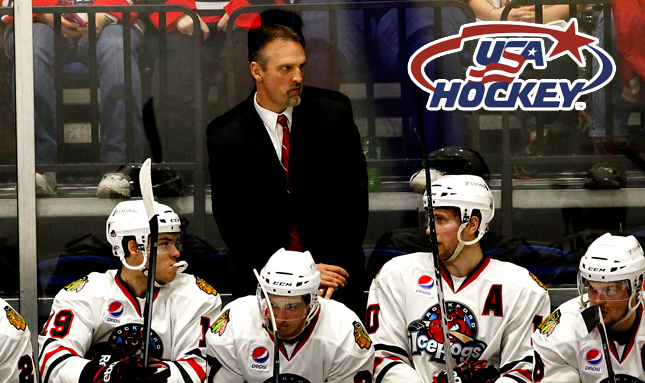 IceHogs Training Camp to begin on Sunday, Sept. 28. 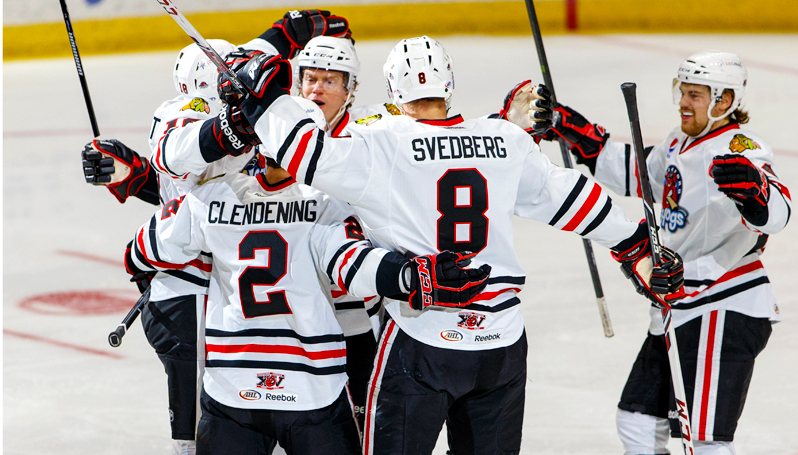 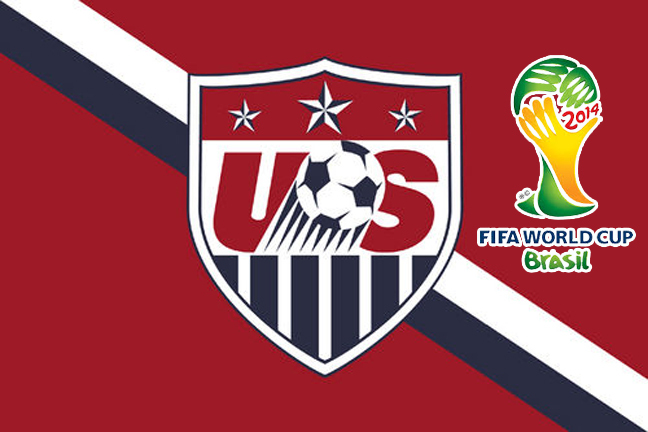 Blackhawks finish tournament with 0-1-0-2 record. 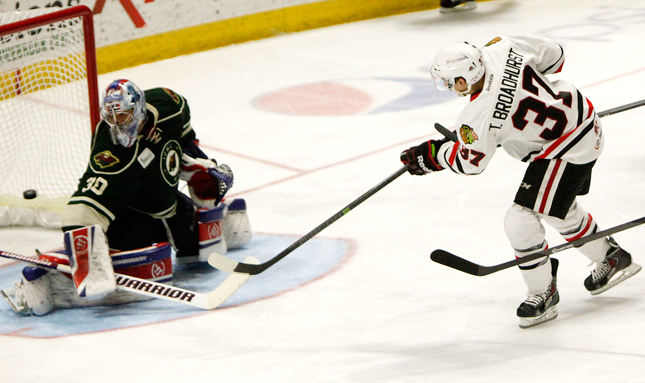 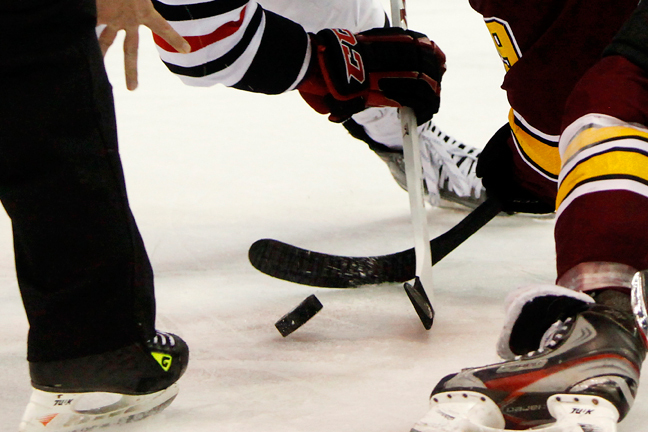 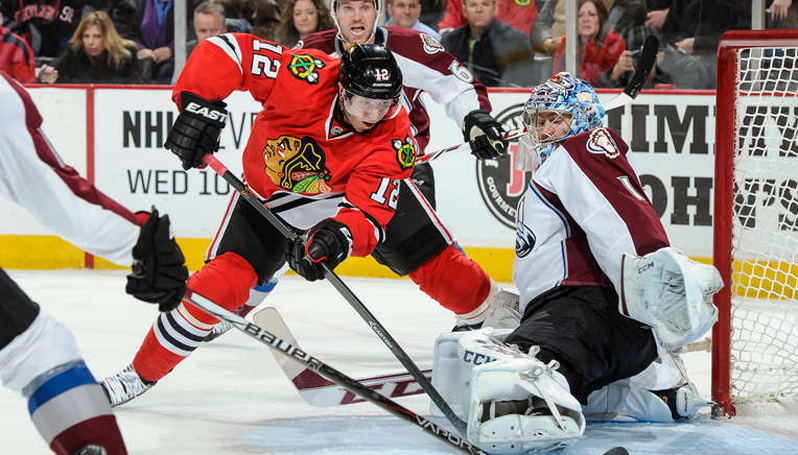 Chicago battles back from 4-1 deficit in shootout loss. 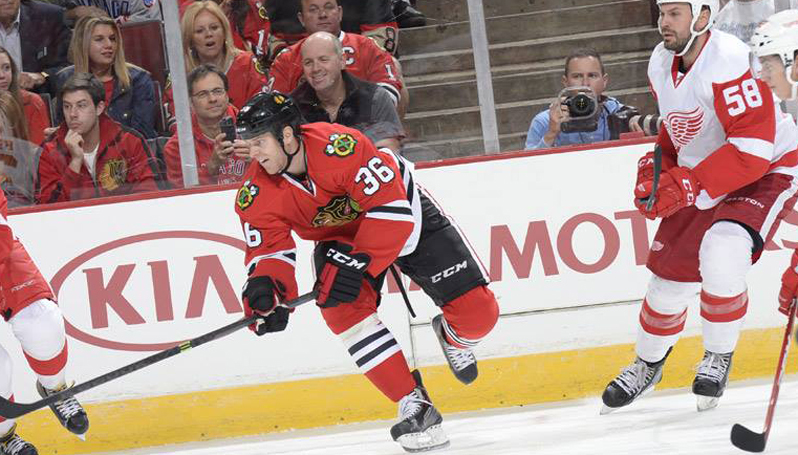 Chicago squad doubled up by Maple Leafs, 4-2. 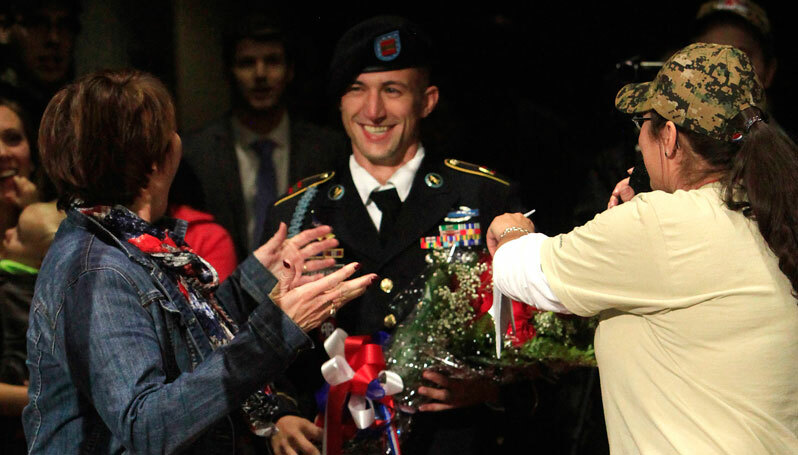 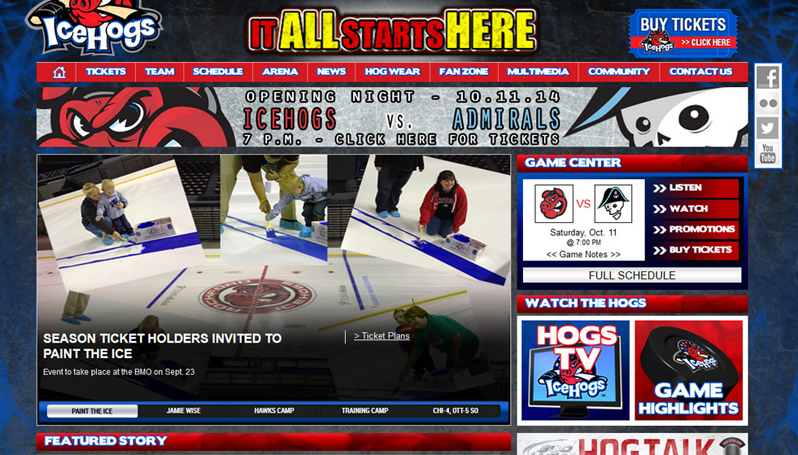 Season premier set for Monday, Oct. 13. 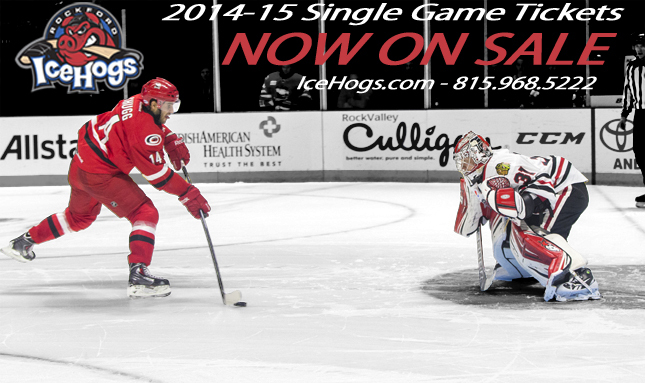 Single-game tickets for the 2014-15 regular season are now on sale. 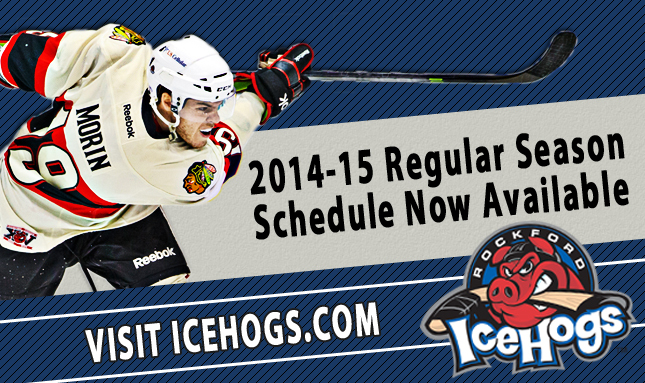 The 2014-15 promo schedule features over 15 fan-friendly giveaways throughout the regular season. 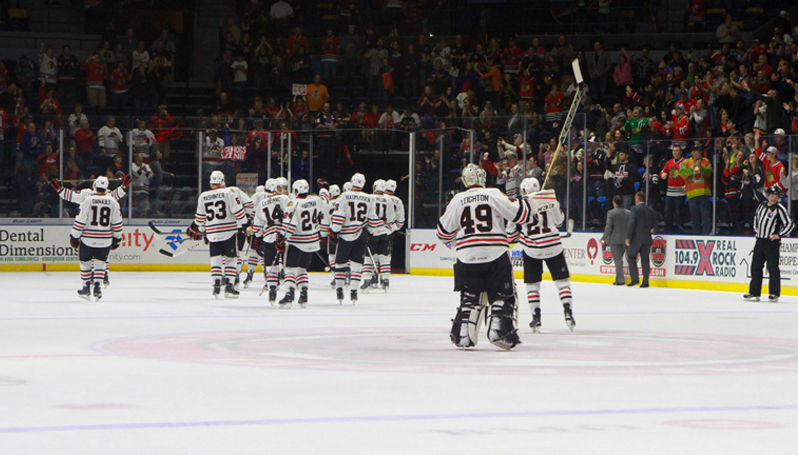 A few thoughts as we head into the final month of the offseason. 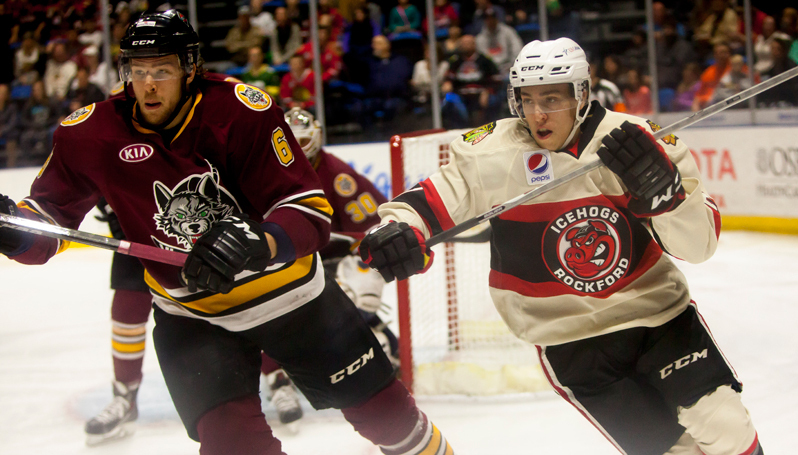 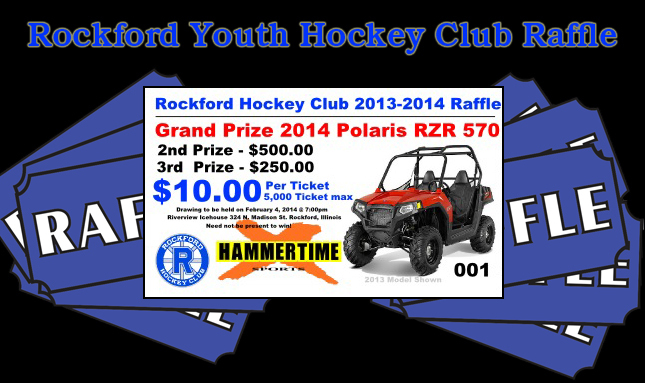 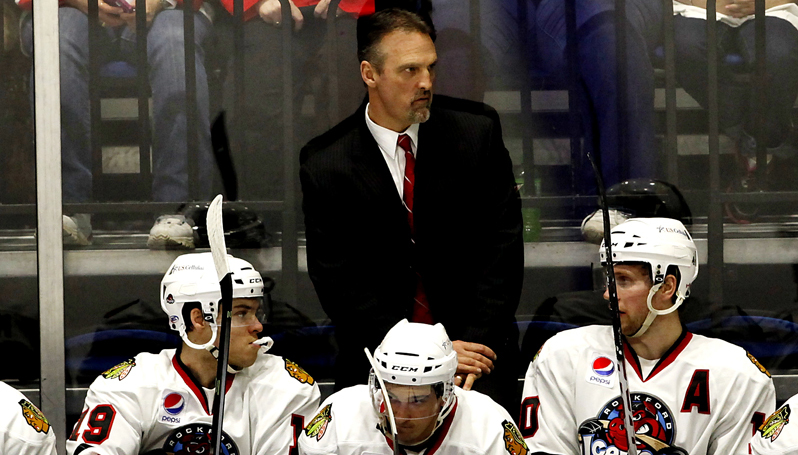 Could Rockford's roster already be in place? 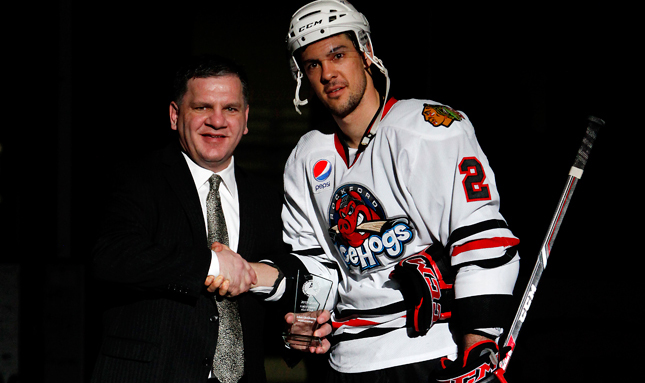 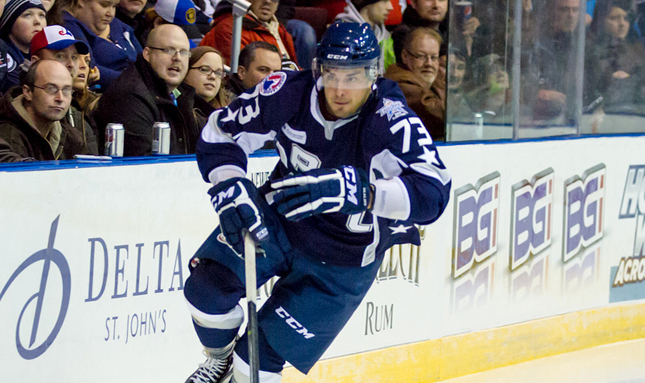 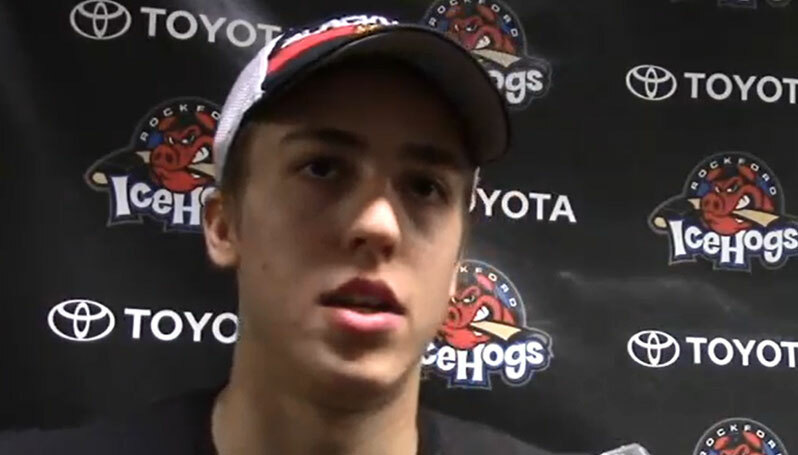 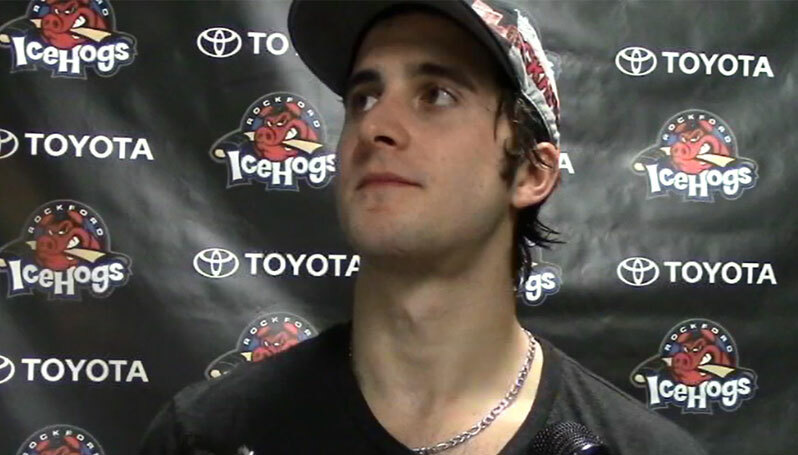 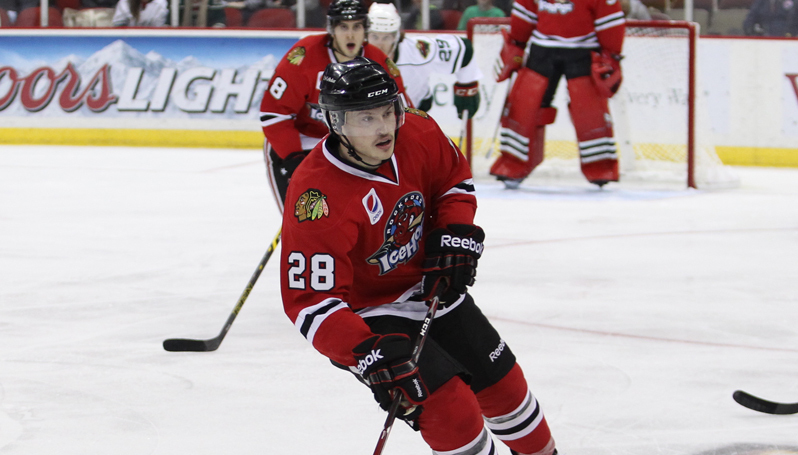 Jeremy Morin led the IceHogs in his 3 Stars point accrual. 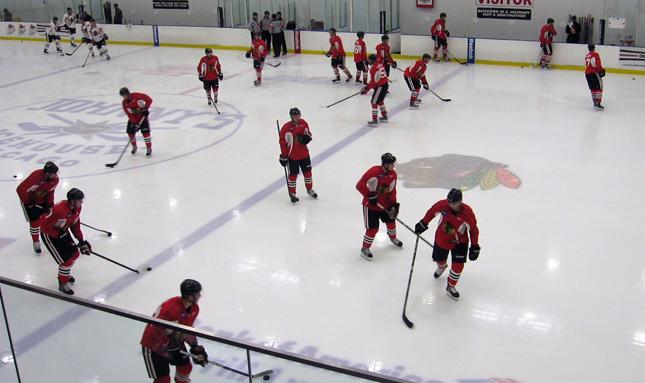 The Blackhawks selected nine players at the 2014 NHL Draft at Wells Fargo Center in Philadelphia. 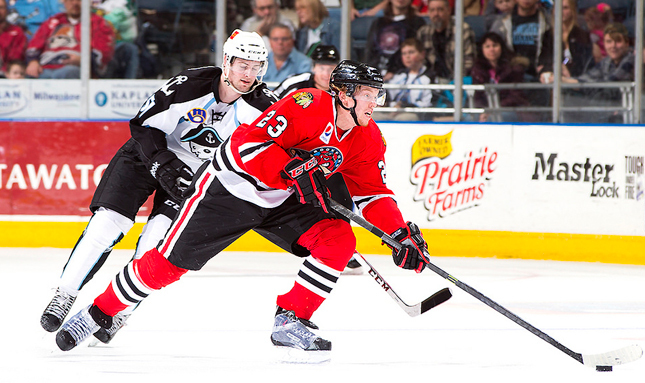 Chicago nabs Schmaltz after trade with San Jose. 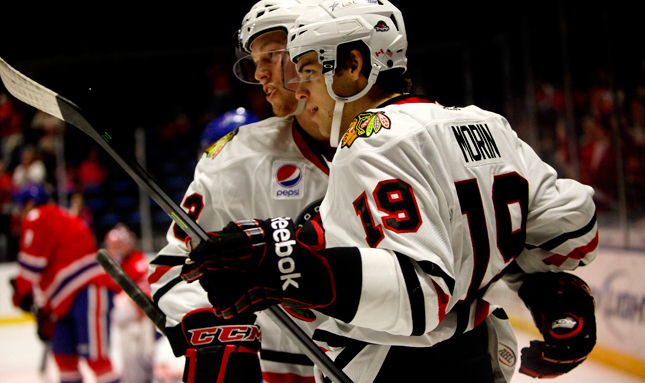 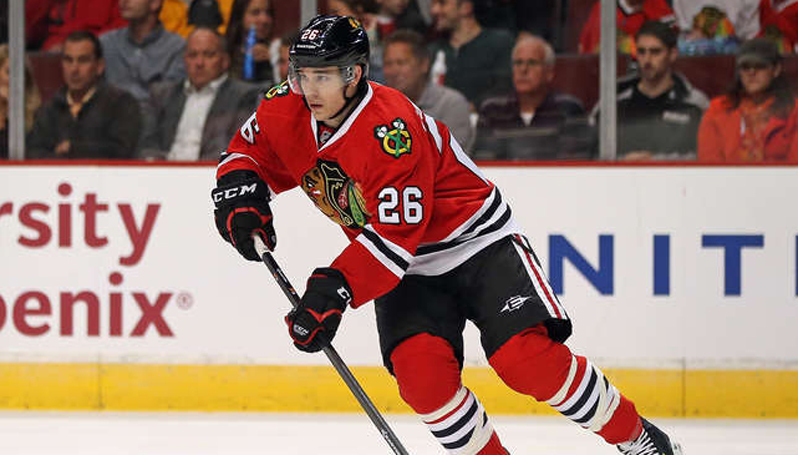 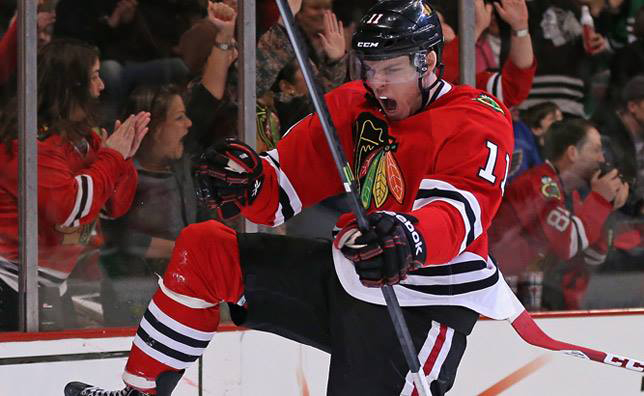 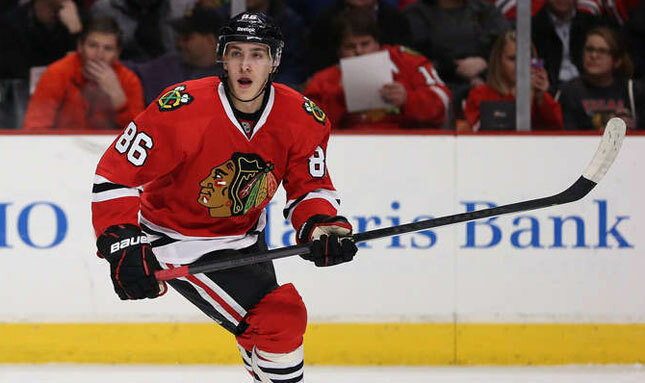 Forward Jeremy Morin inks two-year deal with Blackhawks. 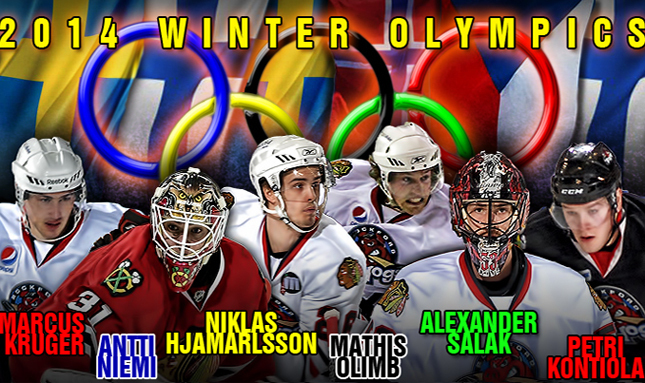 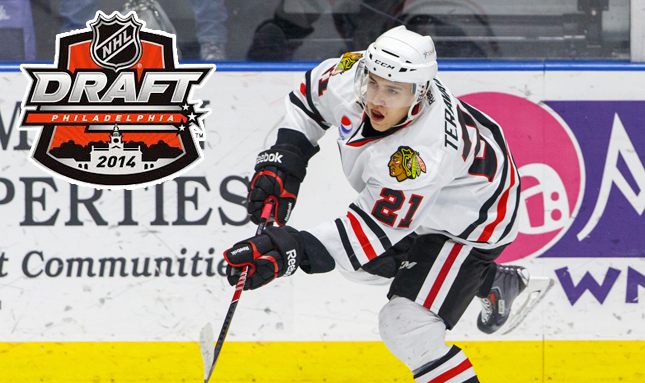 This weekend, the Chicago Blackhawks will be looking to add prospects to their system with the 27th overall pick in the 2014 NHL Entry Draft. 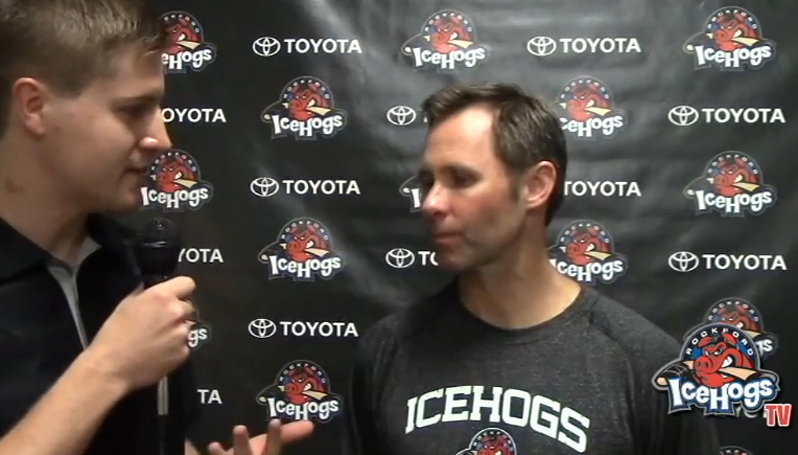 How does the upcoming draft affect the IceHogs? 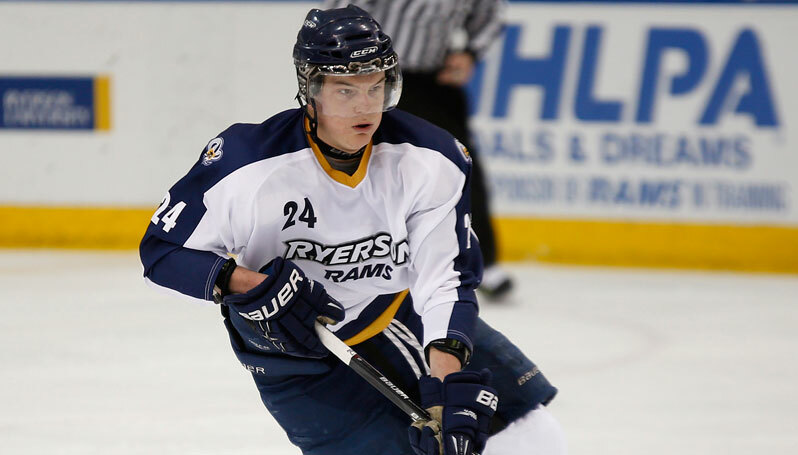 Another talented group of young hockey players will look to begin their professional hockey journey on Friday in this year’s 52nd NHL Entry Draft. 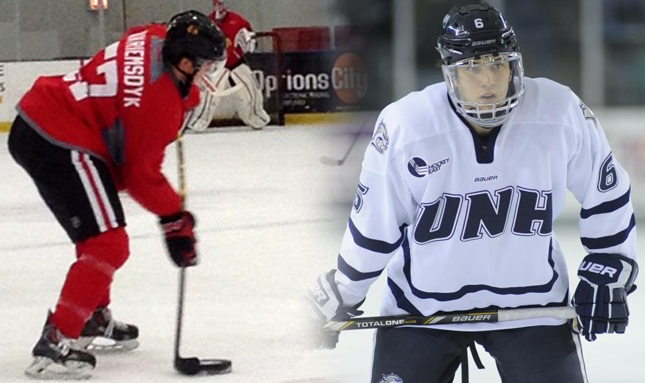 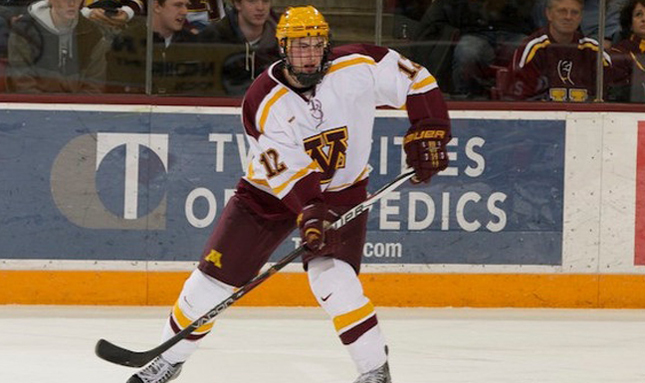 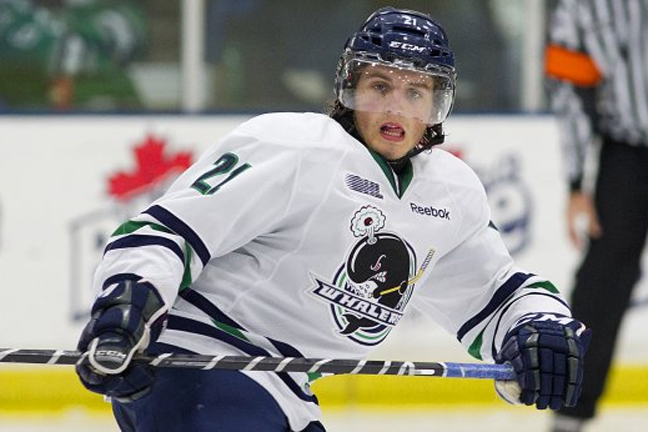 2014 NHL DRAFT: IS SCHMALTZ THE HAWKS GUY AT 27? 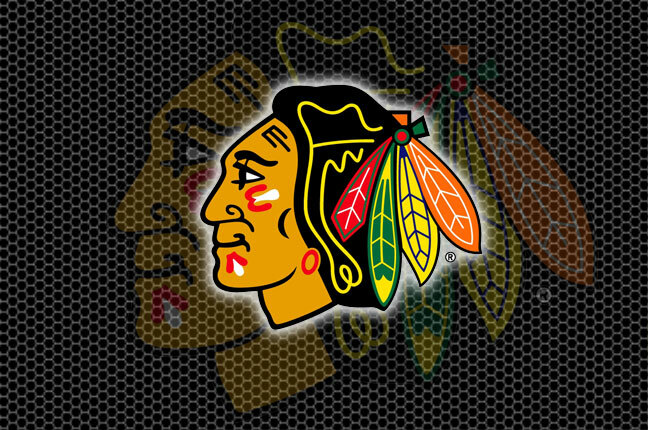 The 2014 National Hockey League Entry Draft begins on Friday in Philadelphia and the Chicago Blackhawks will have the 27th pick in the first round. 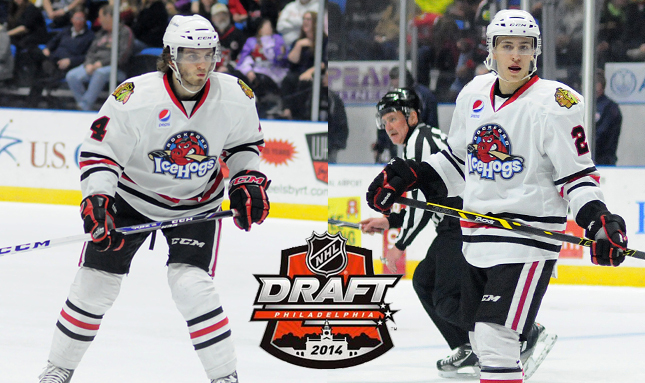 The Blackhawks are set to pick at the 27th spot in this month’s NHL Entry Draft. 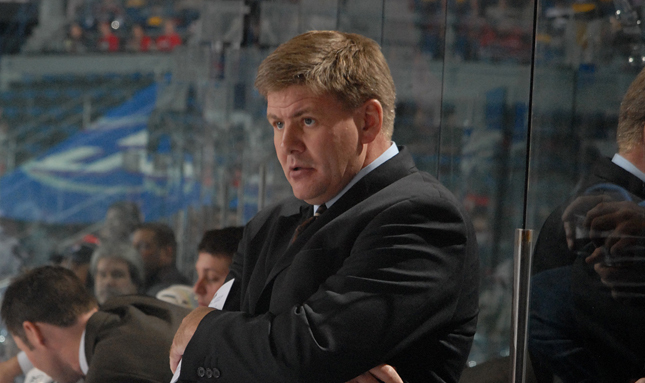 Bill Peters named head coach of NHL's Carolina Hurricanes. 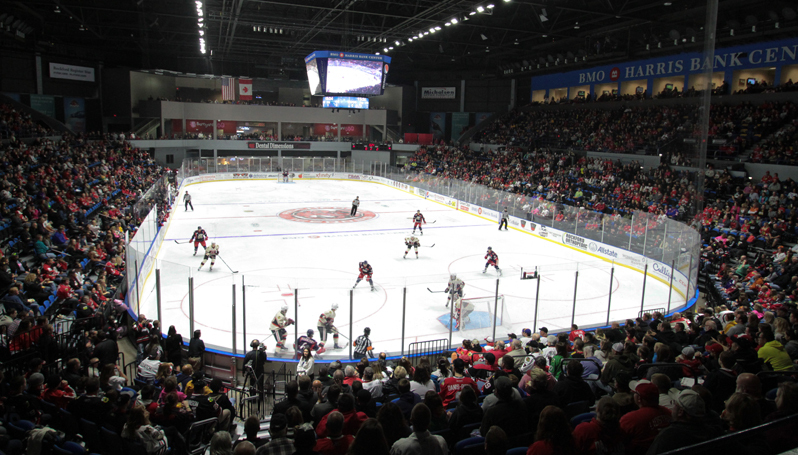 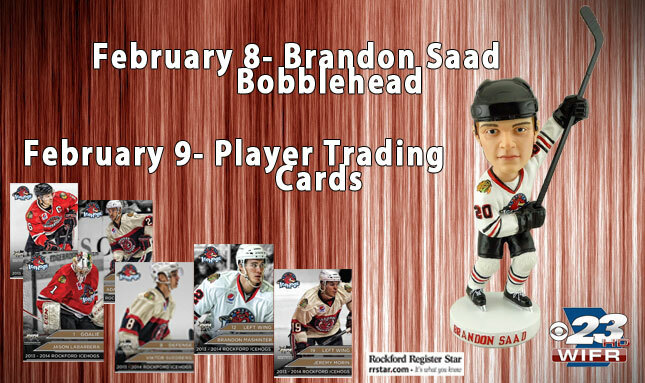 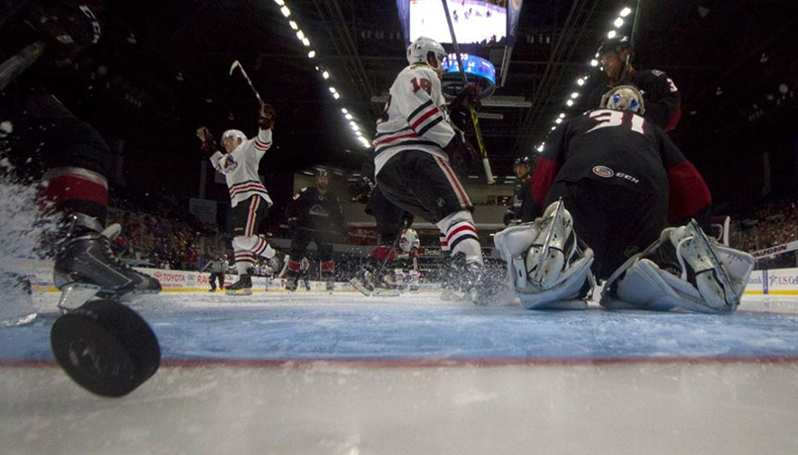 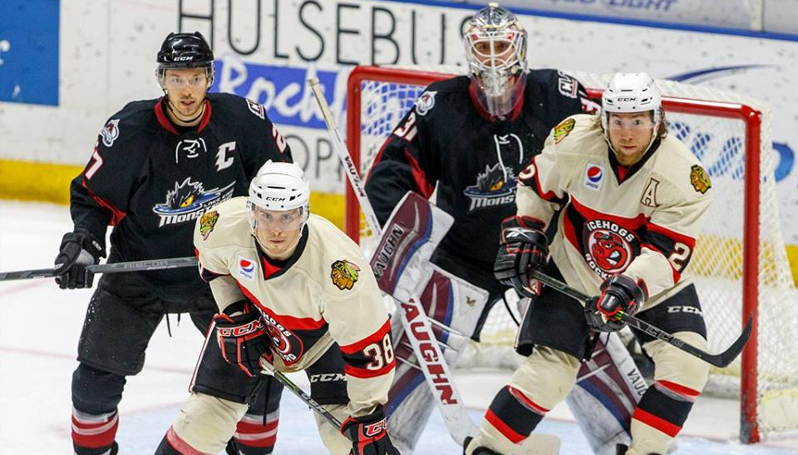 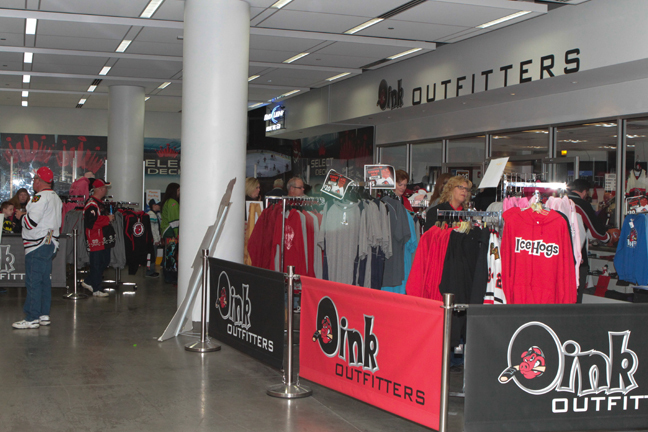 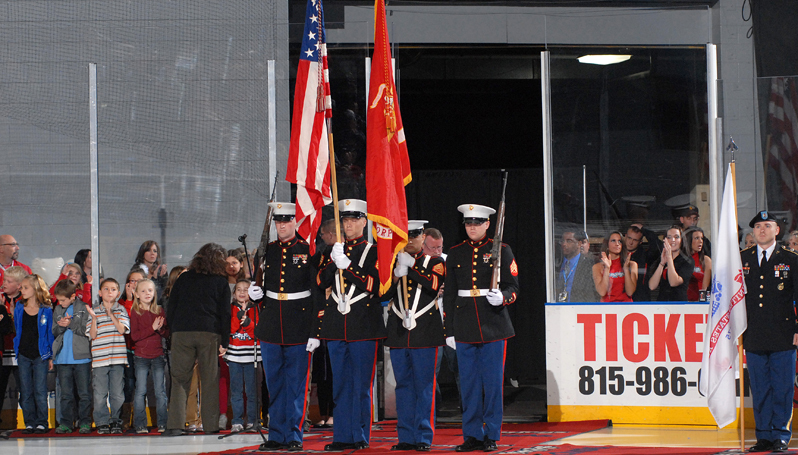 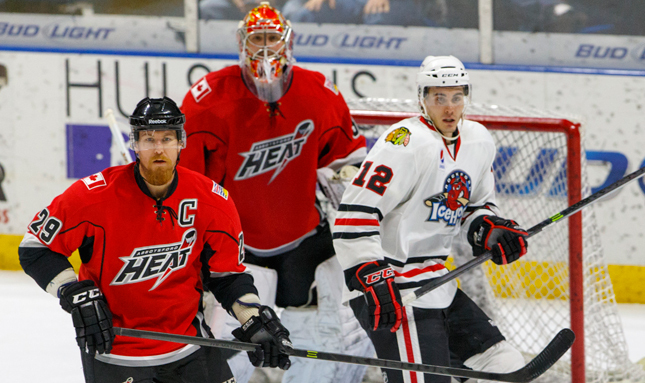 The Rockford IceHogs, in conjunction with the American Hockey League, announced seven home dates for the upcoming 2014-15 regular season. 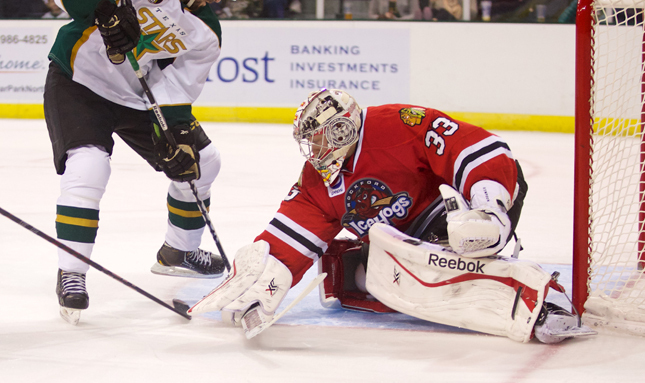 The Texas Stars knocked off the St. John's IceCaps in Game 5 to win 2014 Calder Cup. 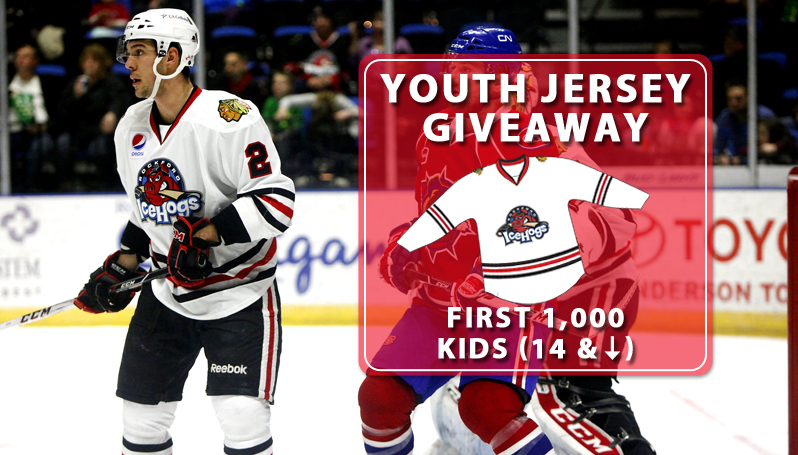 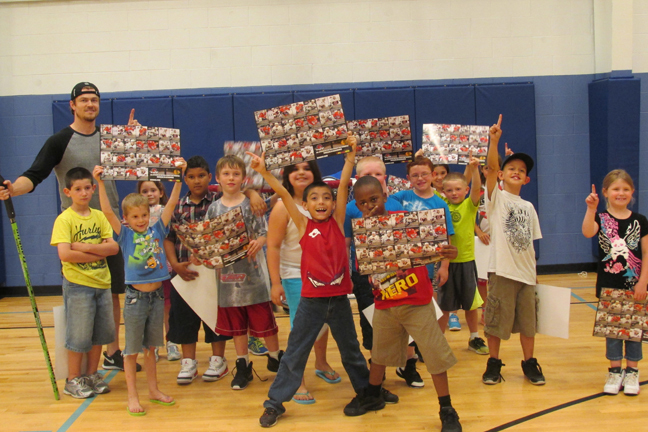 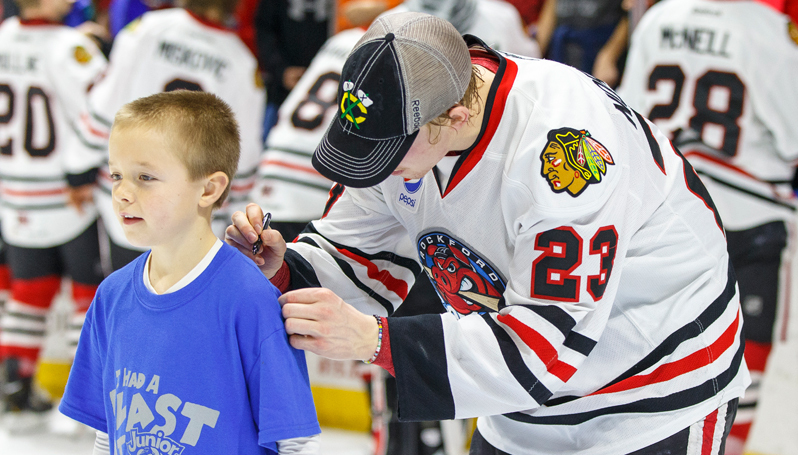 The IceHogs 2014 Summer Street Hockey Initiative is underway. 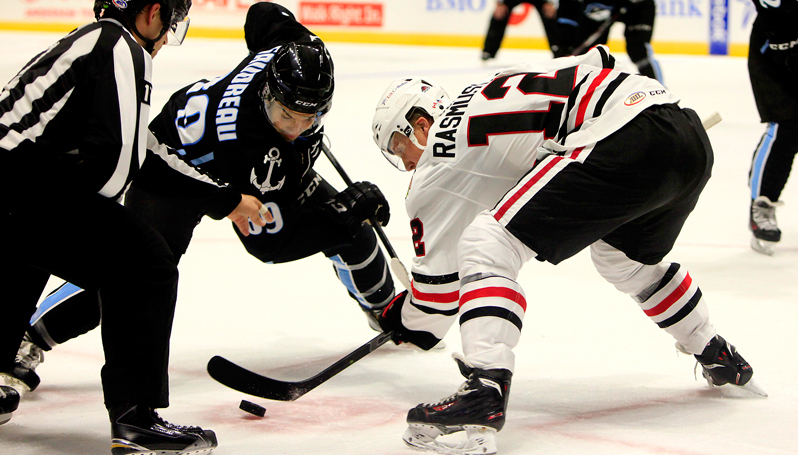 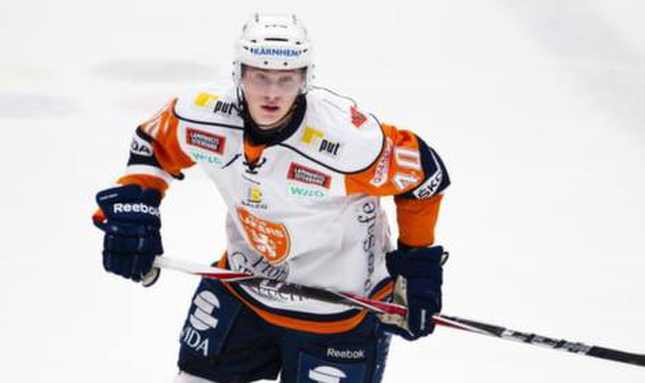 The Blackhawks have agreed to terms on a one-year deal with Swedish forward Dennis Rasmussen. 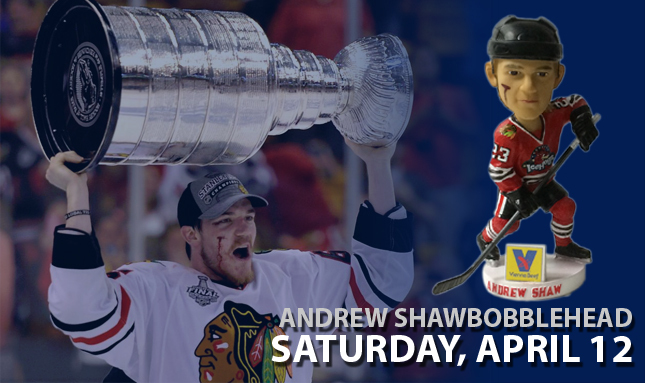 Score a memorable gift for Dad this Father's Day. 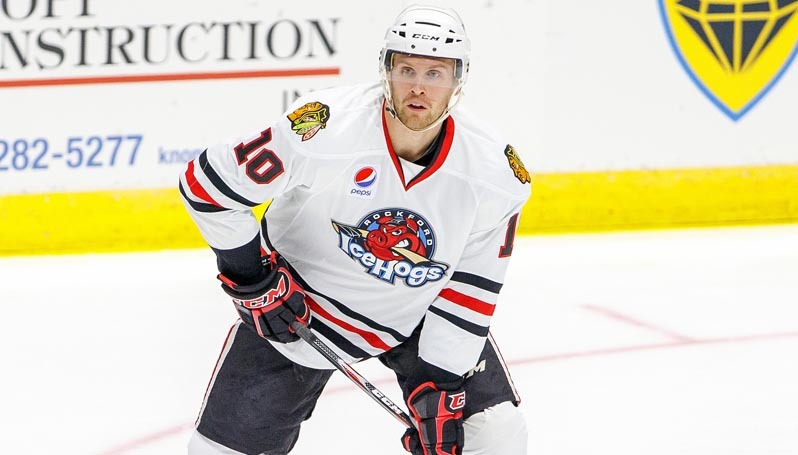 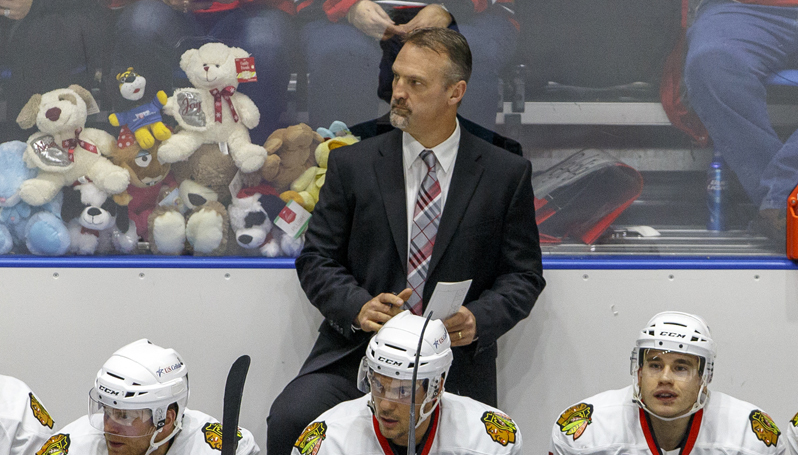 Rockford IceHogs Head Coach Ted Dent is hosting a youth hockey camp at Leaf Centre in West Dundee, Ill. from July 21-24. 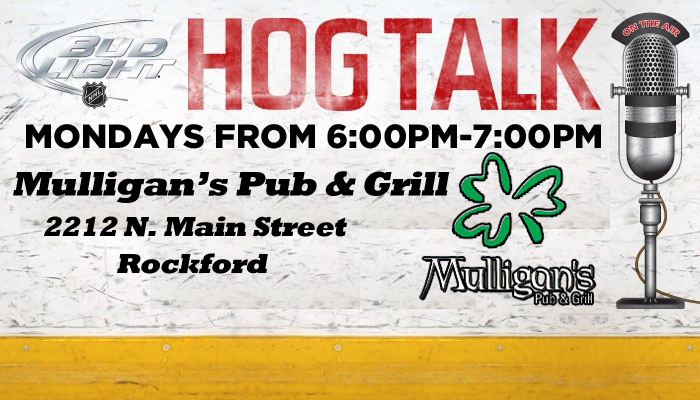 Five stops on tap this weekend for Hammy. 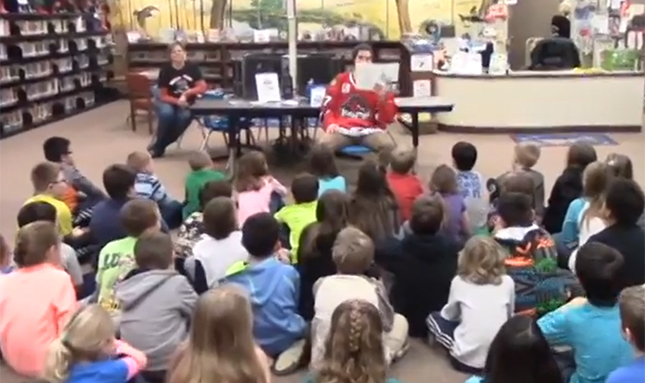 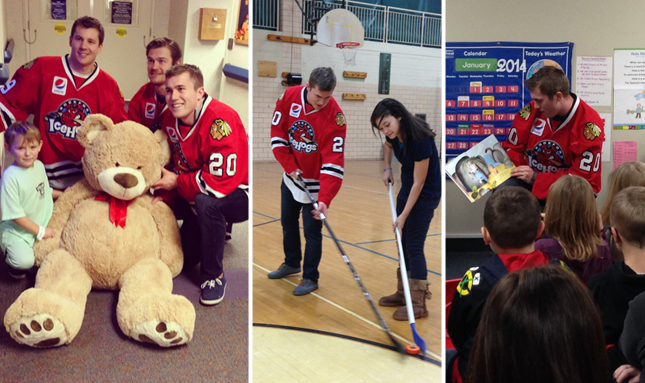 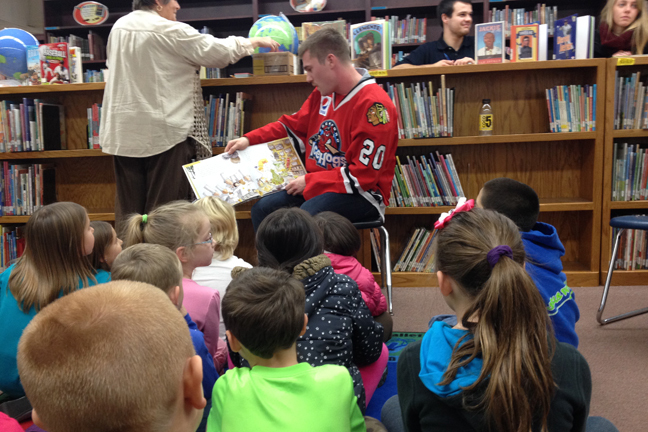 With the school year wrapping up and summer vacation nearly here, the Rockford IceHogs are kicking off their Summer Reading Program. 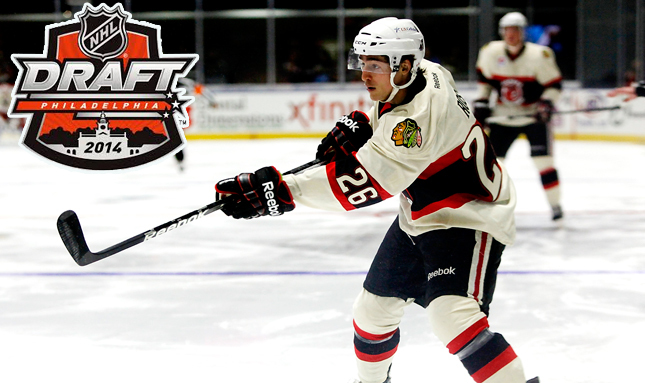 WHAT CONSTITUTES A SUCCESSFUL DRAFT? 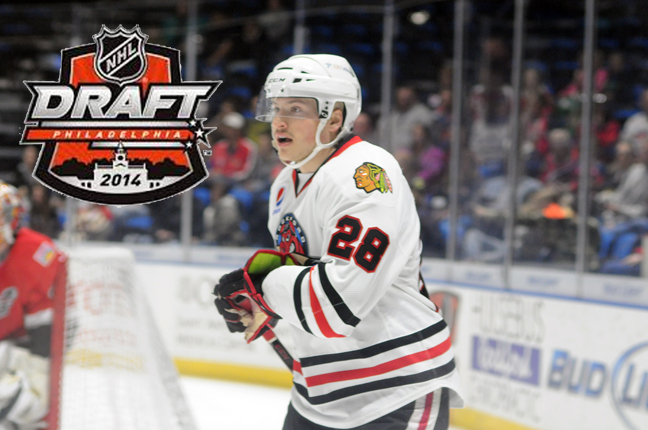 If you’re a sports fan and like player drafts, this is probably your favorite time of year. 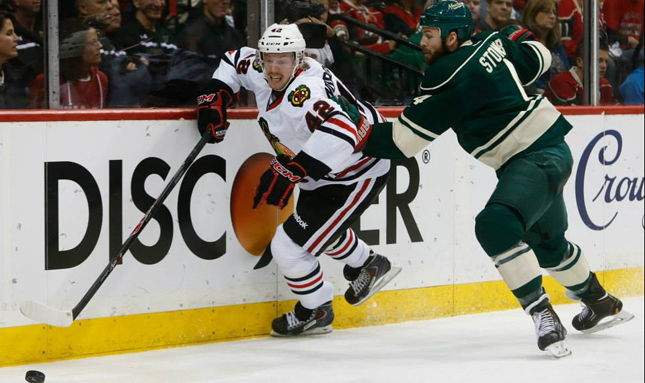 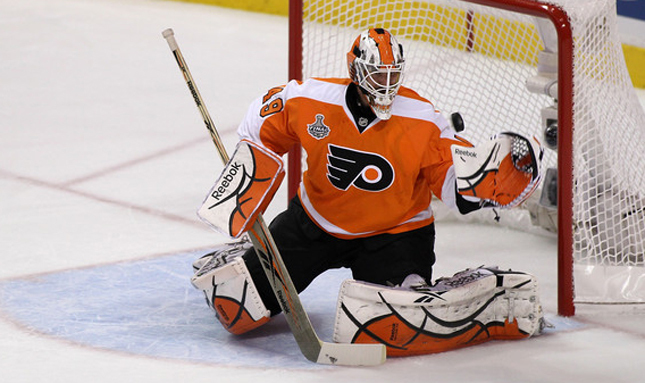 Joakim Nordstrom shares his Stanley Cup Playoff experience. 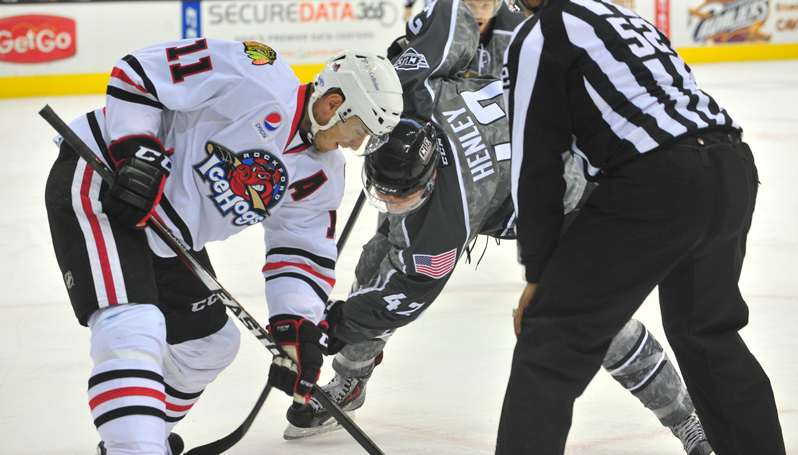 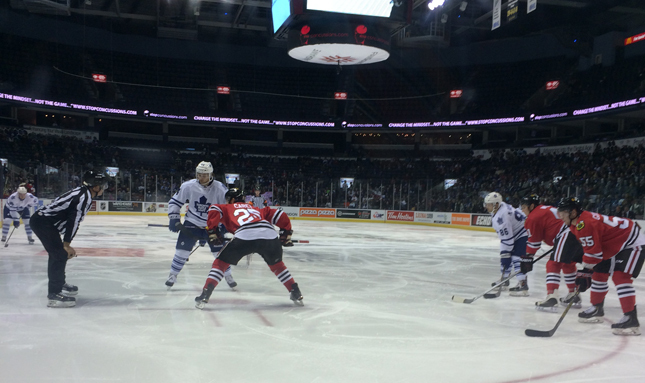 The 2014 Calder Cup Finals get underway Sunday night. 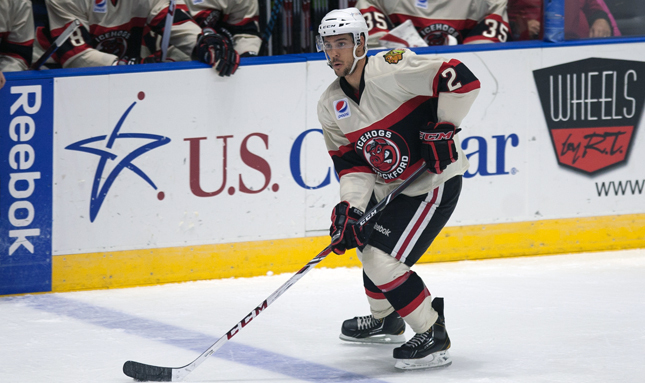 After spending the majority of the last four seasons with the Rockford IceHogs, Jeremy Morin just might have permanently graduated to the National Hockey League. 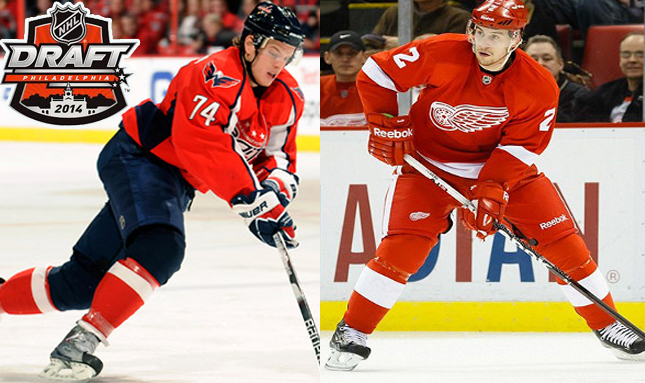 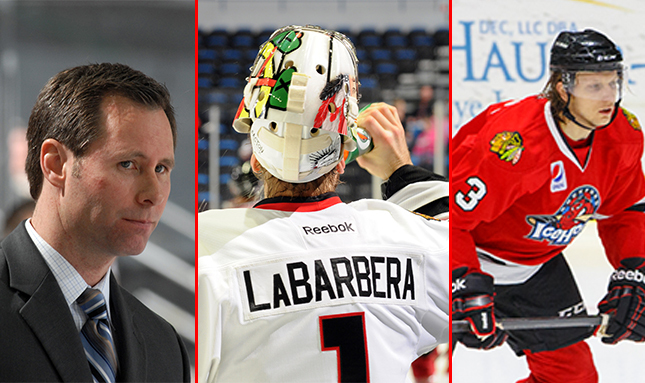 With another season in the books, it’s time to take a peek into what the 2014-15 campaign may hold. 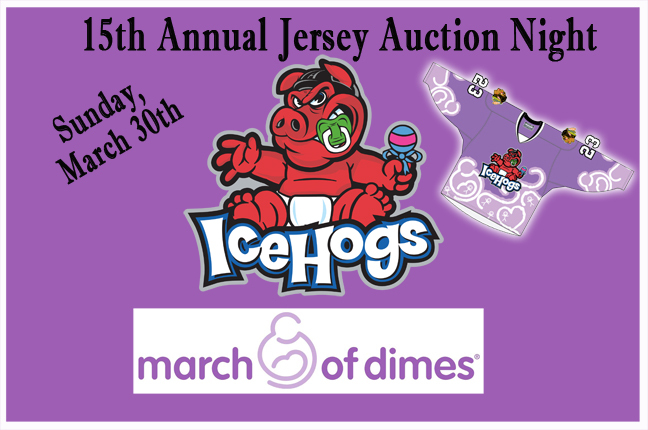 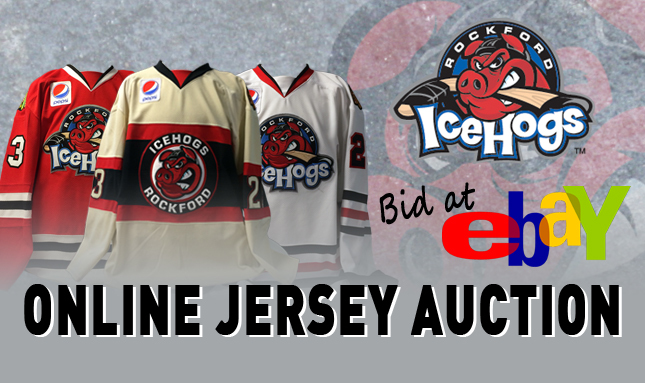 Game worn jerseys, equipment and discounted merchandise available. 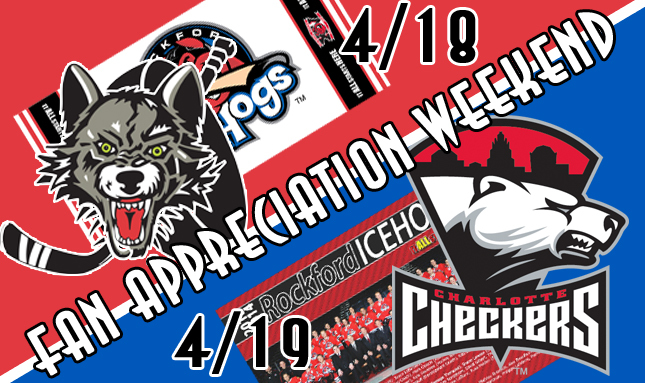 A special thank you message for another BIG season. 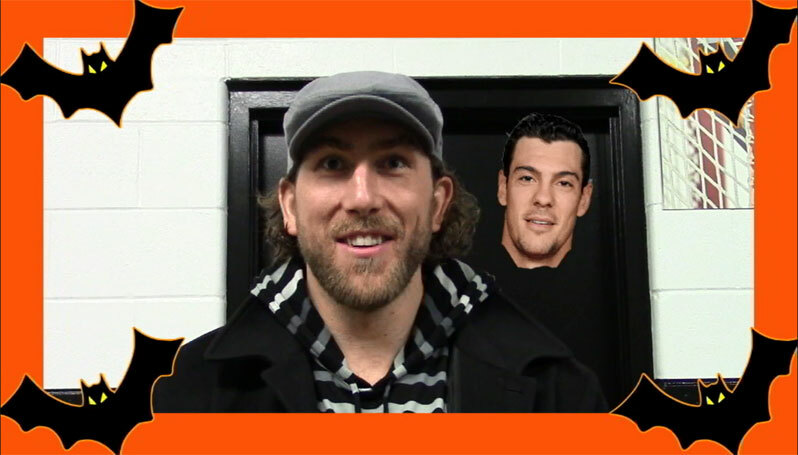 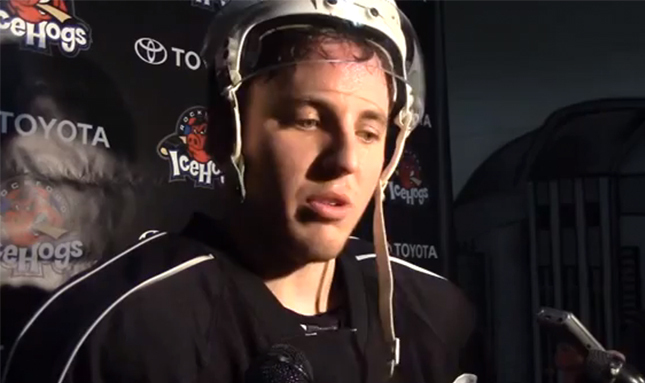 Jason LaBarbera and Jared Nightingale threw cameras on their helmets for a practice. 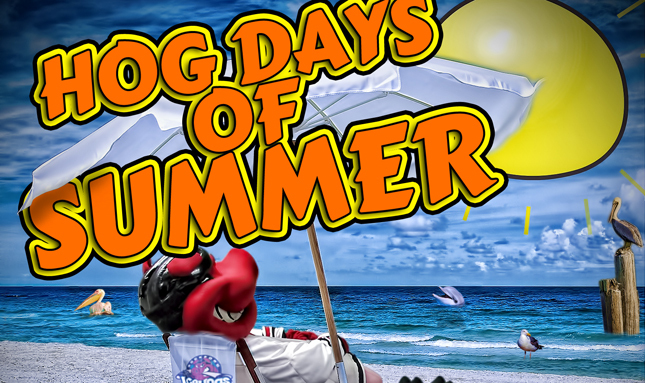 See what its like to be a Hog at the BMO. 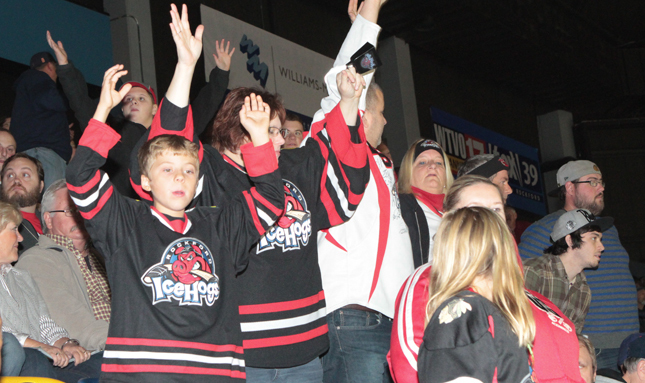 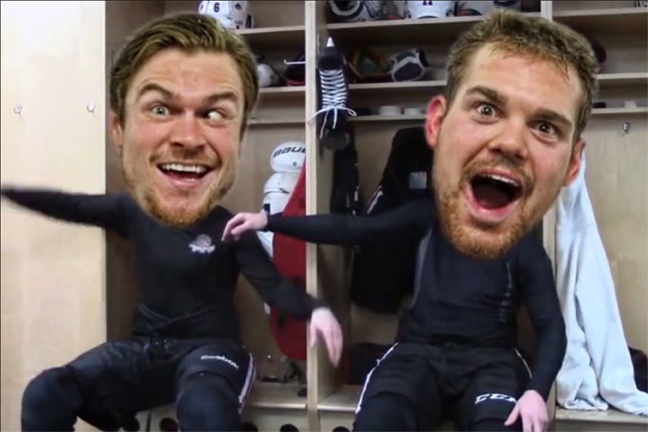 Check out these reactions to the IceHogs alma matter's making the NCAA National Tournament! 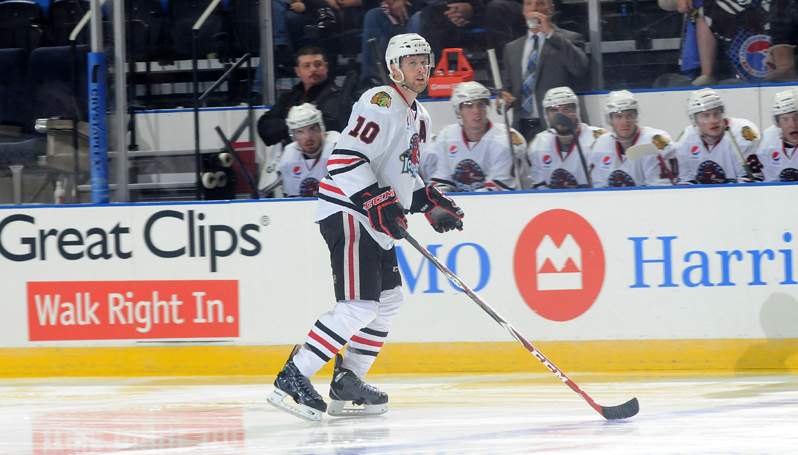 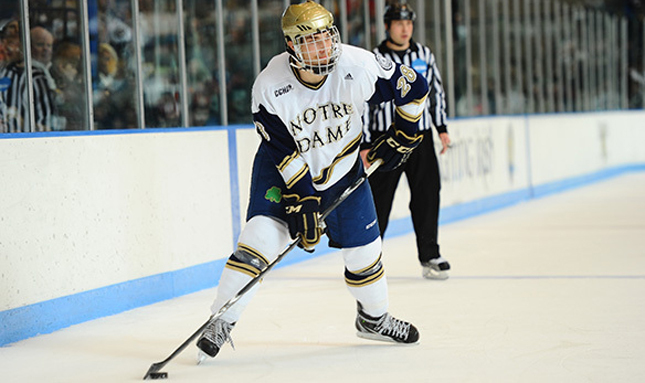 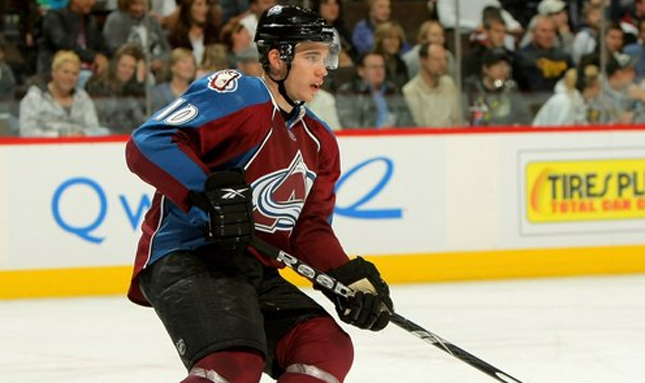 Defenseman Brian Connelly is the new guy on his old team. 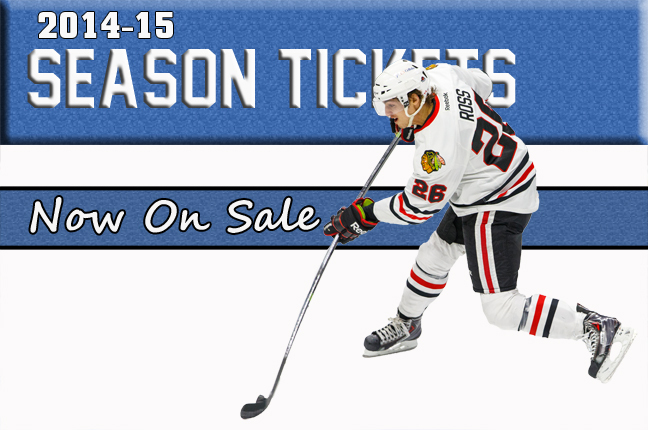 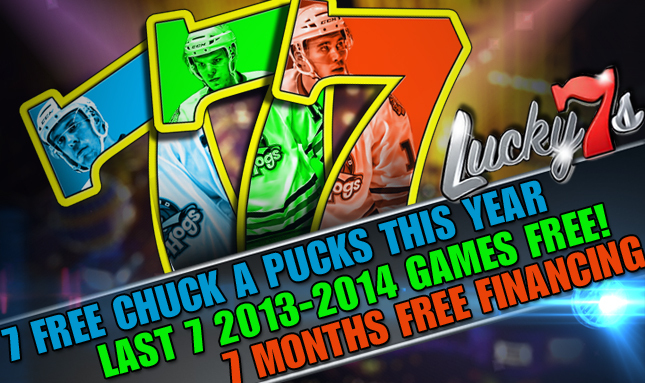 Receive free tickets with purchase of season tickets for next year. 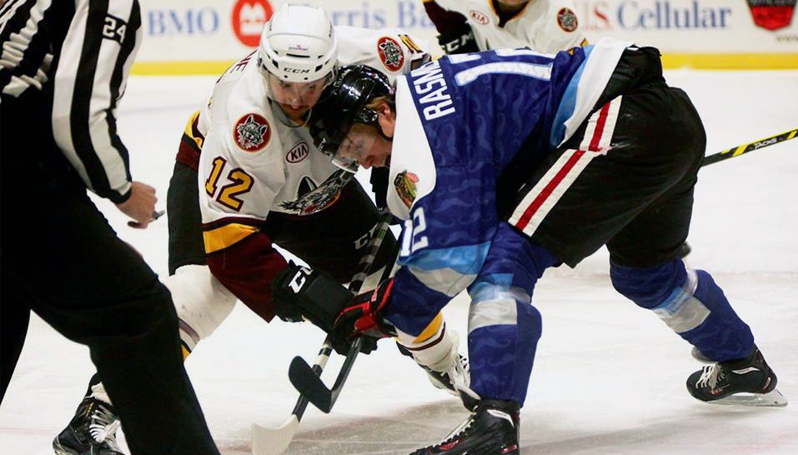 Pegged as a stay at home defenseman during his young career, Dahlbeck is now showing the ability that he can become an all-around blueliner. 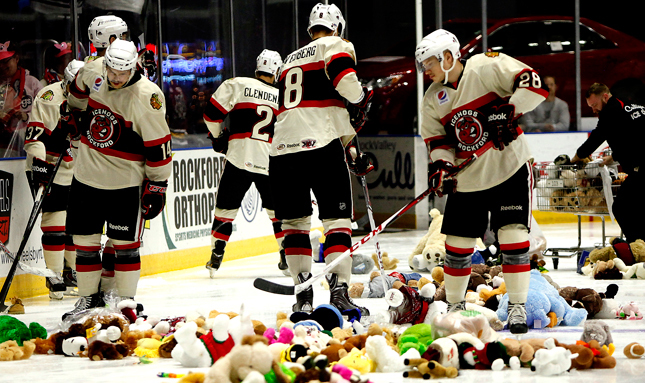 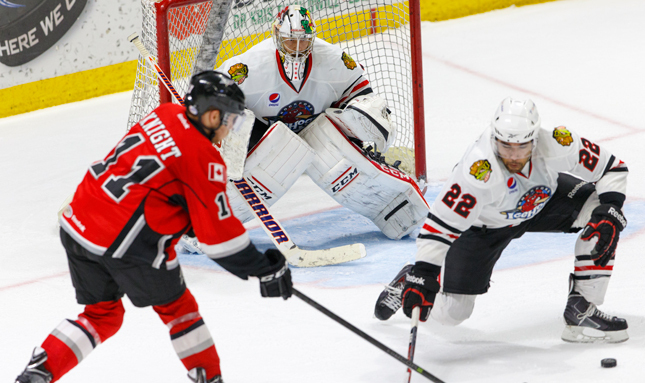 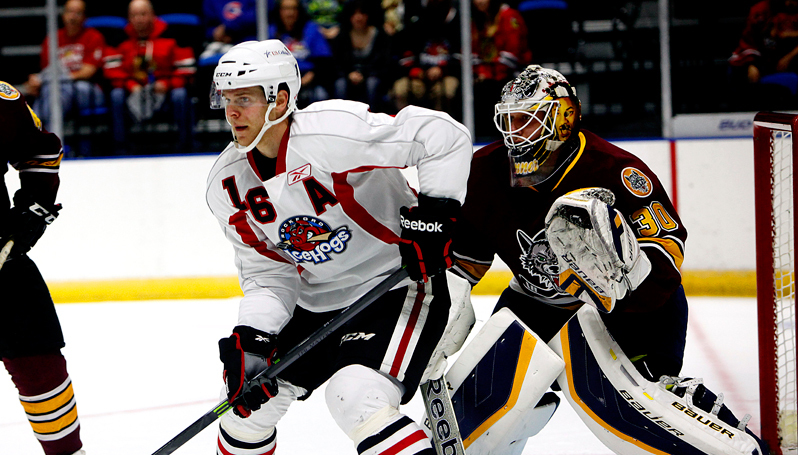 The IceHogs run point streak to 11 games (9-0-1-1) despite 5-4 OT loss to Barons. 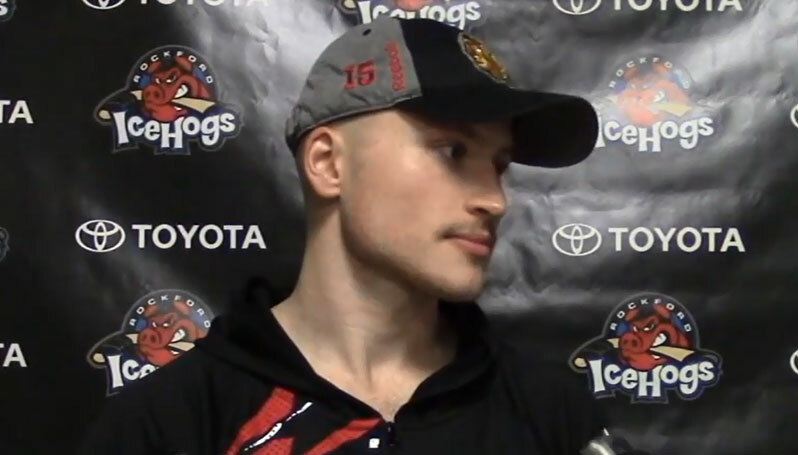 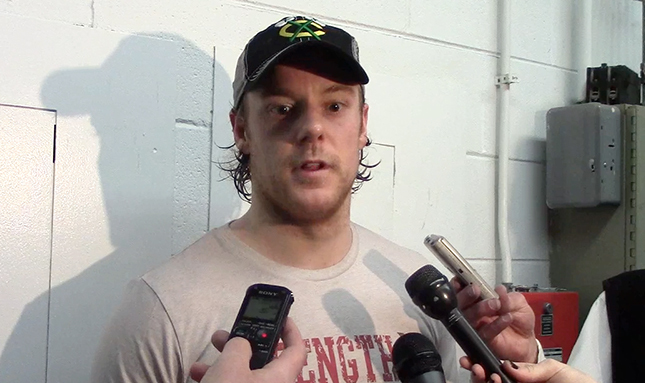 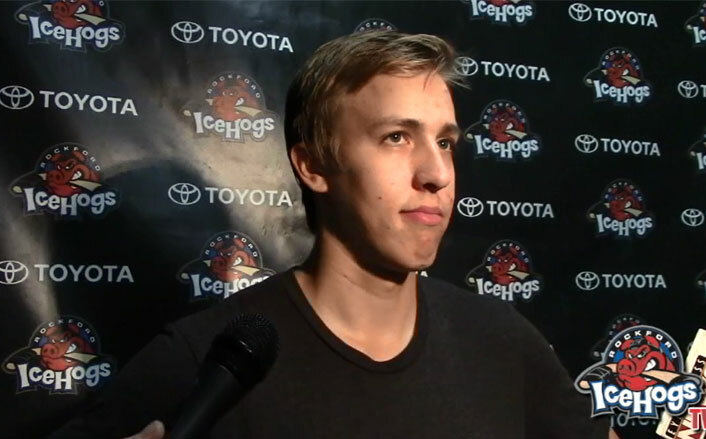 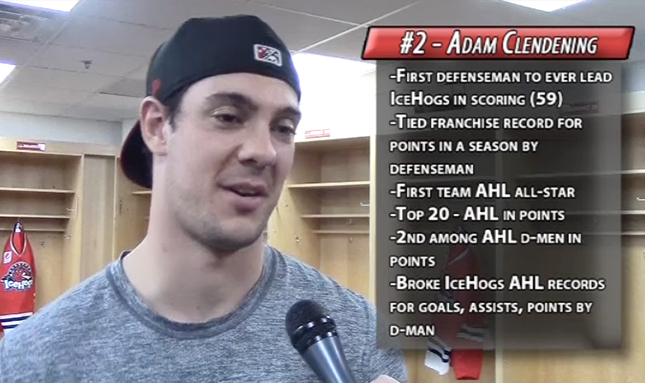 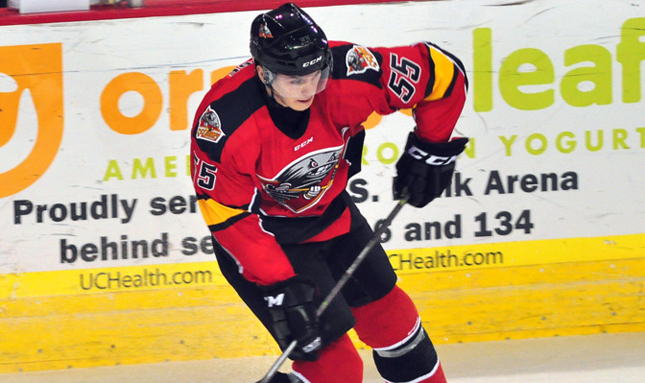 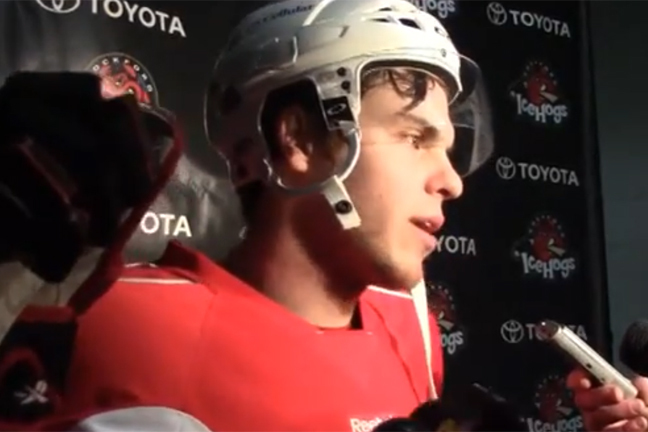 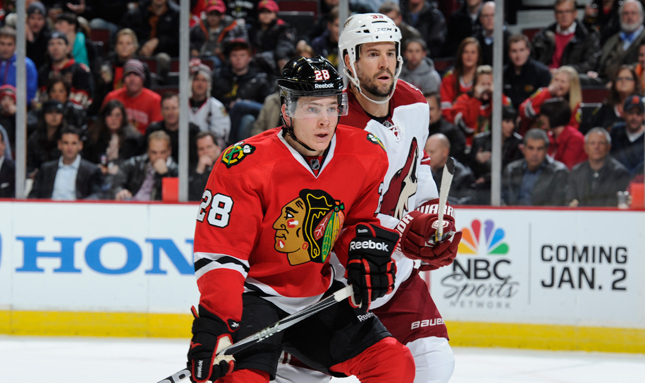 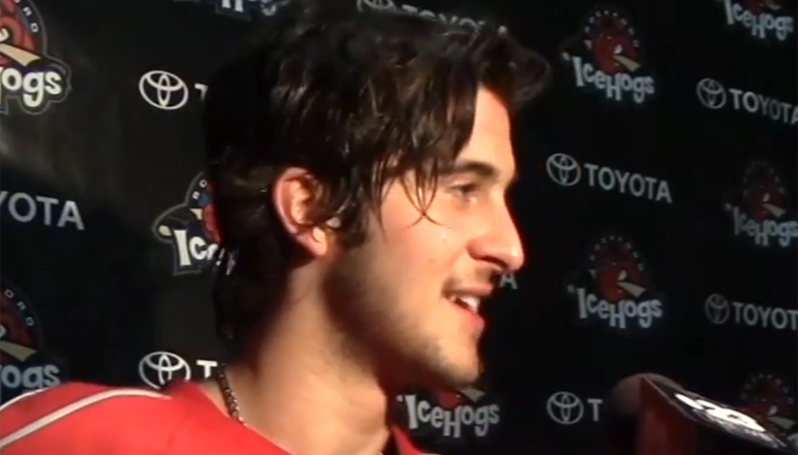 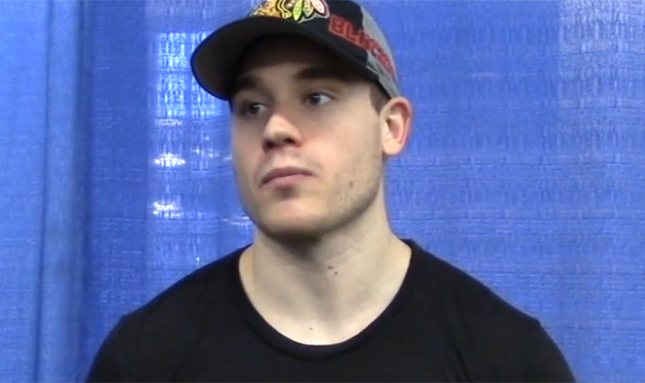 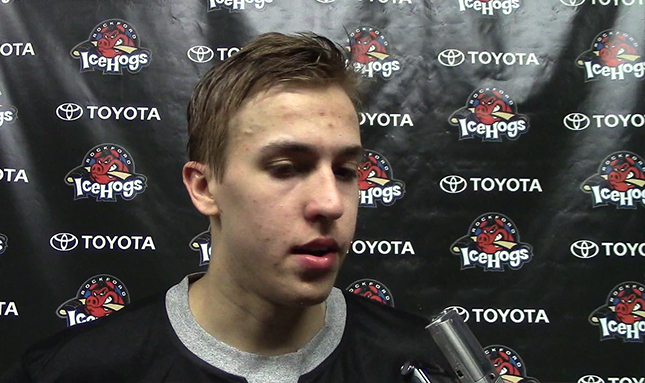 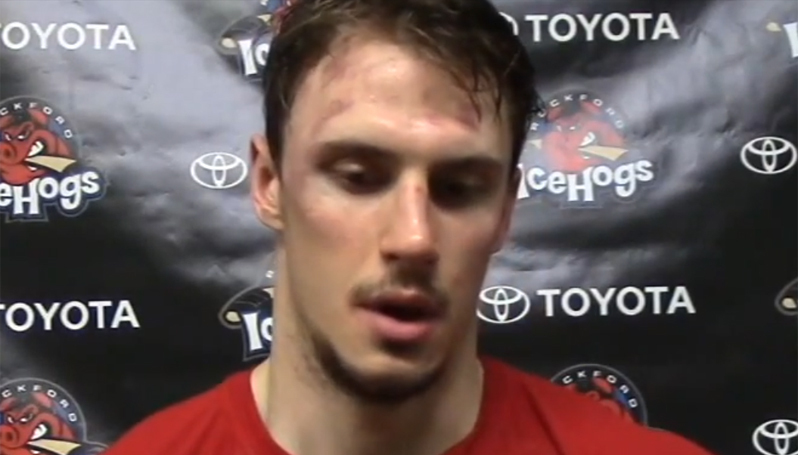 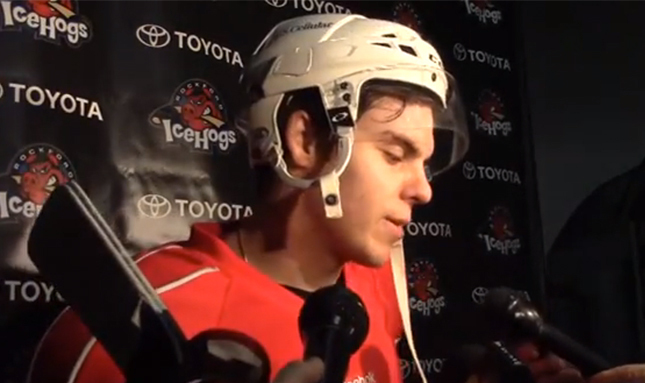 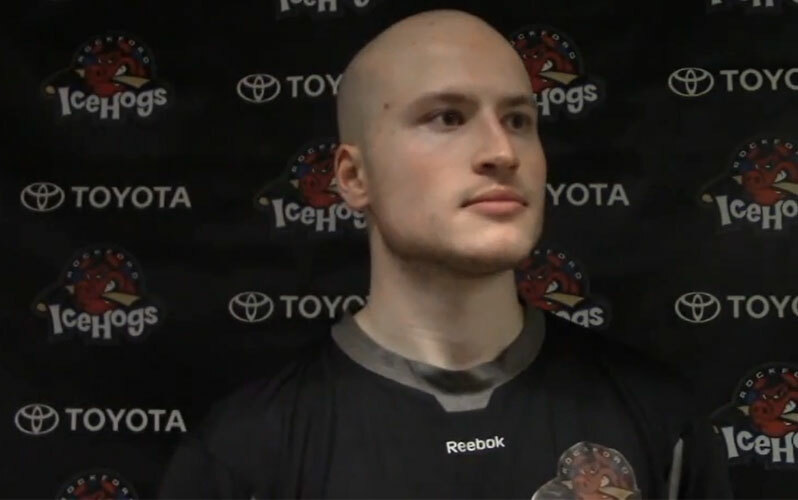 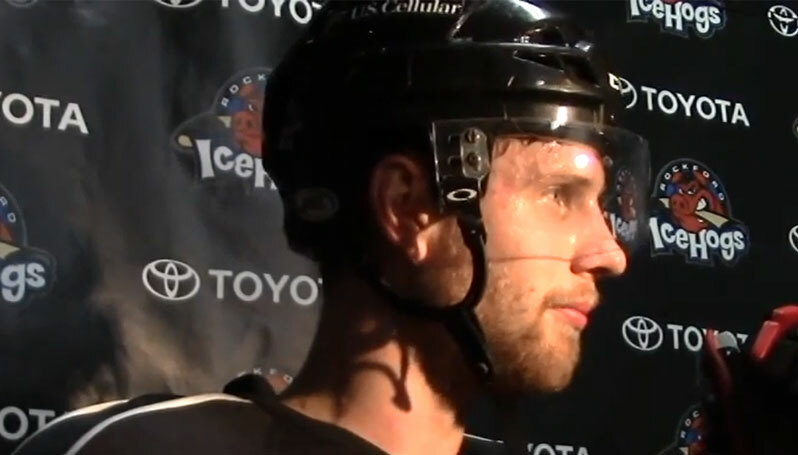 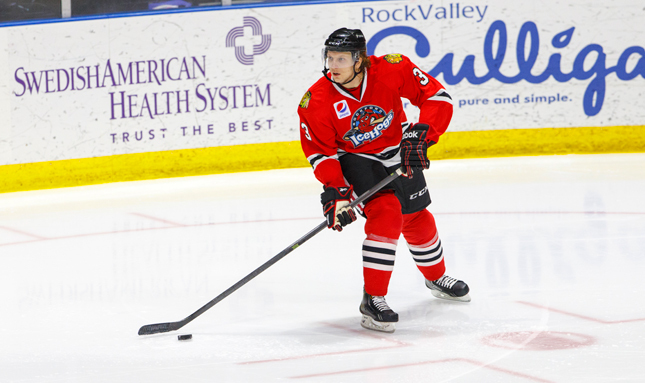 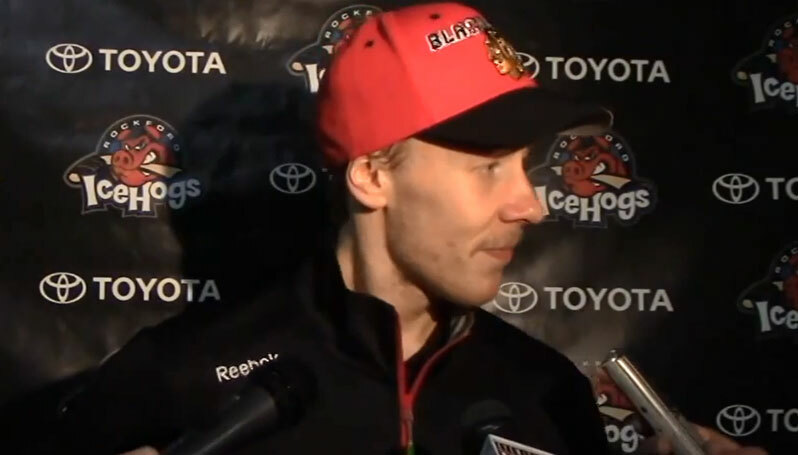 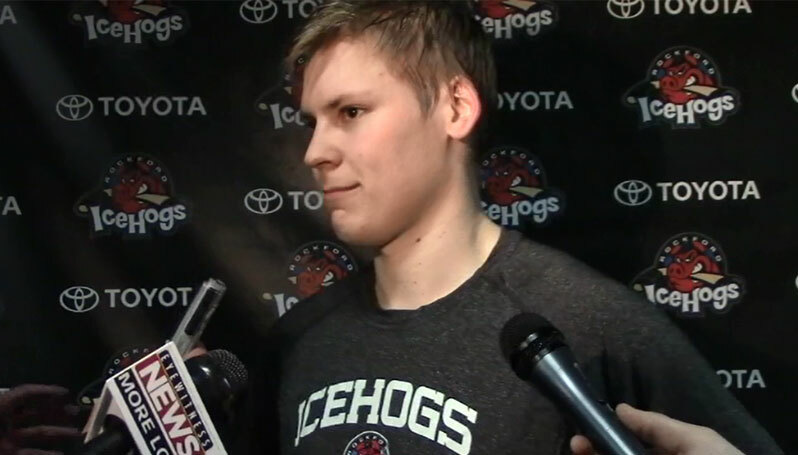 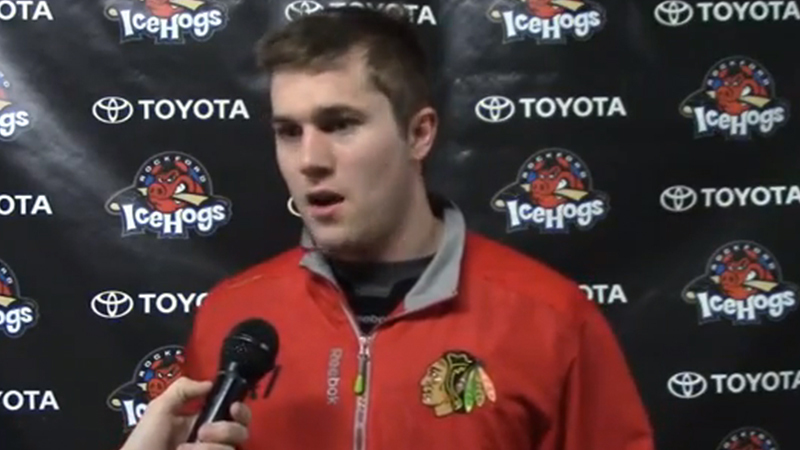 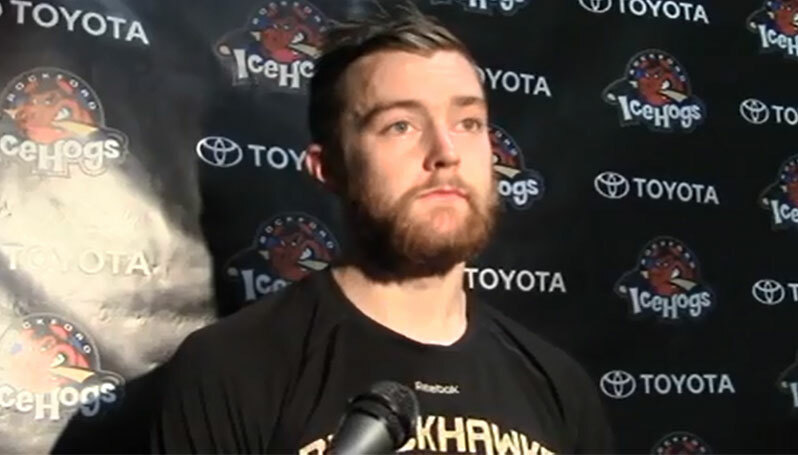 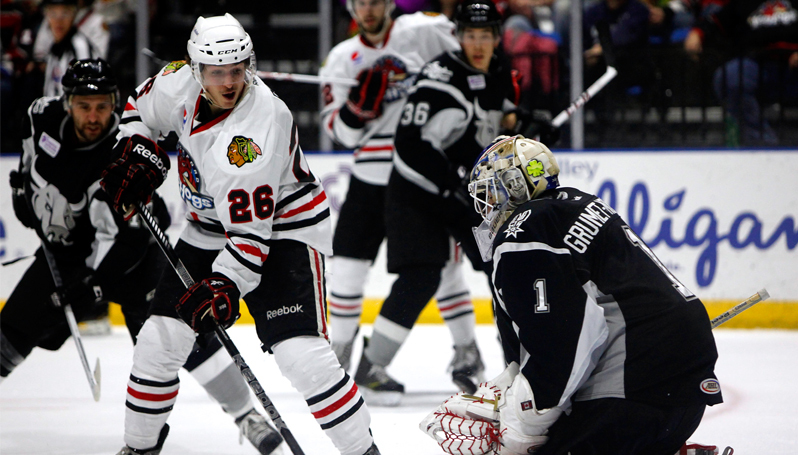 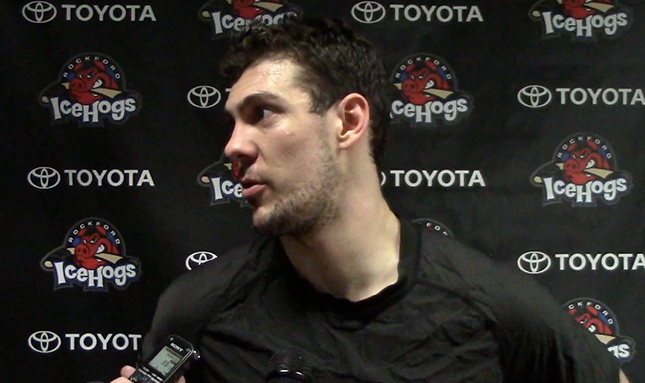 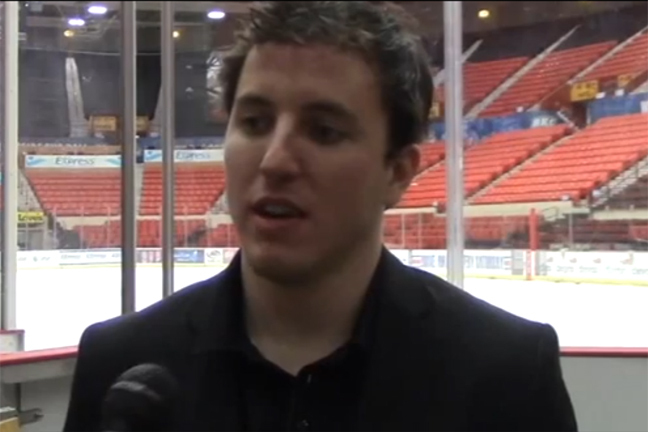 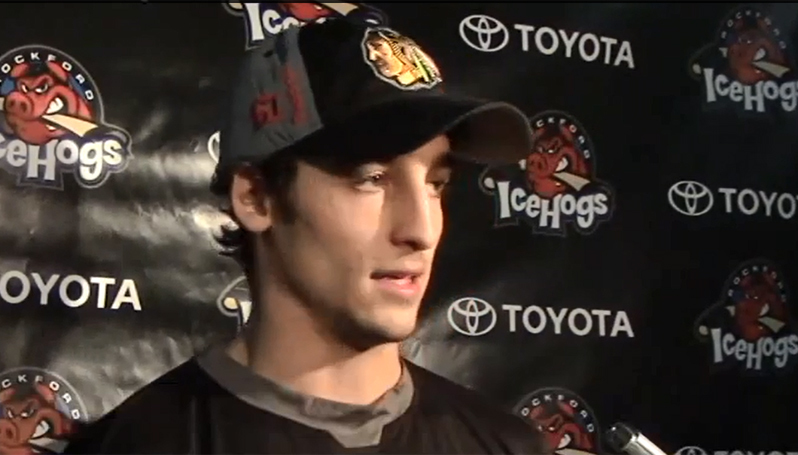 Recently acquired defenseman chats about his return to Rockford. 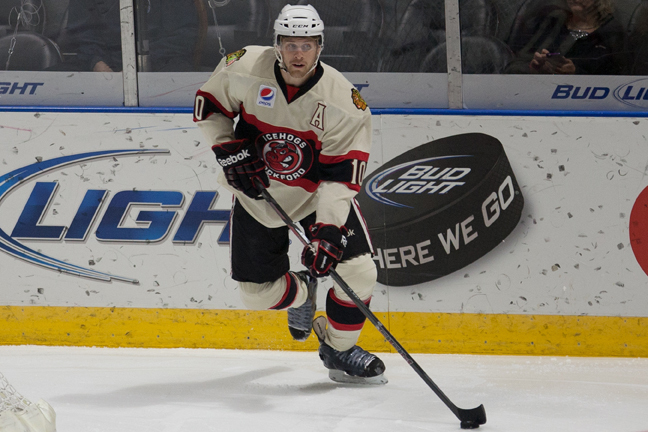 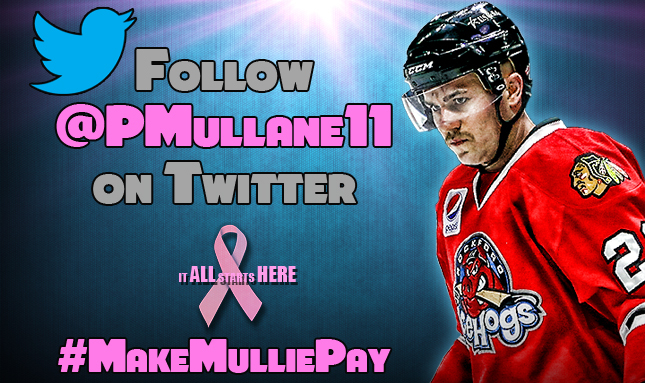 Rockford's all-time leading point producer acquired in exchange for Brad Winchester. 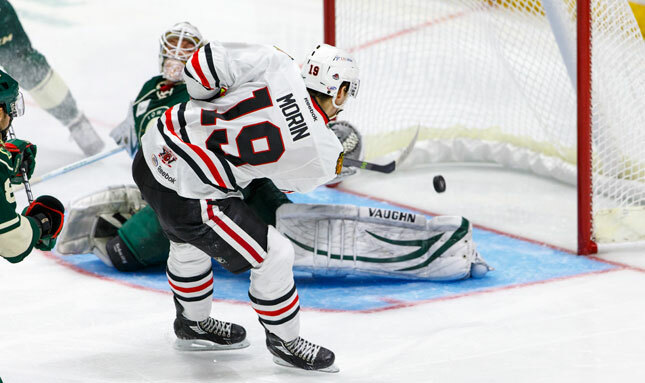 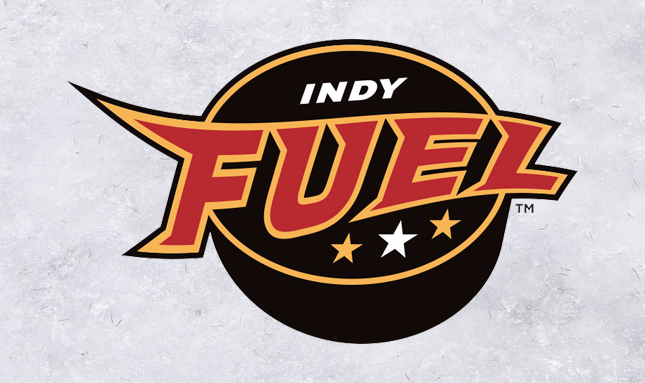 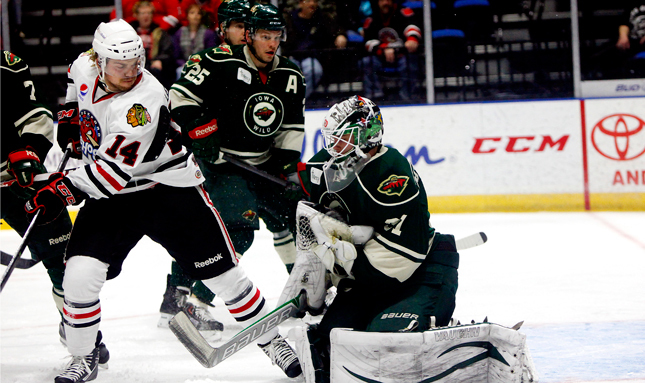 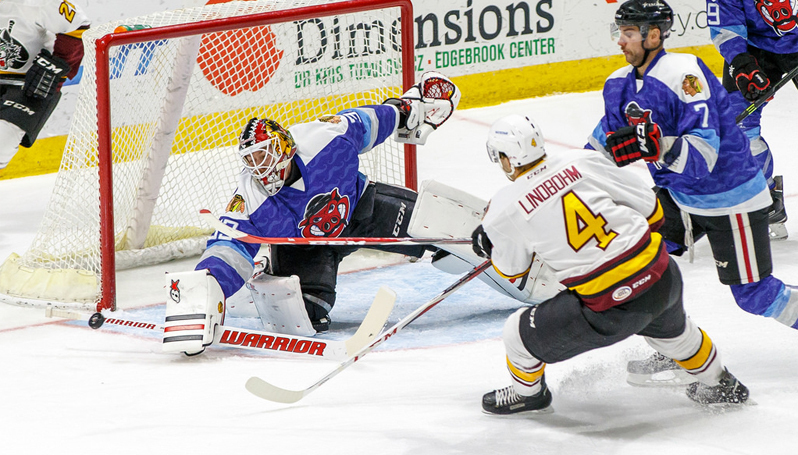 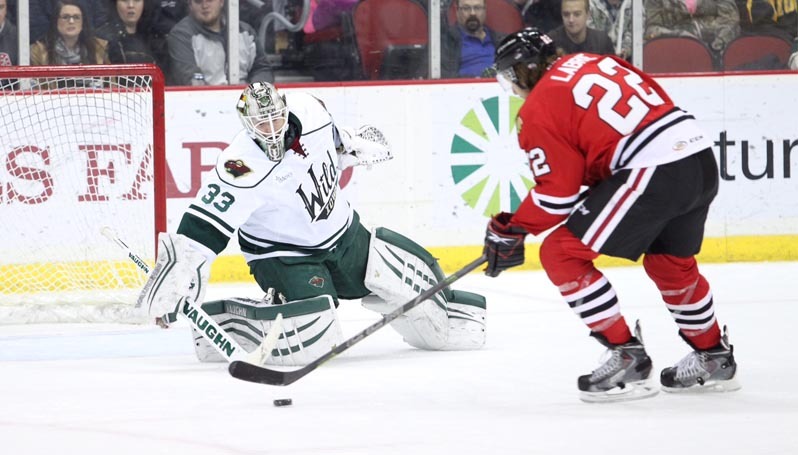 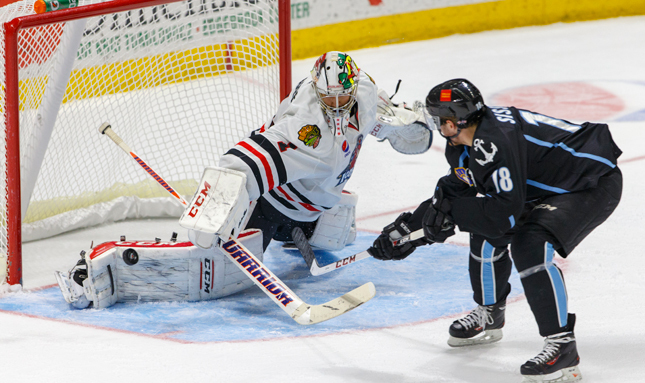 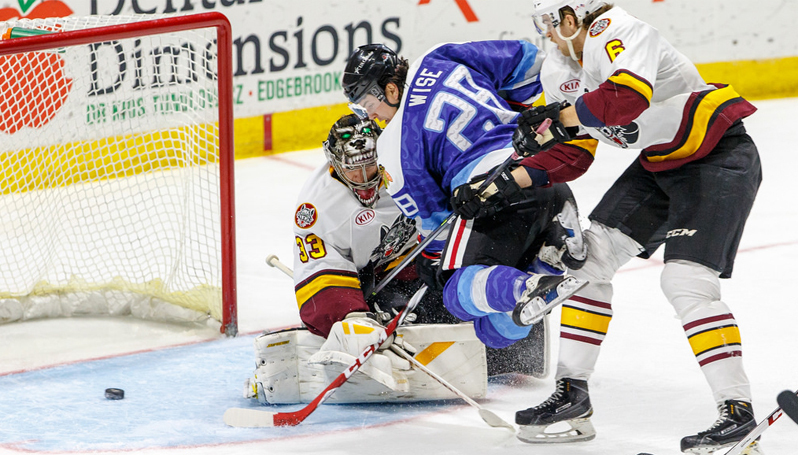 Jeremy Morin continued his tear in February, tallying twice, to lead Rockford to a 4-1 win over the Iowa Wild at the Wells Fargo Arena on Tuesday night. 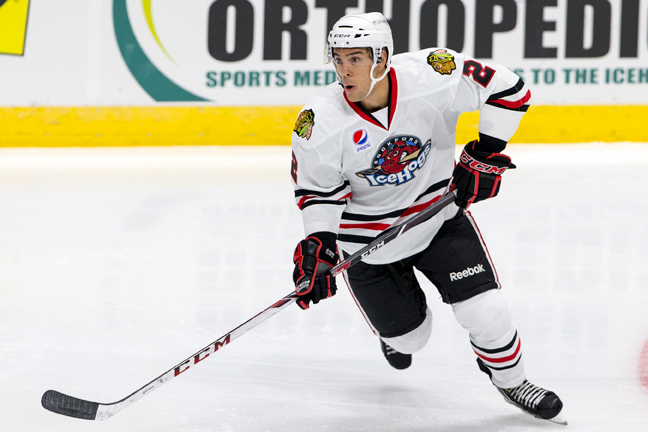 AHL hands defenseman Theo Peckham two game suspension. 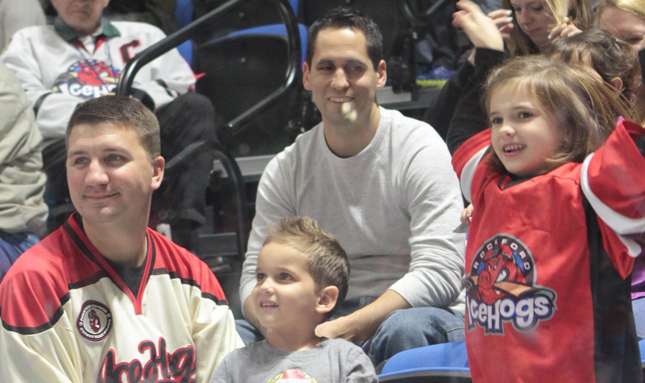 The Junior IceHogs got a visit from some of the big IceHogs. 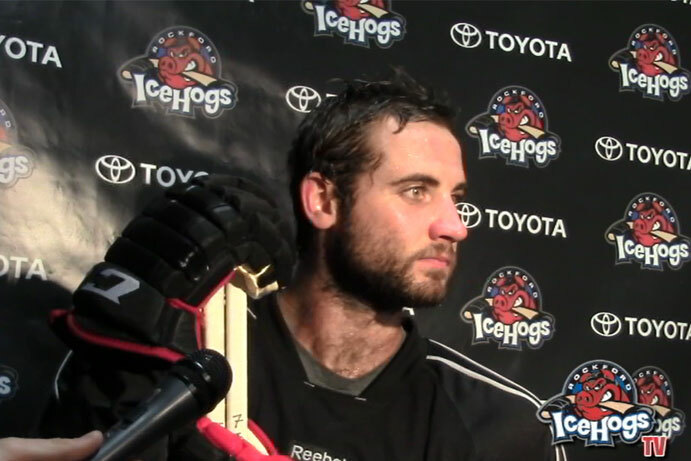 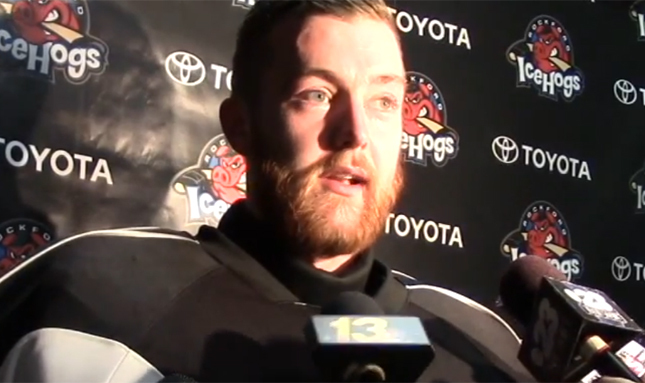 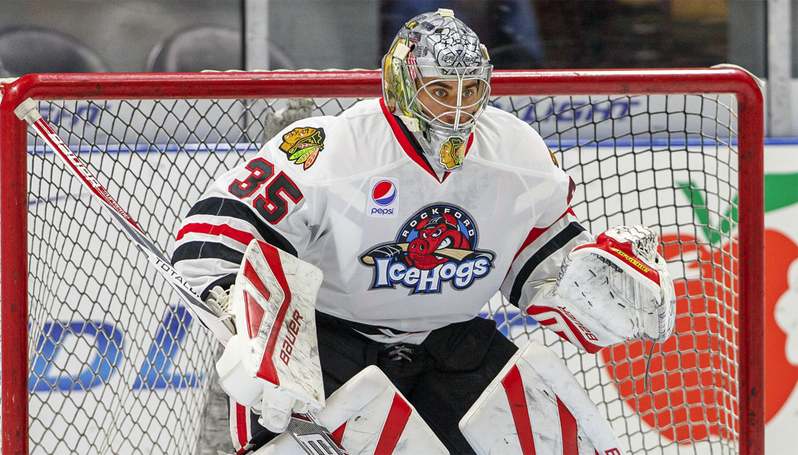 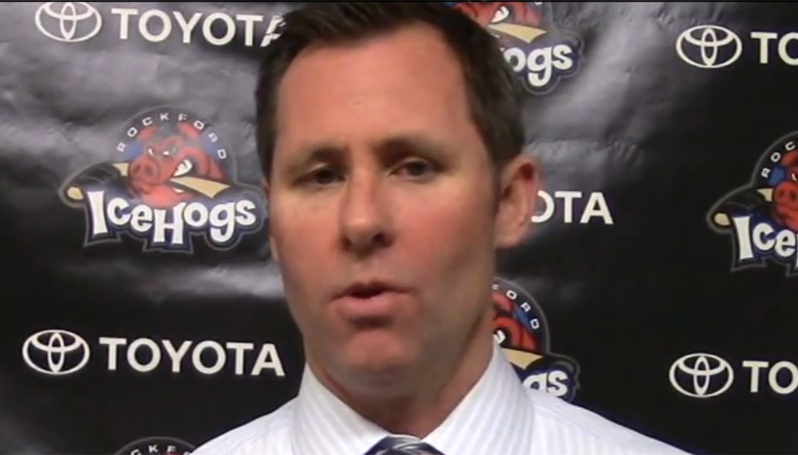 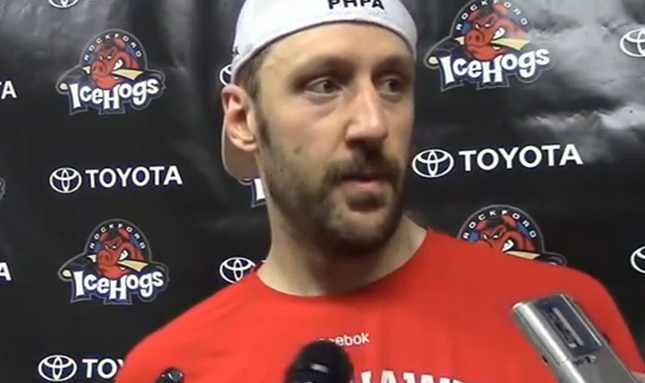 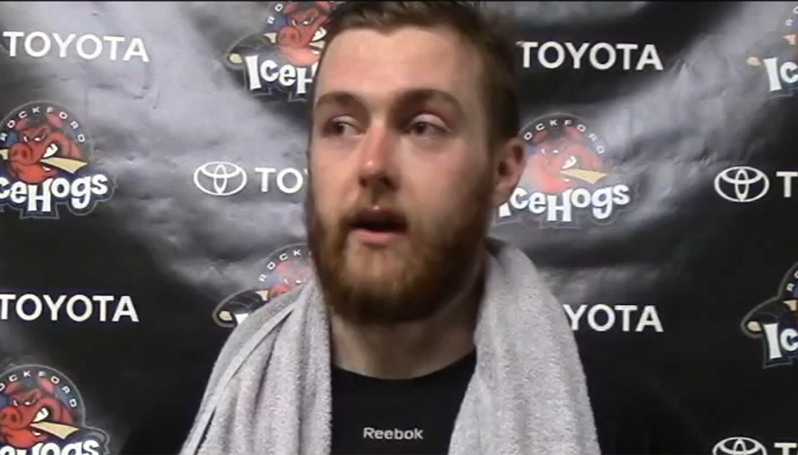 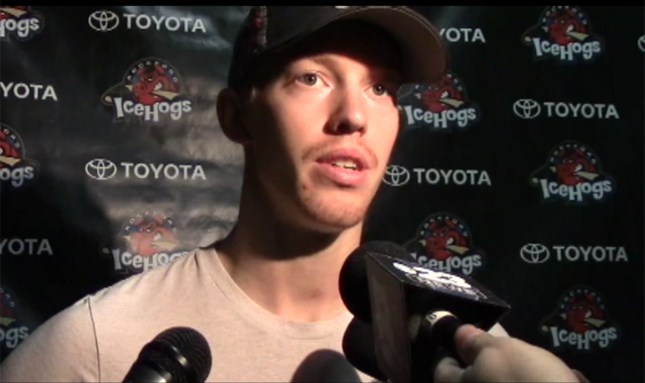 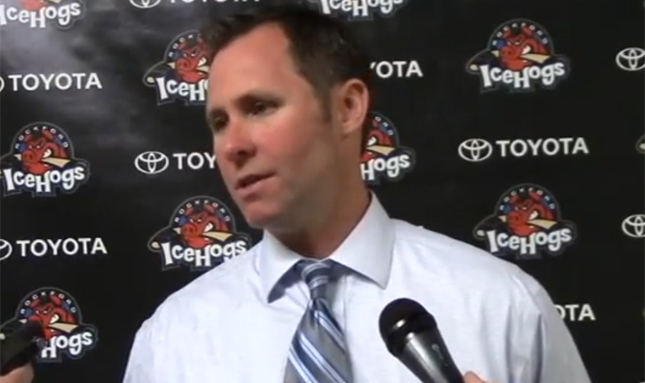 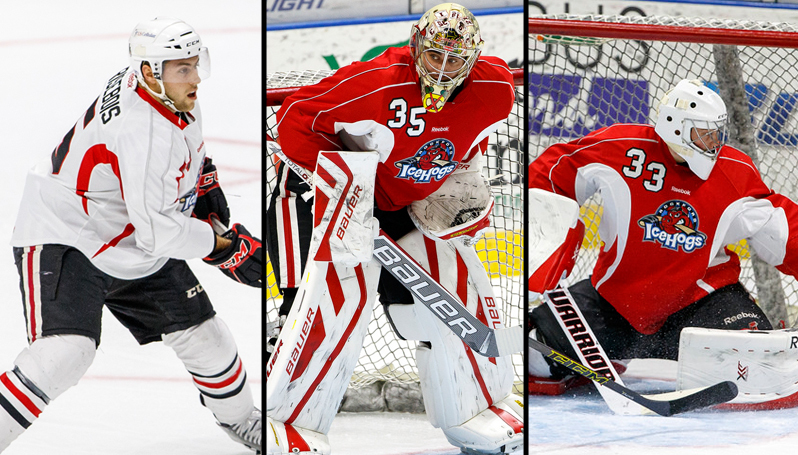 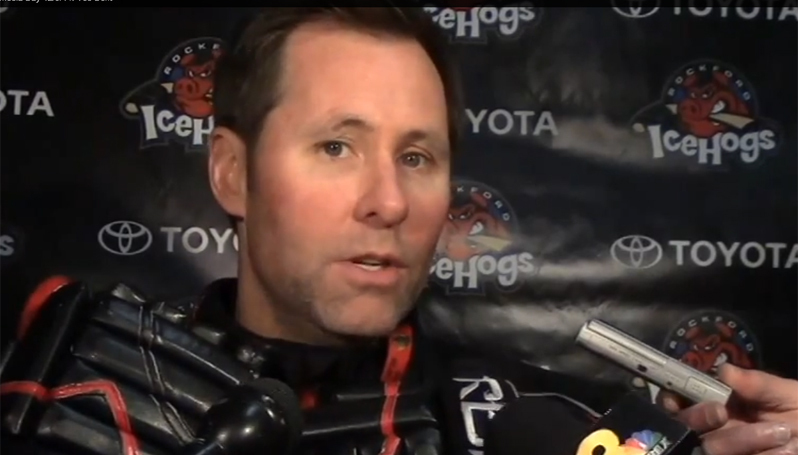 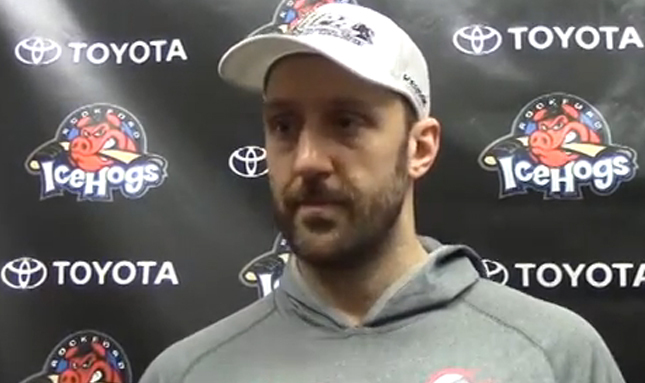 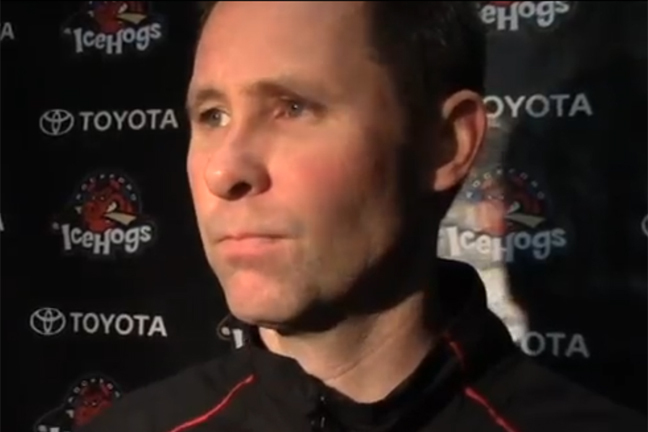 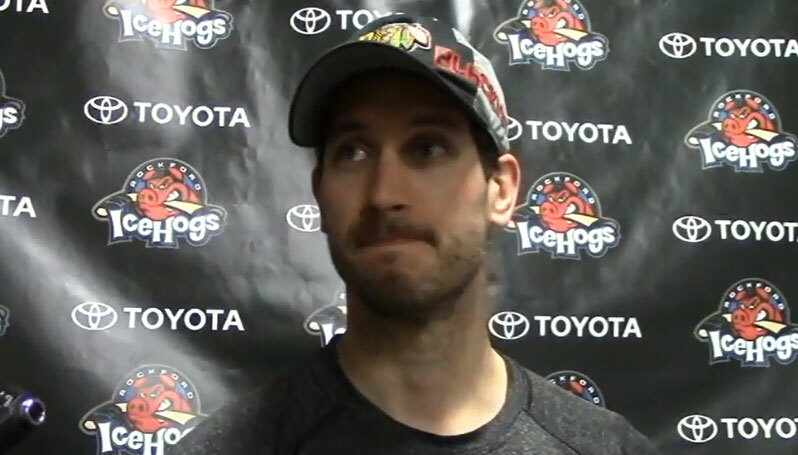 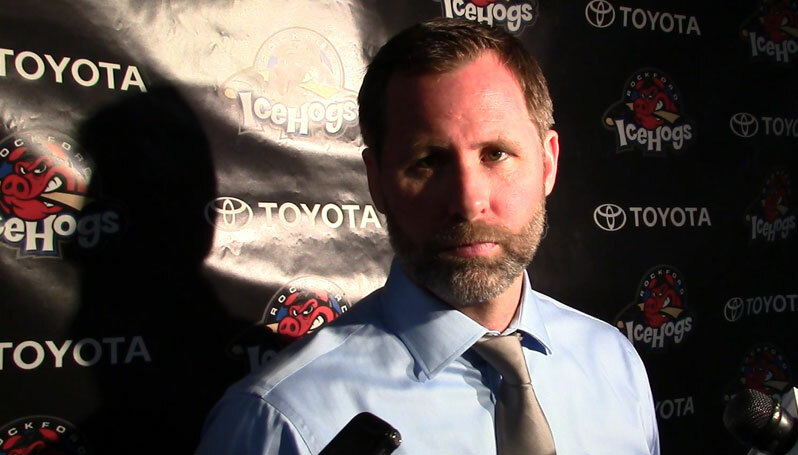 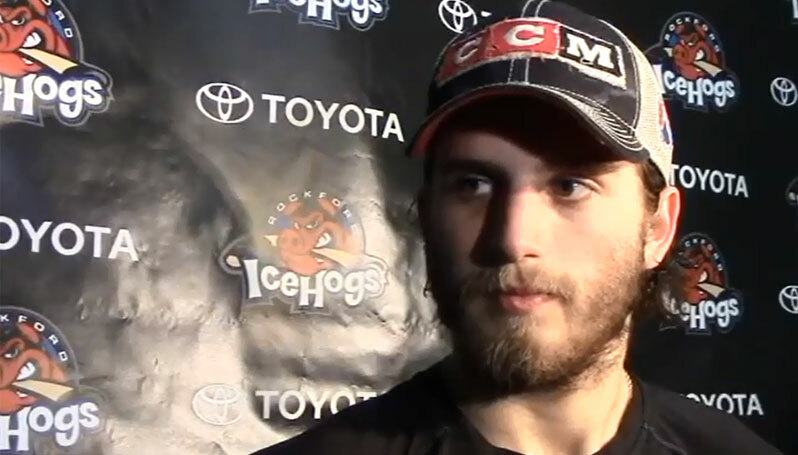 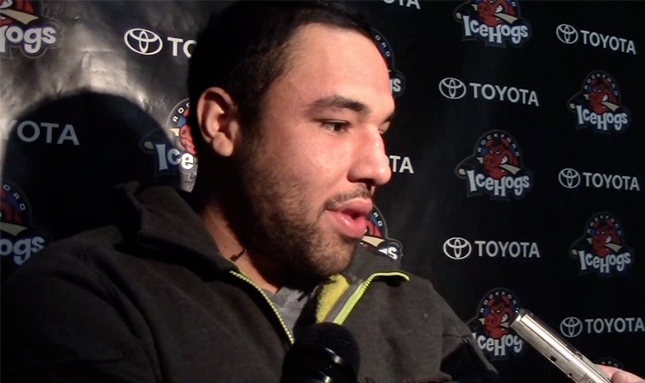 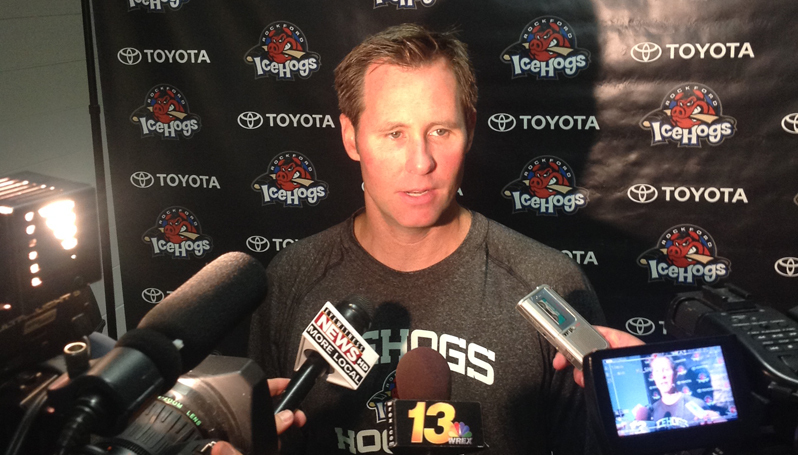 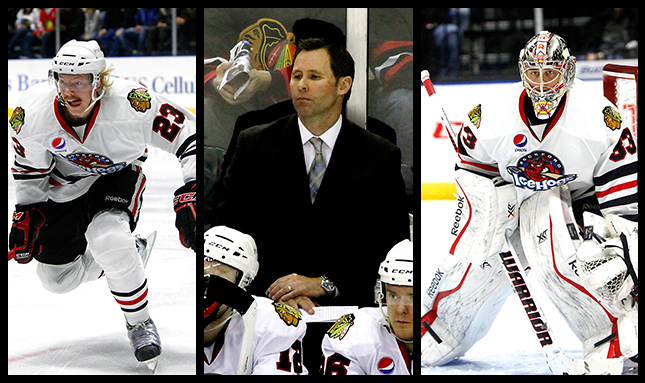 IceHogs Goaltender Jason LaBarbera, Forward Brandon Pirri, and Head Coach Ted Dent all react to a win over Chicago. 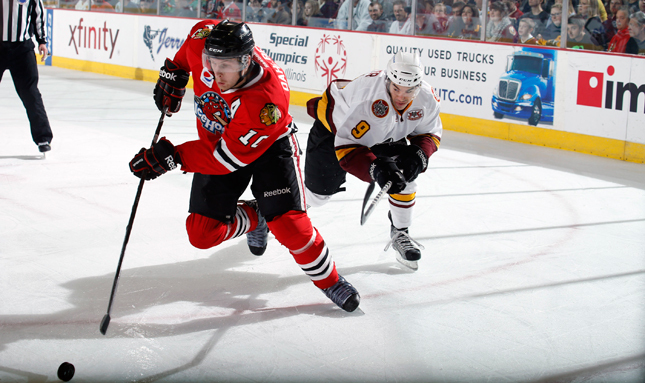 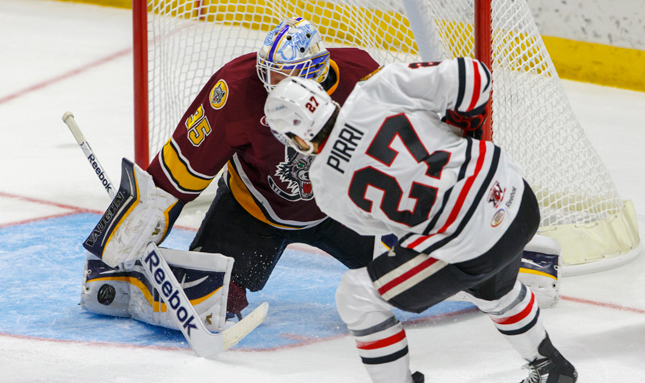 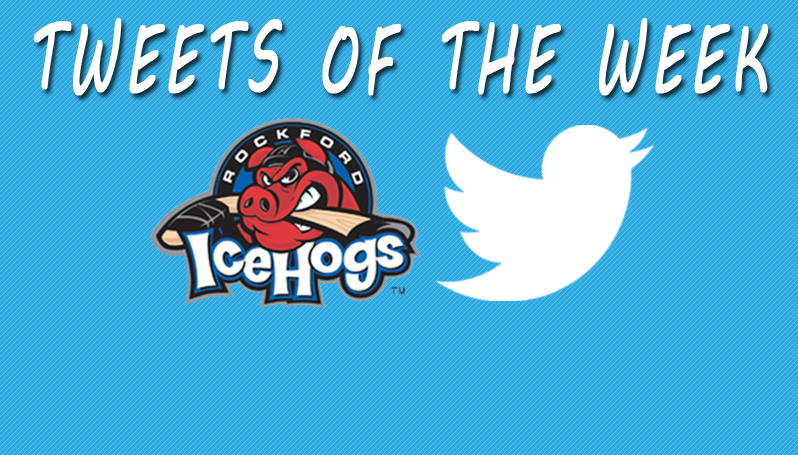 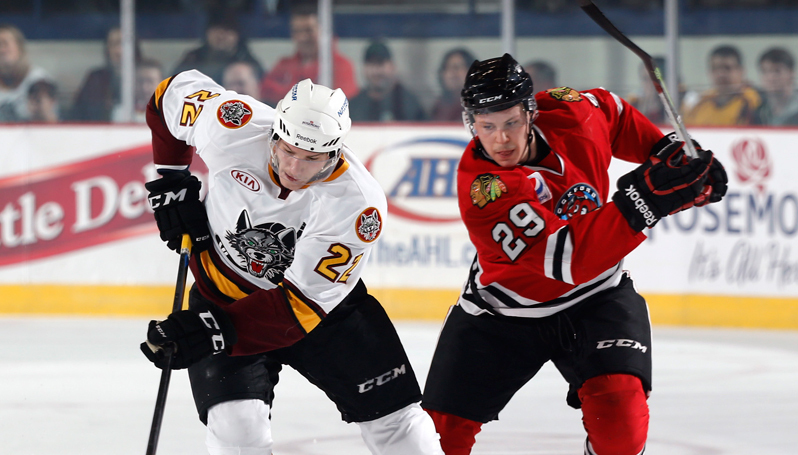 The Rockford IceHogs took down the Chicago Wolves 2-1 in front of a packed BMO Harris Bank Center. 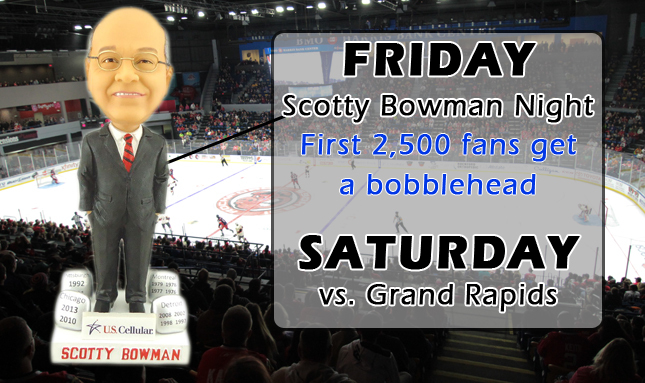 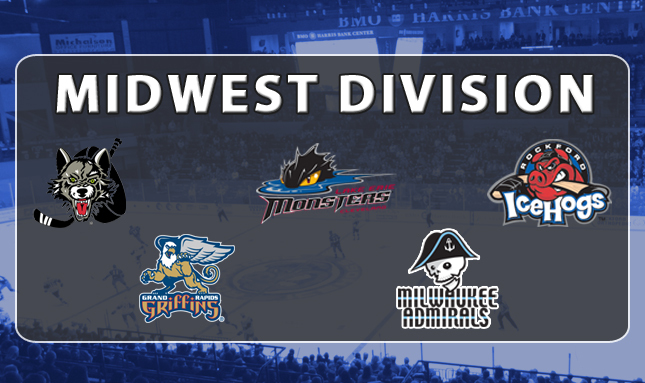 Two heated rivalries continue at the BMO on Friday and Saturday. 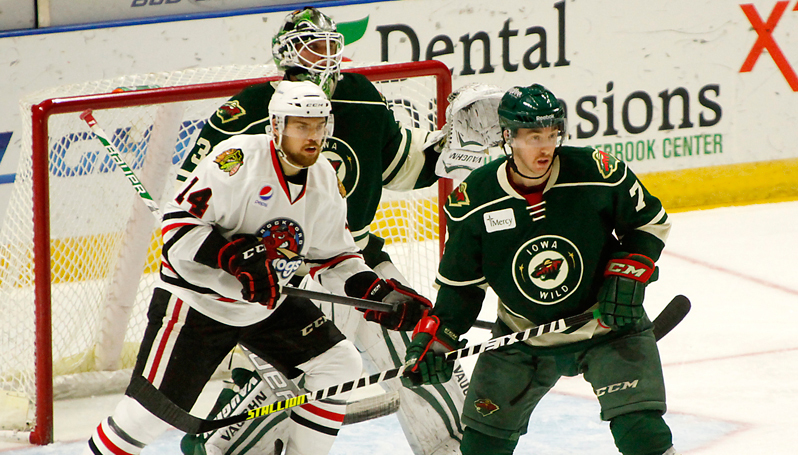 Des Moines, Iowa- Brandon Pirri scored twice to lead Hogs over Wild for second straight game. 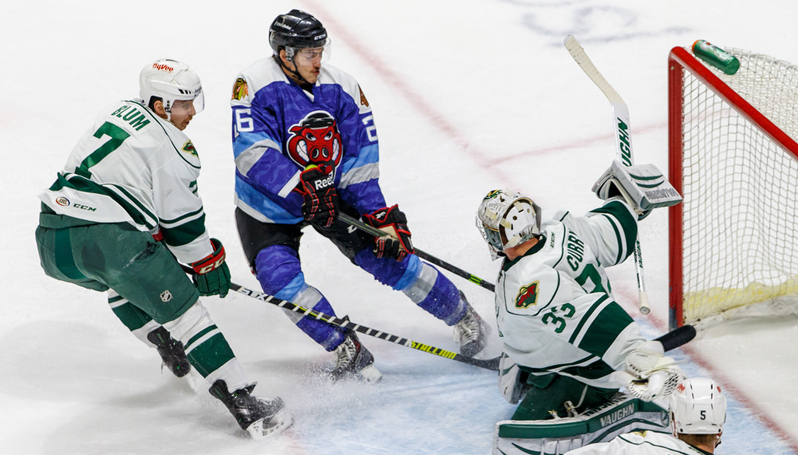 Des Moines, Iowa- Behind their red hot offense, the Rockford IceHogs knocked off the Iowa Wild 5-3 on Saturday in a key Midwest Division game at the Wells Fargo Arena. 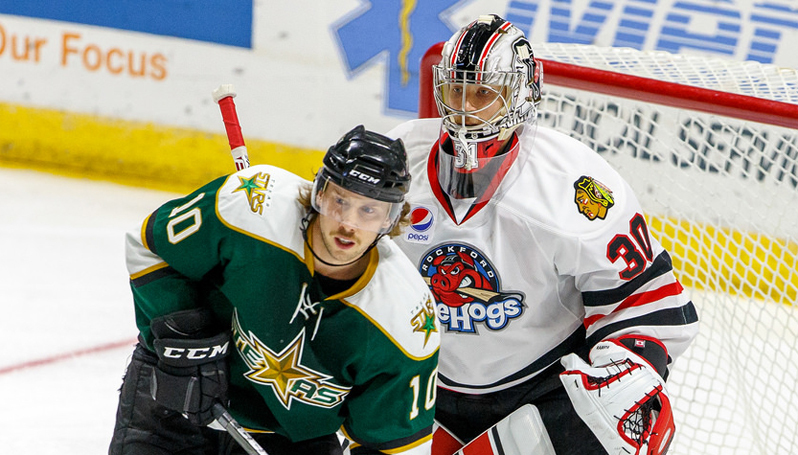 Hogs finish four game homestand with 3-0-0-1 record. 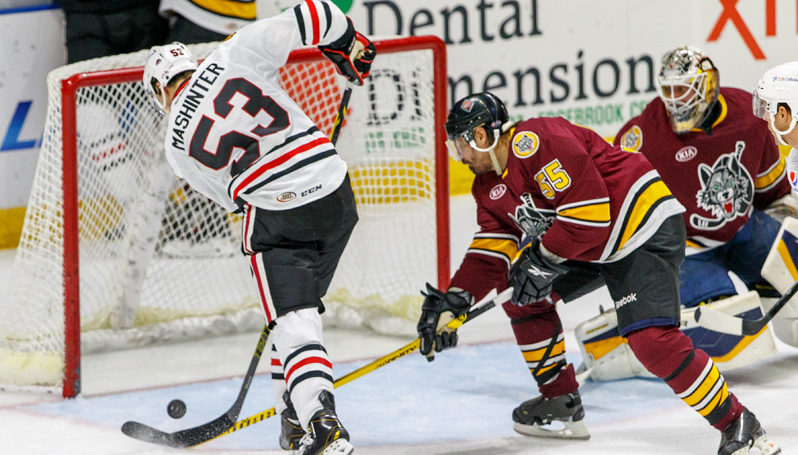 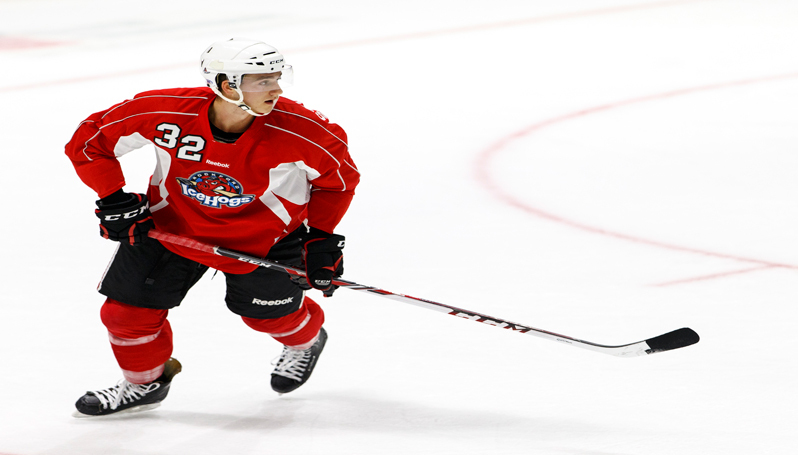 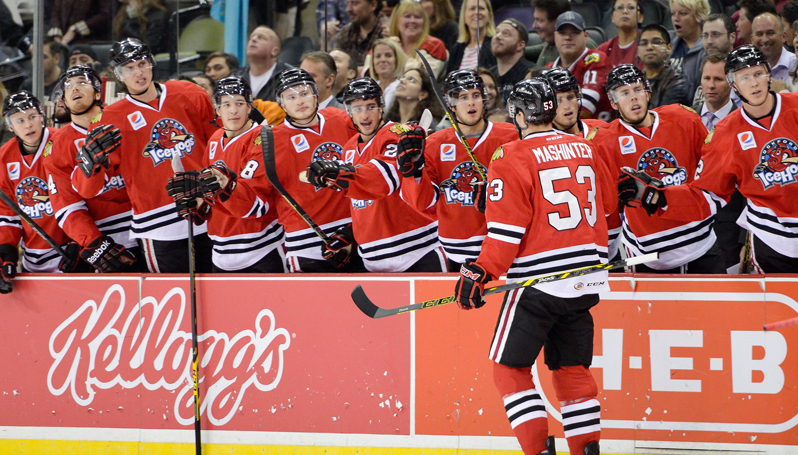 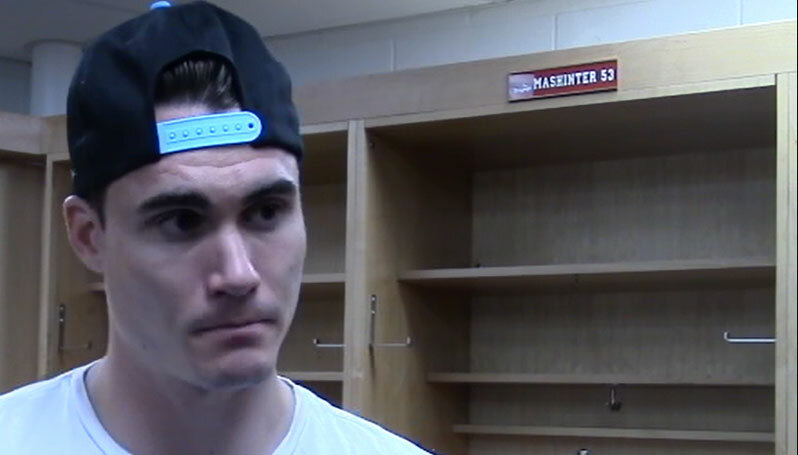 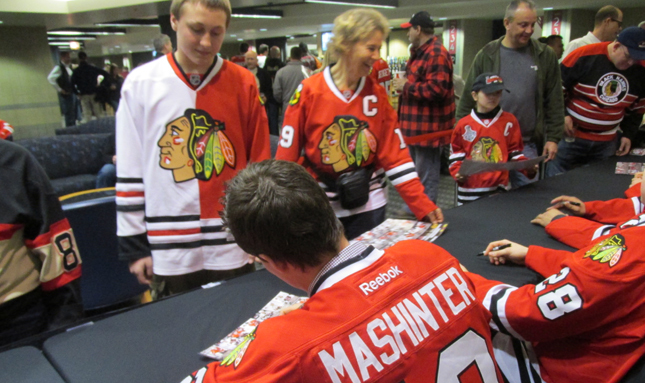 A look at Brandon Mashinter's road to Rockford and NHL aspirations. 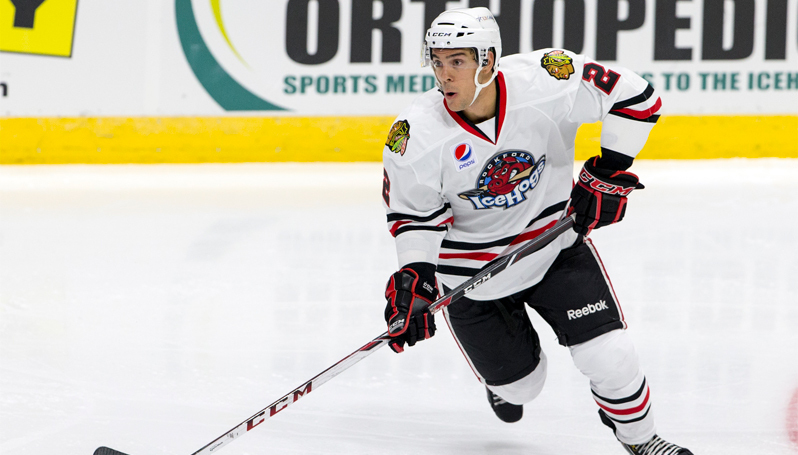 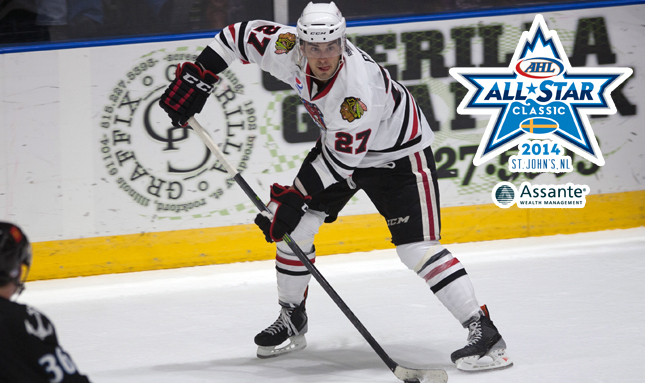 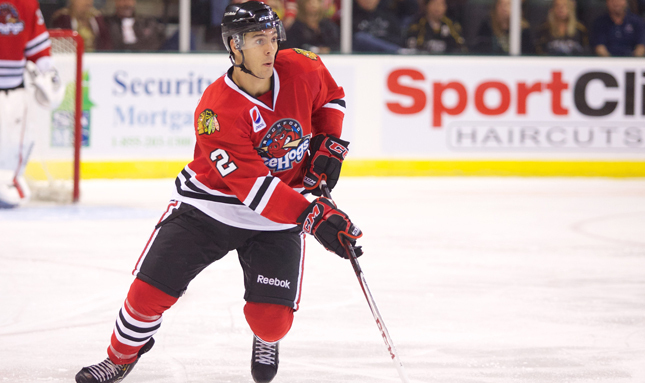 Watch IceHogs center Brandon Pirri on Tuesday at the AHL's Skills Competition. 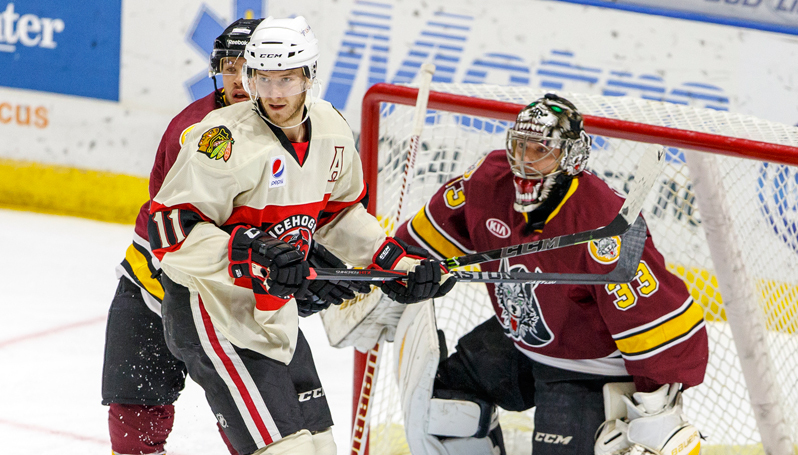 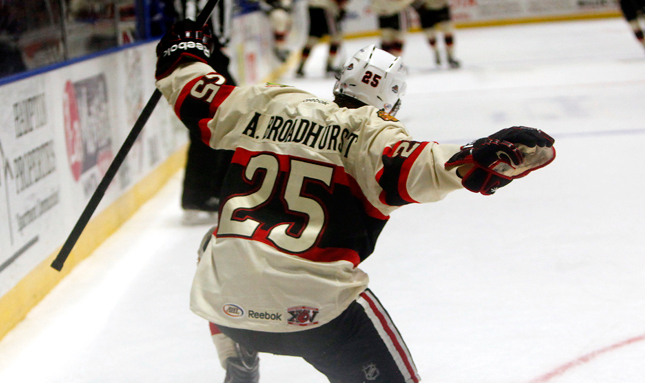 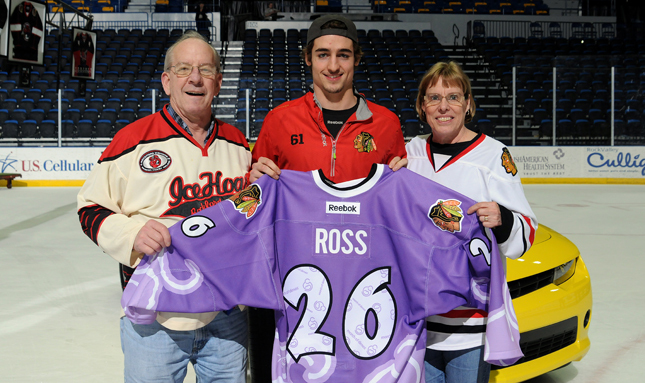 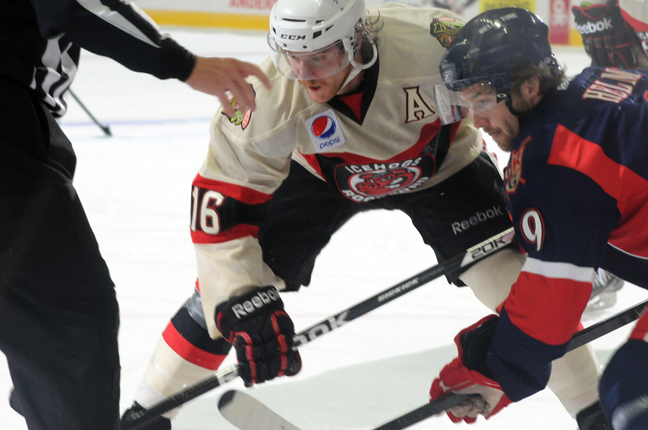 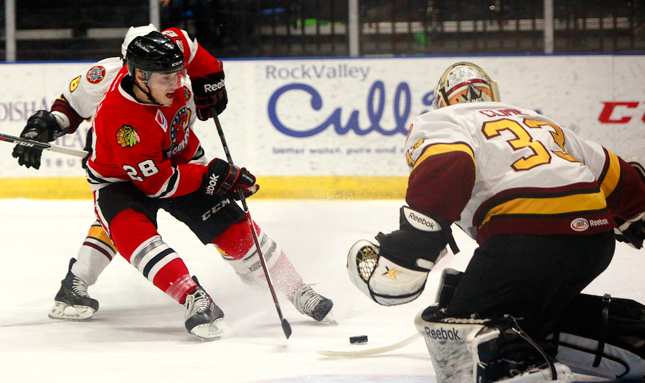 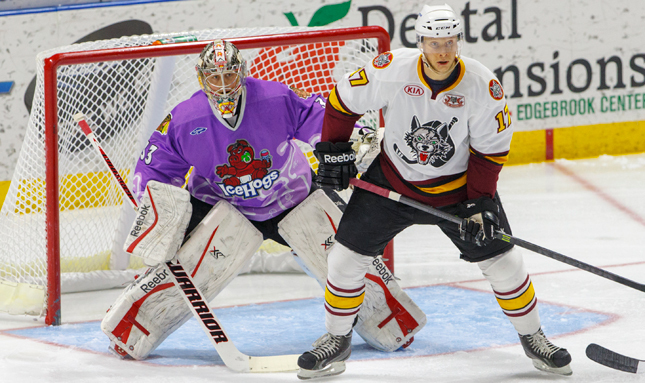 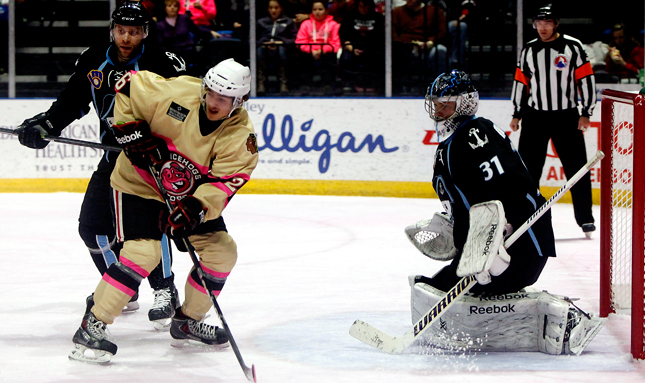 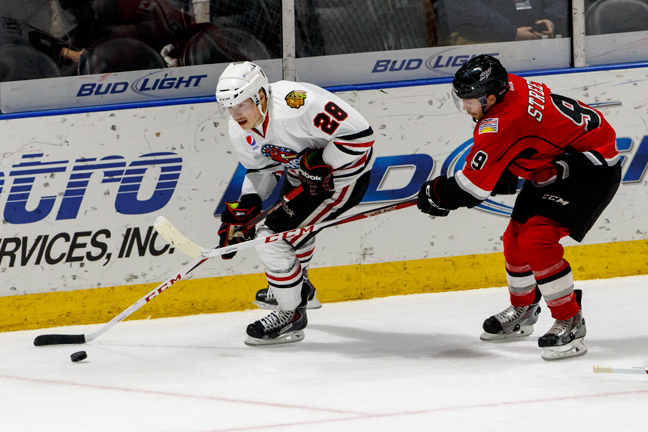 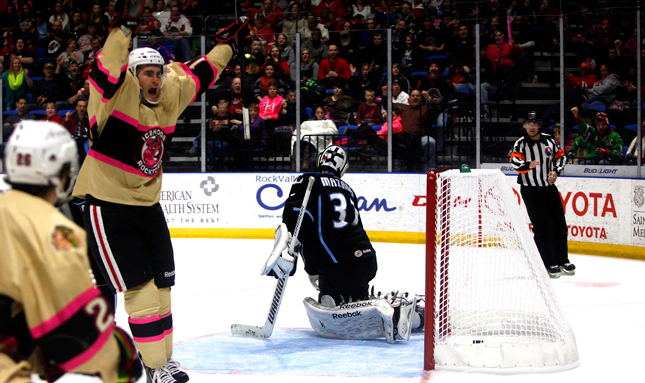 Rockford, Ill. – Terry Broadhurst set up Alex Broadhurst for the overtime game winner on Sunday over Utica. 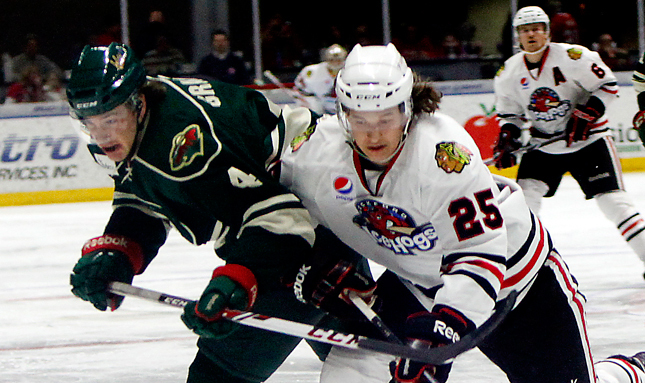 Morin and Danault lead offensive assault over Wild. 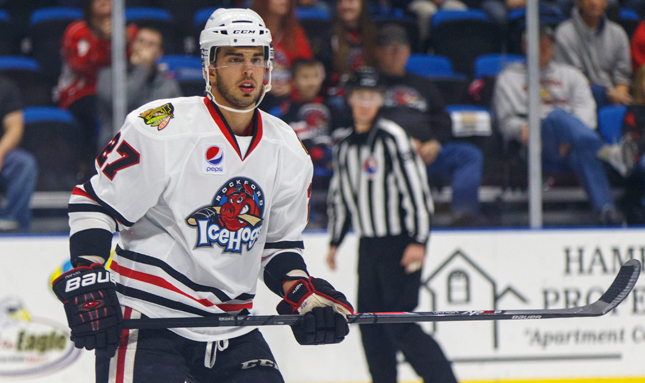 Chicago, Ill.-The Chicago Blackhawks assign Brandon Pirri to Rockford along with Pierre-Marc Bouchard after trade with Islanders. 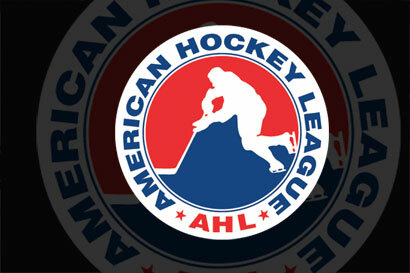 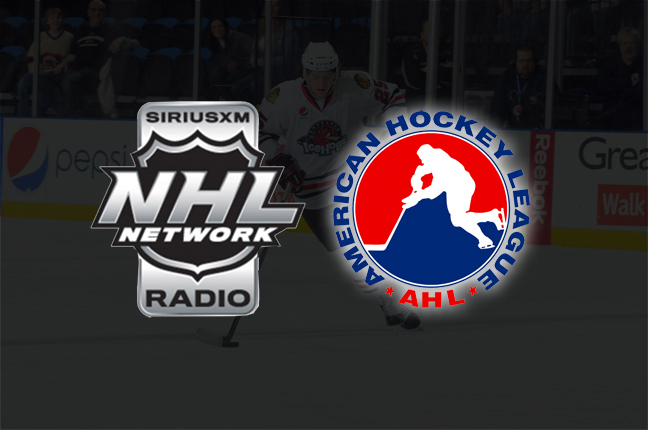 Springfield, Mass.-The American Hockey League announced today that AHL action will be heard live on SiriusXM NHL Network Radio this month. 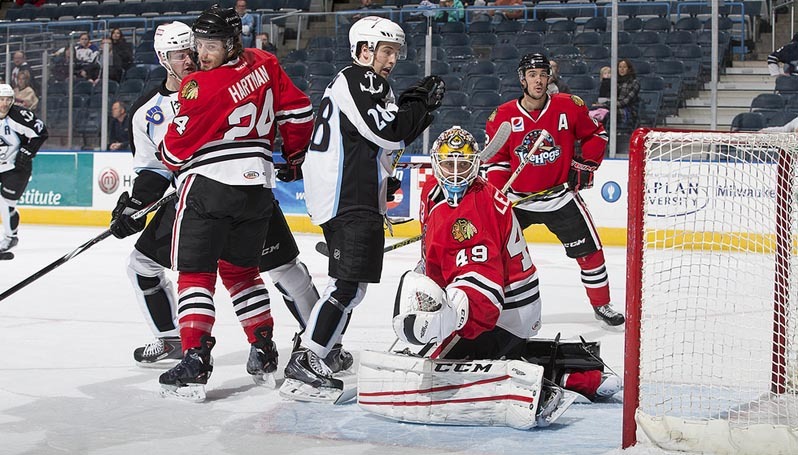 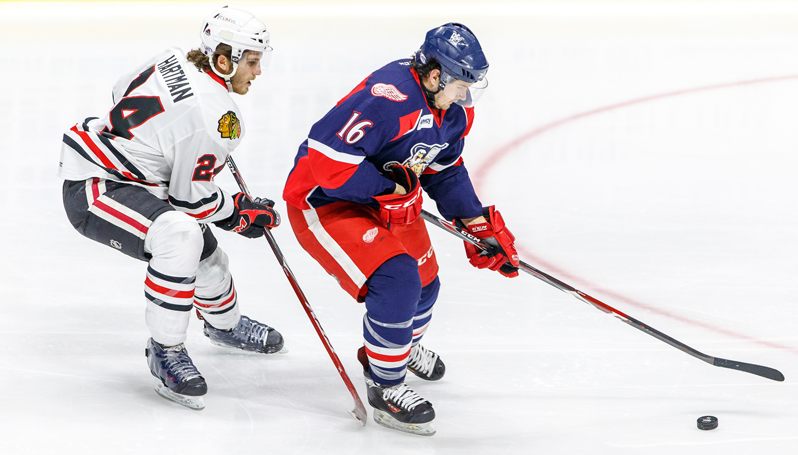 Rockford, Ill. – In a game that wasn’t over until the final minutes, the Rockford IceHogs walked away with a 6-4 win against the Hamilton Bulldogs on Tuesday night. 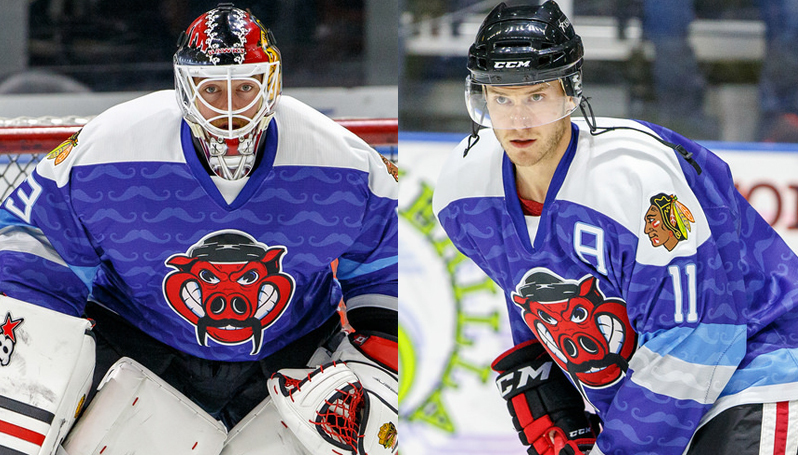 Rockford, Ill. - IceHogs Head Coach Ted Dent, Forward Pat Mullane, and Goaltender Kent Simpson get ready for Tuesday nights game against the Hamilton Bulldogs. 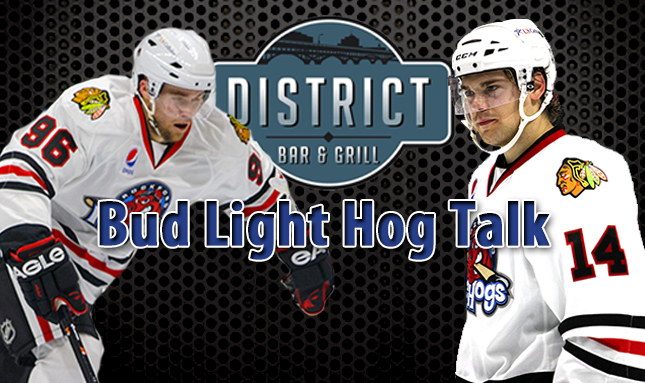 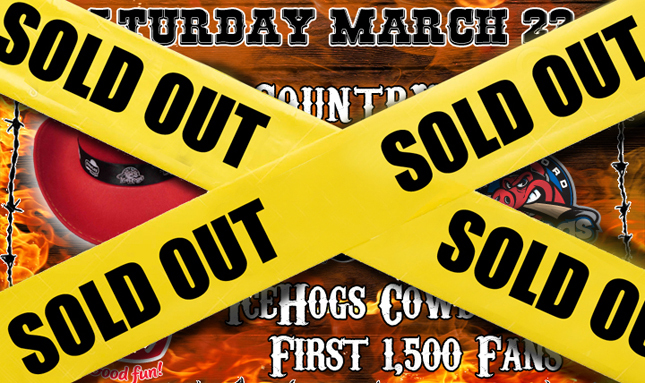 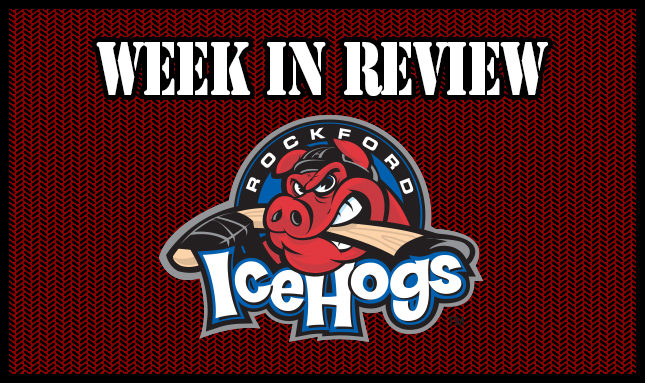 Rockford, Ill.- The IceHogs pick up two points on a short weekend and Hog Talk returns after a two week hiatus. 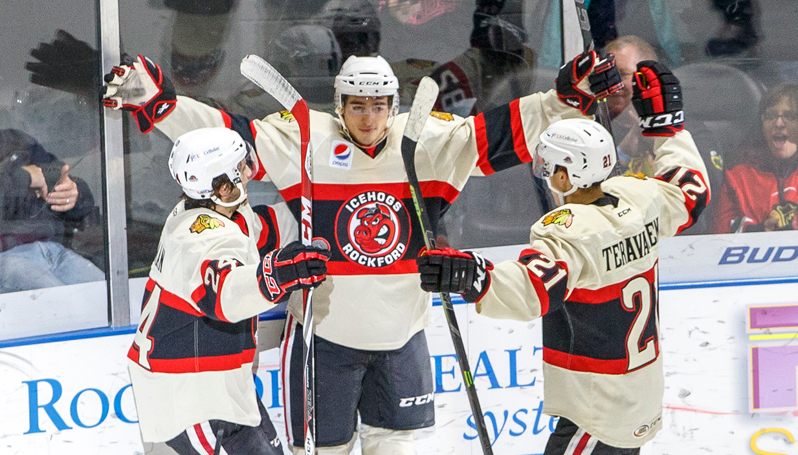 Rockford split a pair of games in Week 18, including a win in their first ever meeting with Utica. 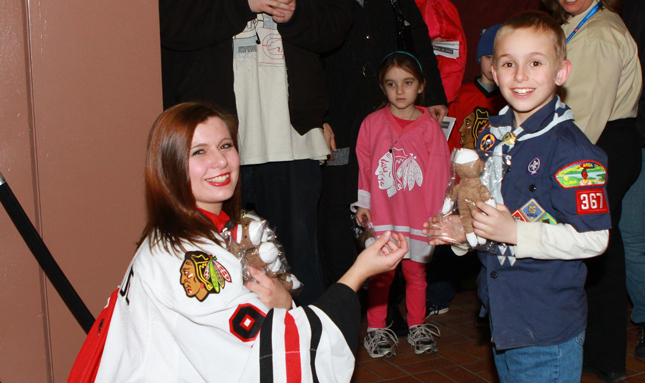 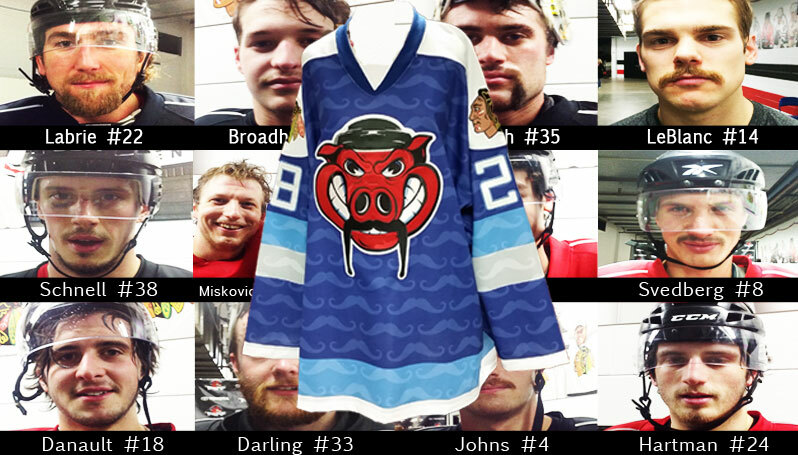 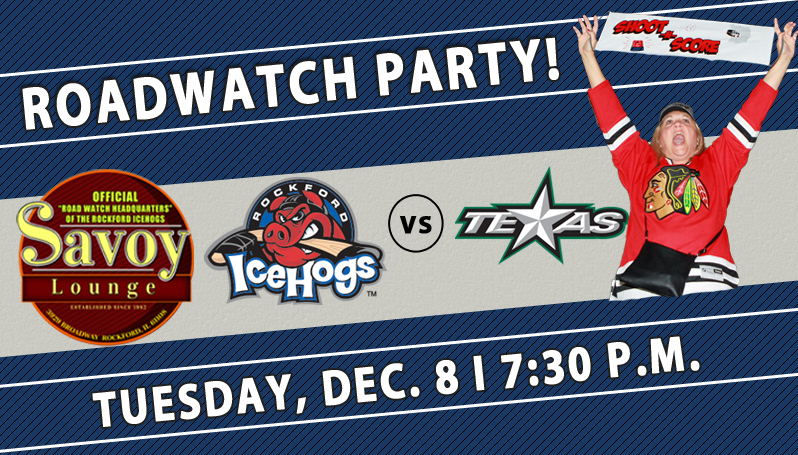 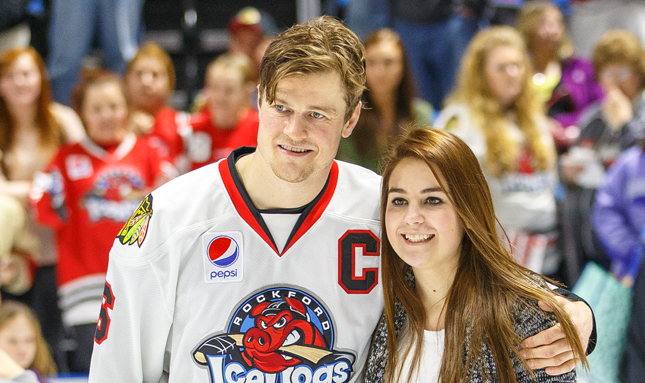 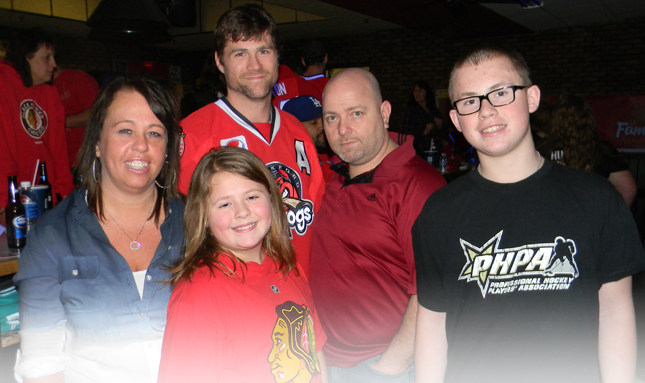 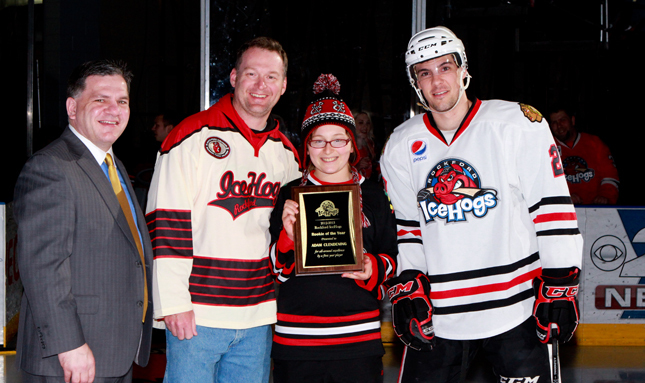 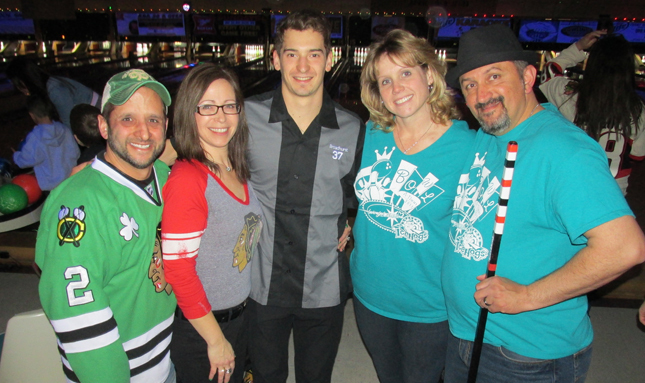 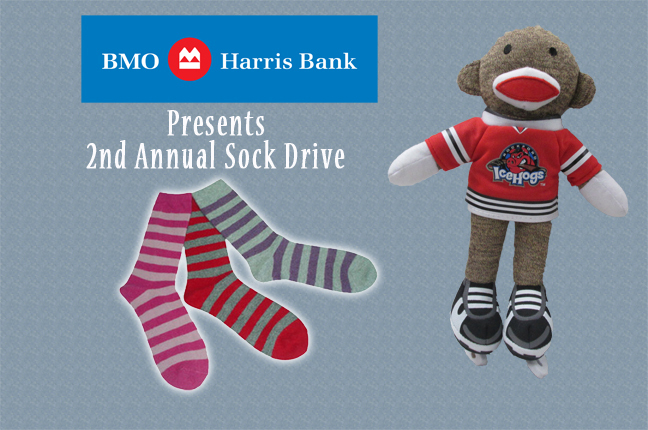 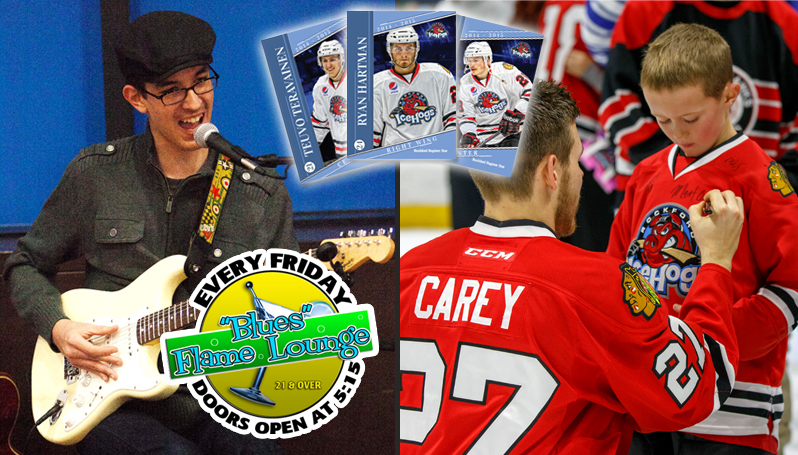 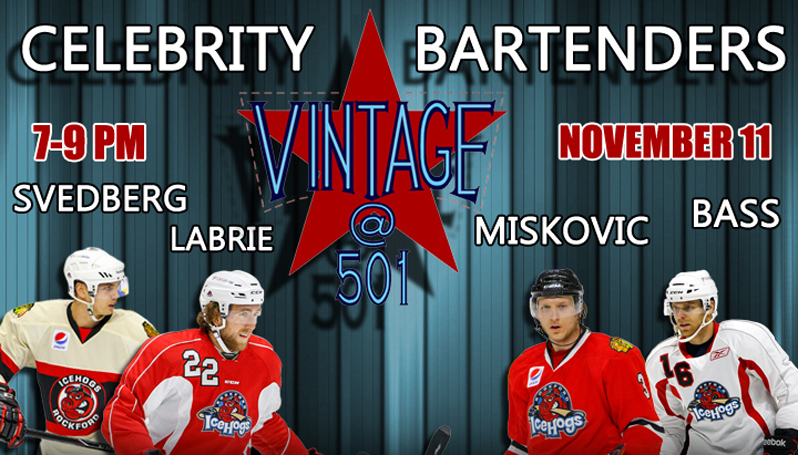 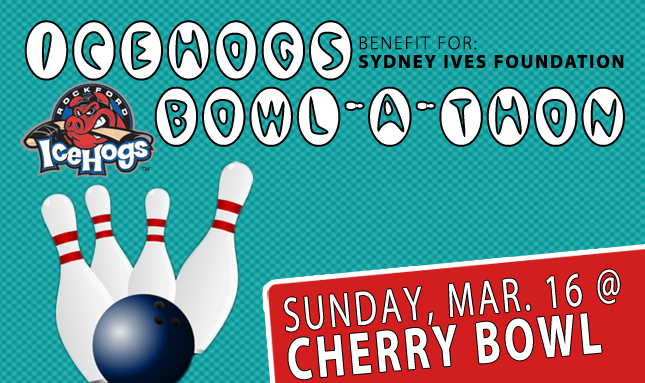 Fans can bowl alongside their favorite IceHogs players while raising money for charity. 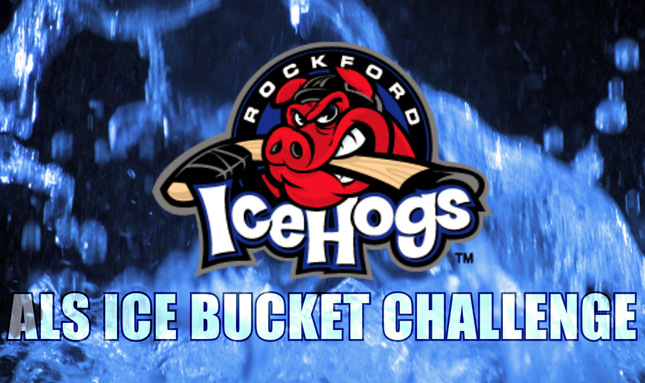 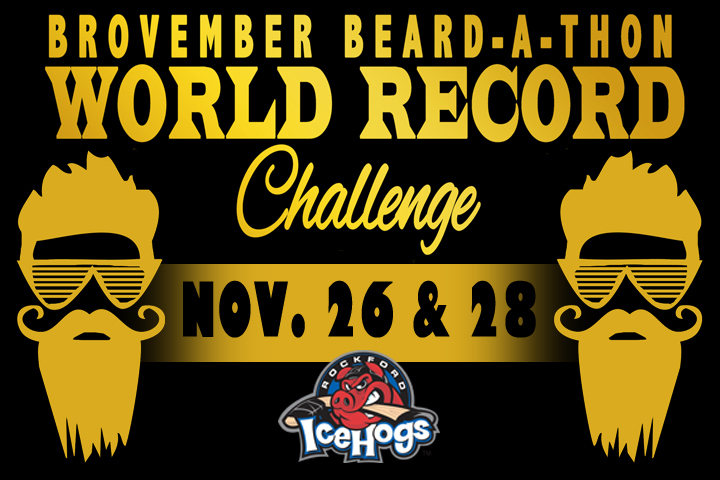 In honor of the Winter Olympics in Sochi, the Rockford IceHogs are offering a deal for the rest of the 2013-14 season’s games. 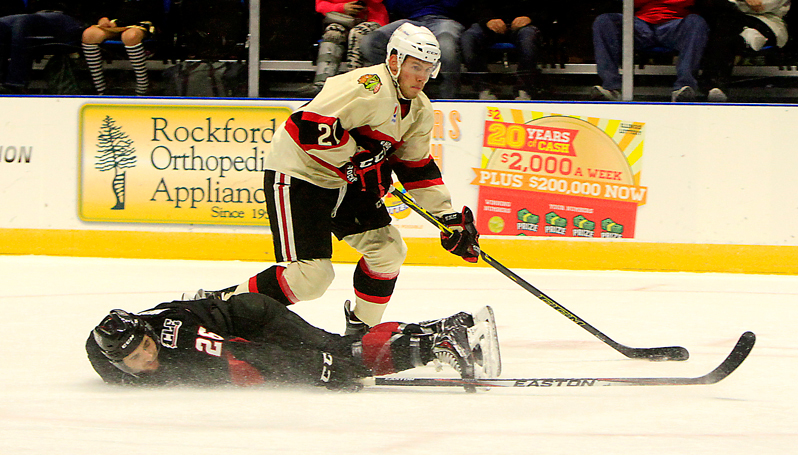 Utica, NY- The only puck to beat Rockford's Kent Simpson on Saturday night came in the first minute of play. 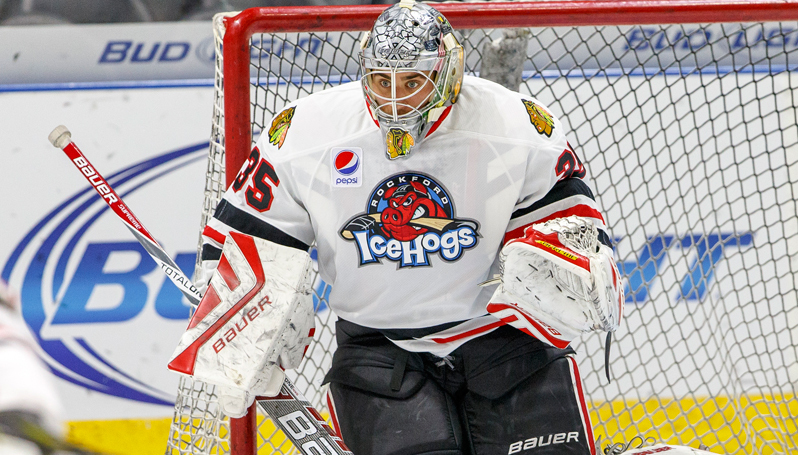 From there, the IceHogs backstop shut down the Utica Comets as the Hogs held on for a 2-1 win.